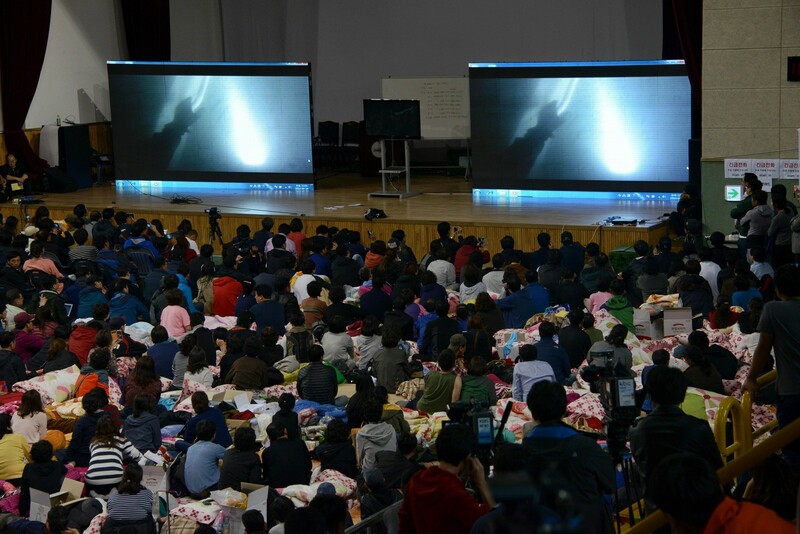 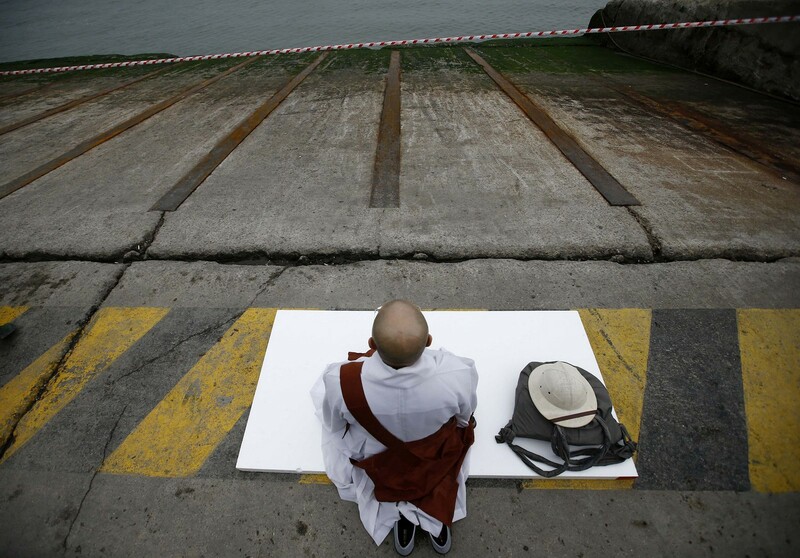 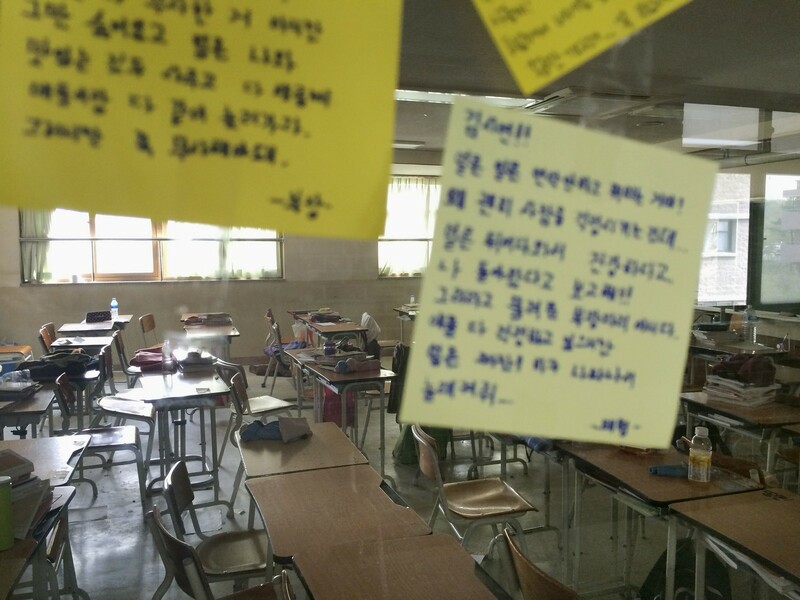 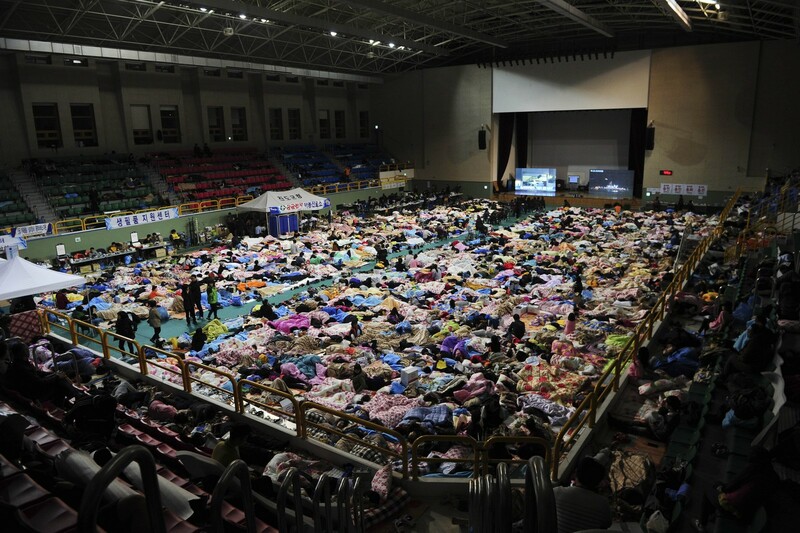 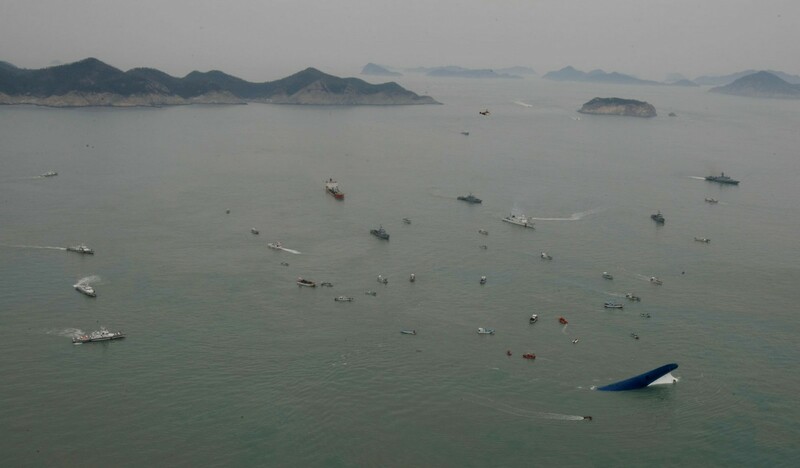 A teaser image of "Sewol X," a documentary film produced by a South Korean netizen and uploaded to YouTube. 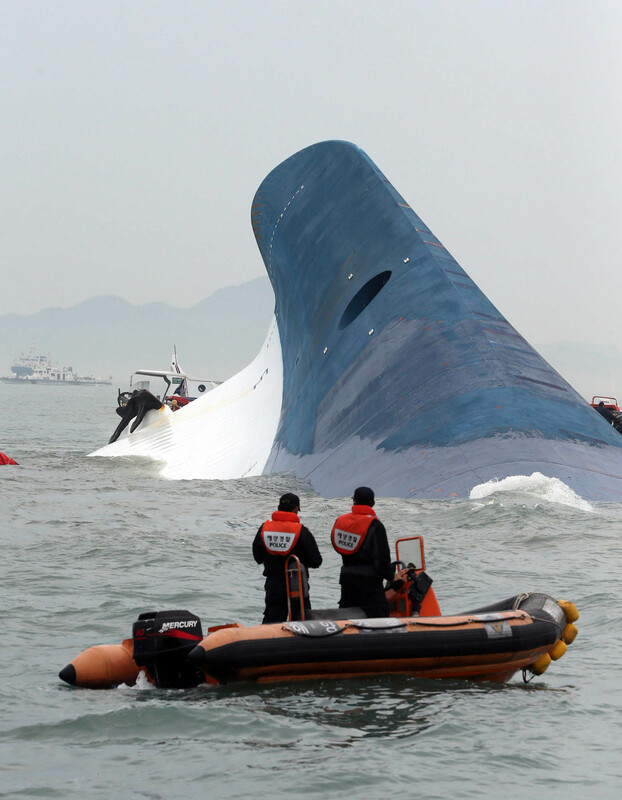 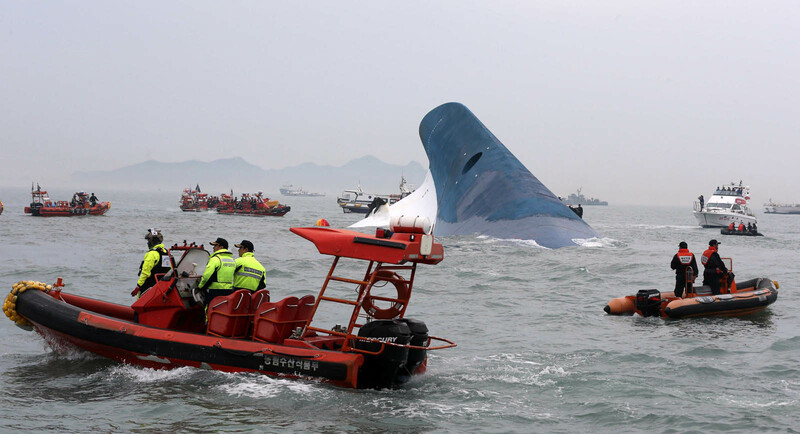 The deadly sinking of the Sewol ferry, which left 295 dead and nine missing back in 2014, may have been a result of a submarine crash, not a simple accident caused by overloaded freight, an anonymous online commenter claims in a self-directed documentary on the incident. 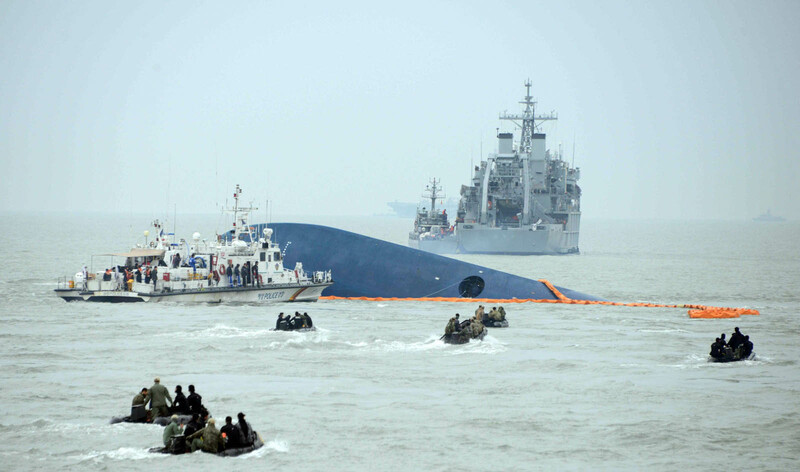 The Defence Ministry refuted the notion as a groundless suspicion. 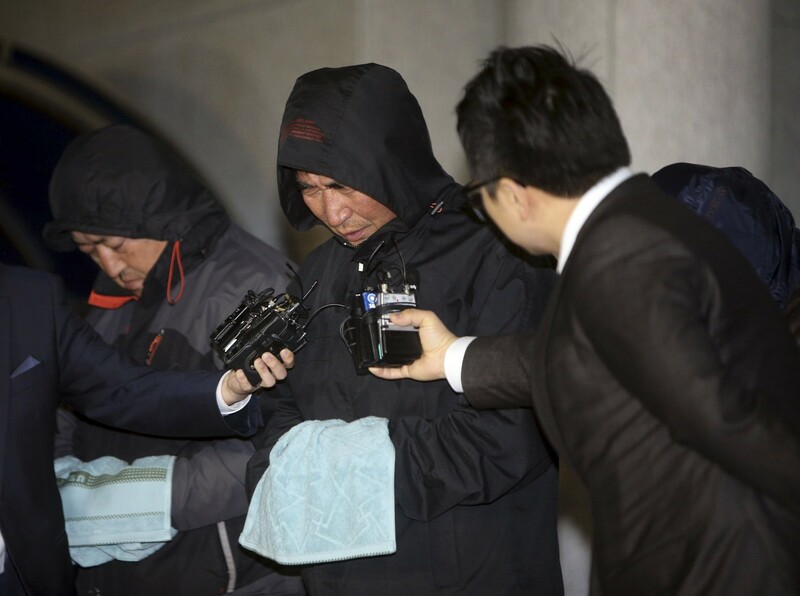 This newly raised allegation further kindled widespread speculation that President Park Geun-hye neglected her duty as state supervisor and was receiving cosmetic procedures on the day of the tragedy -- allegations the ongoing parliamentary probe committee and special investigators are still seeking to prove. 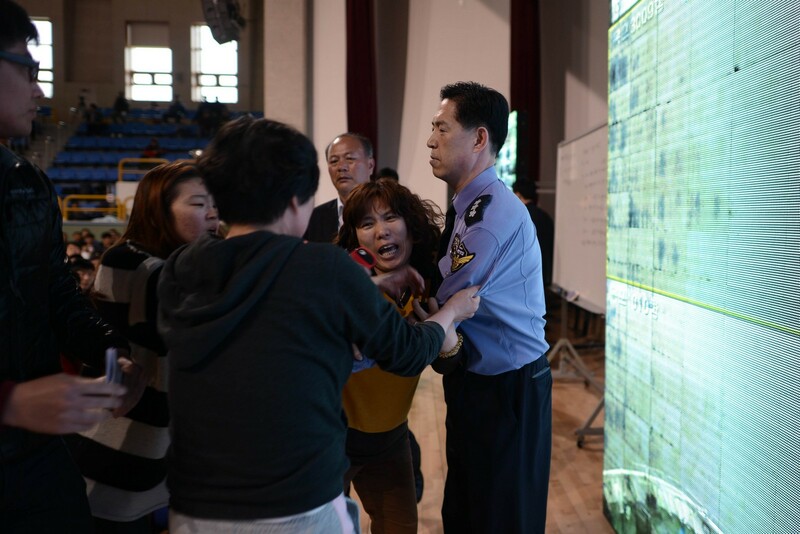 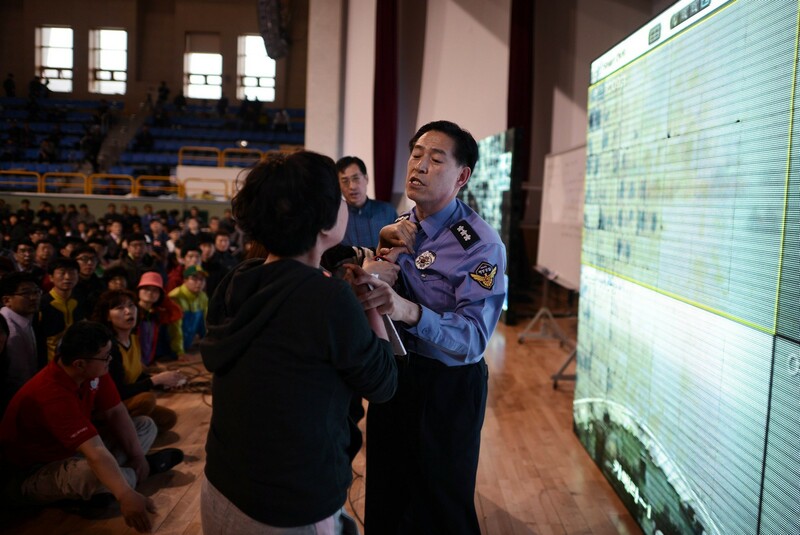 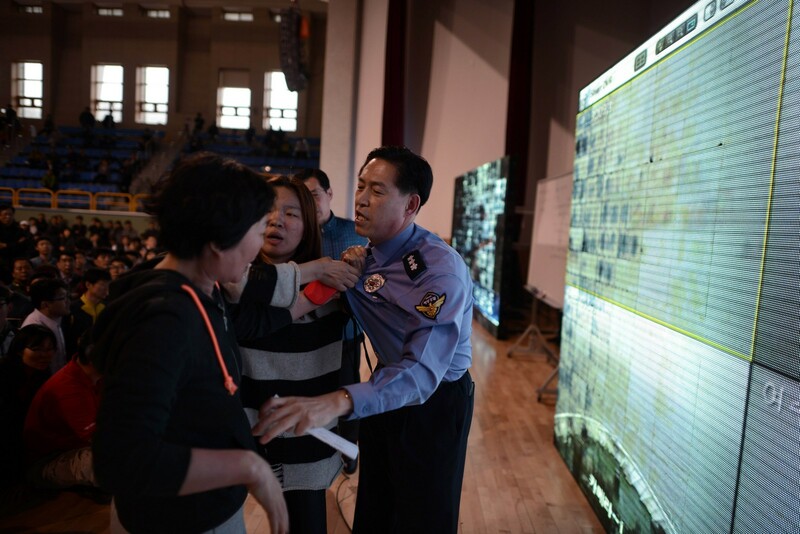 A Facebook account named "Zaro -- Netizens' investigation team" stirred the interest of the public and media as it released via YouTube a documentary eight hours and 49 minutes long, which it claimed to "contain the hidden, unbiased truth" behind the April 16, 2014 tragedy. 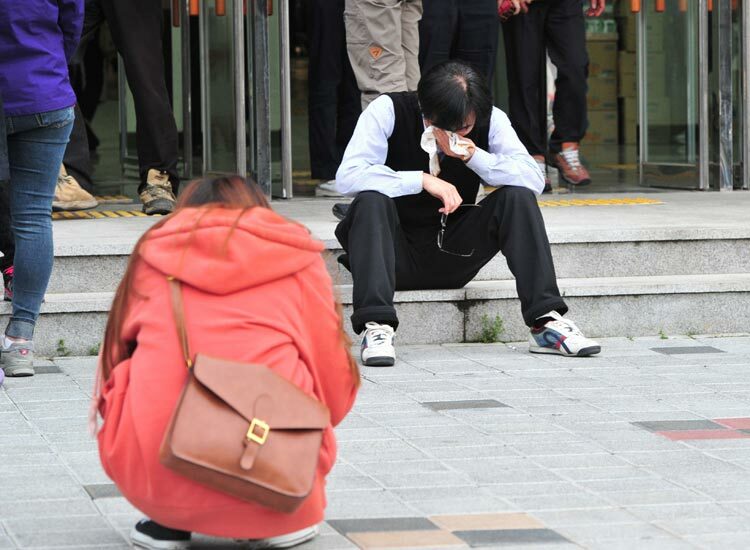 The anonymous online operator, said to be a man in his 40s, has been known for in-depth investigations into high-profile irregularity cases. 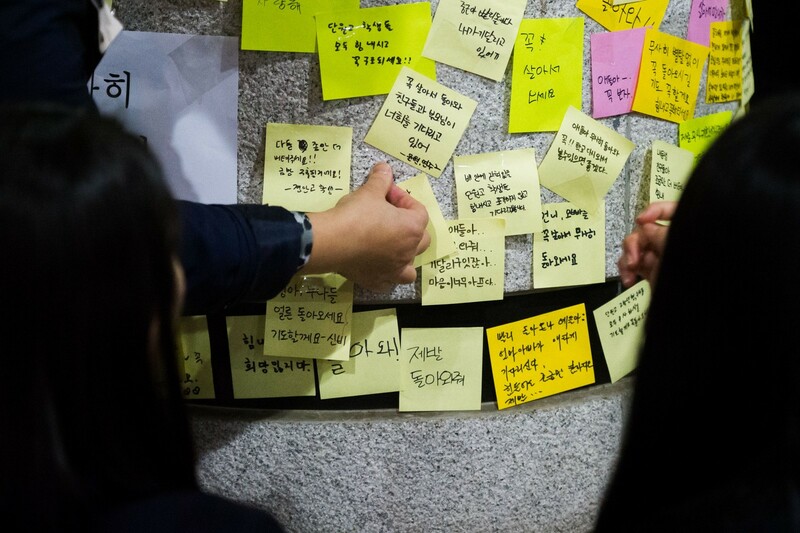 The name "Zaro" came into the spotlight when the user came up with tangible evidence in 2013 that the nation's spy agency had rigged online comments prior to the 2012 presidential election. 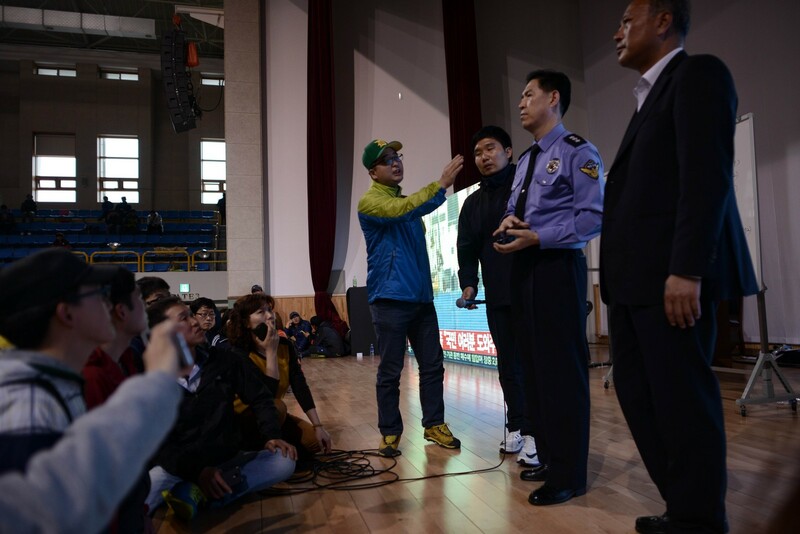 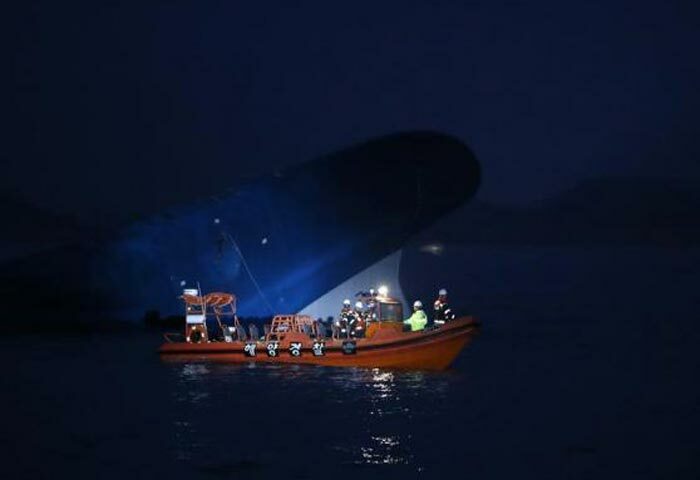 "I refuted all four reasons the prosecution suggested as causing the Sewol ferry," said the user Monday in a radio interview with CBS. 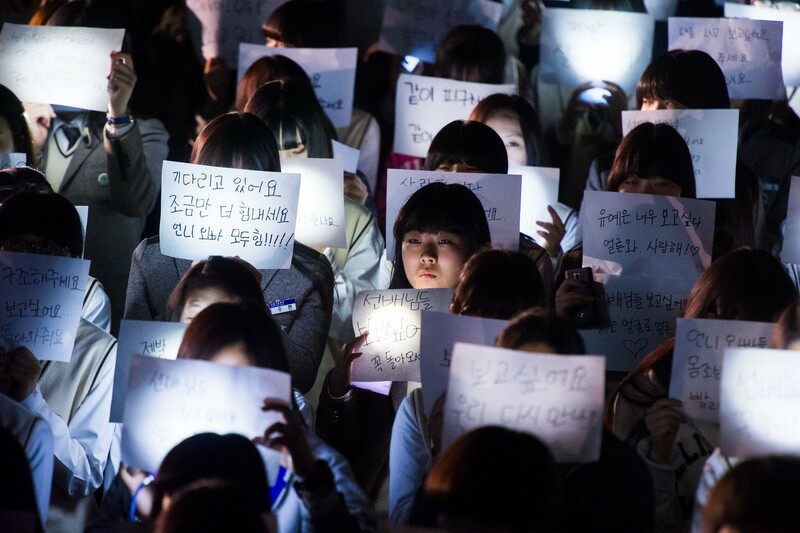 "My only intention is to seek the truth, without taking sides with anybody or being swayed by any prejudice." 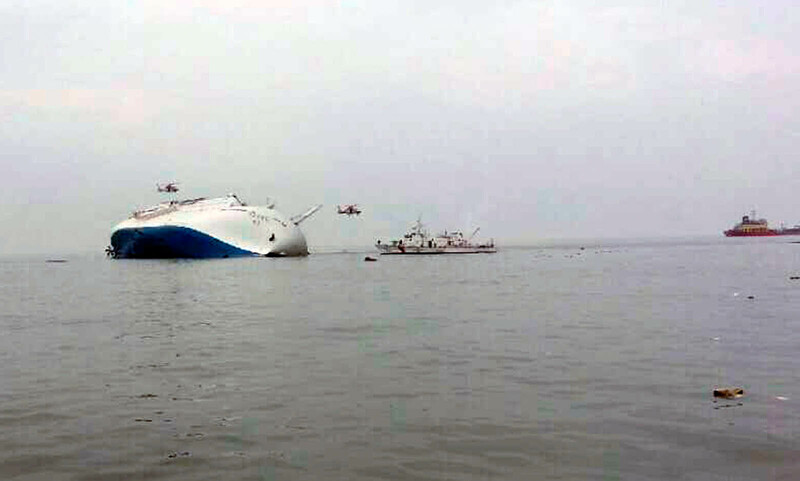 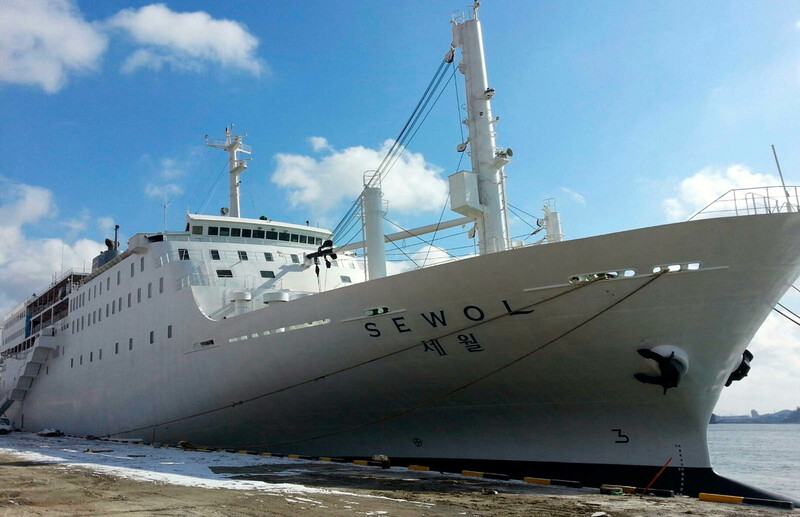 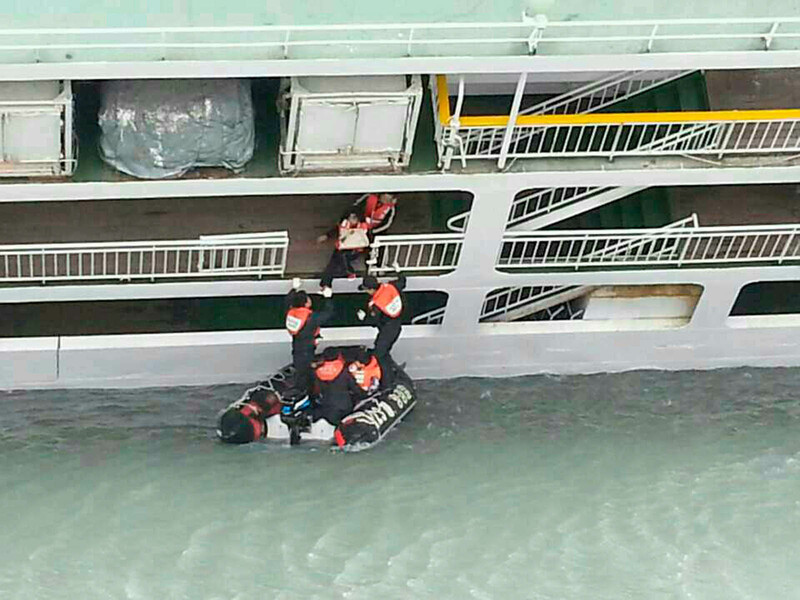 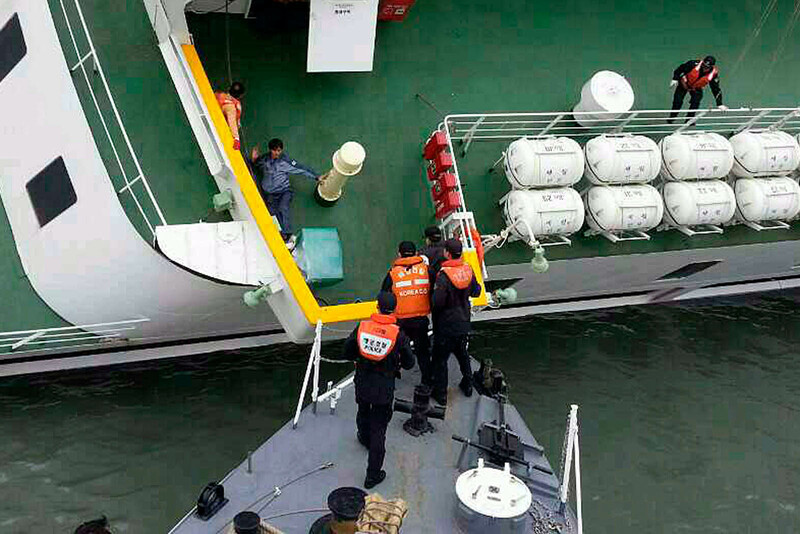 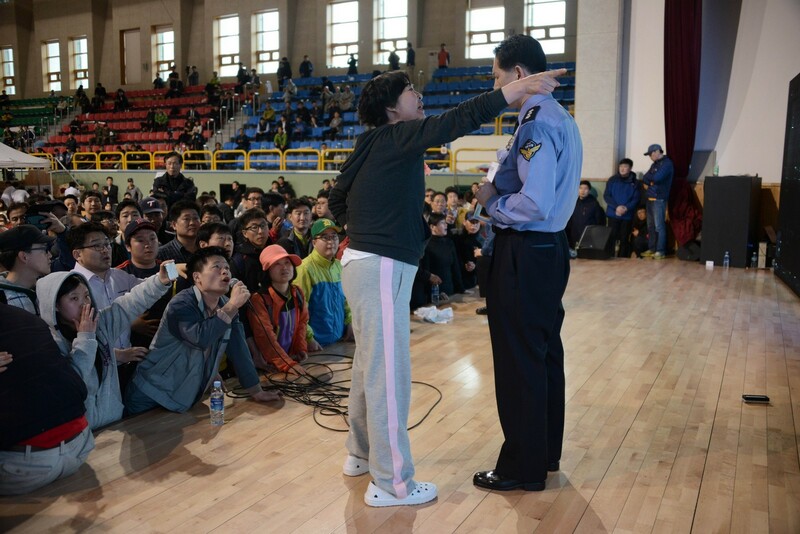 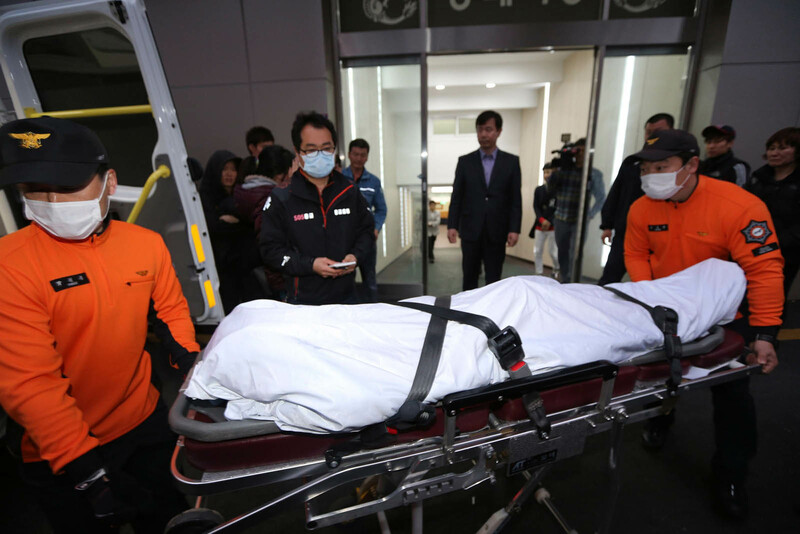 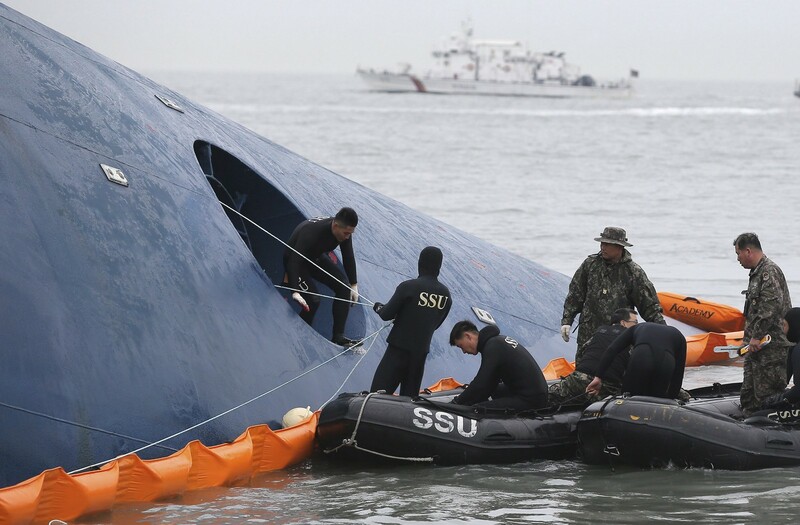 Prosecutors earlier announced the causes of the accident were overloaded freight, displacement of cargo, the staff's lack of experience and the outdated facilities of the ship -- thus eschewing outside factors. 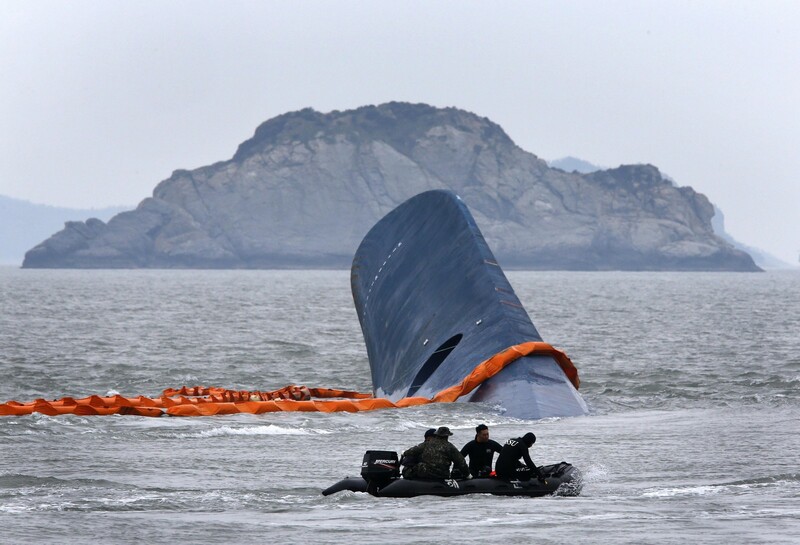 The private investigator, however, claimed a misdirected submarine collided with the unfortunate ferry that day and the Navy attempted to conceal the truth for the sake of reputation. 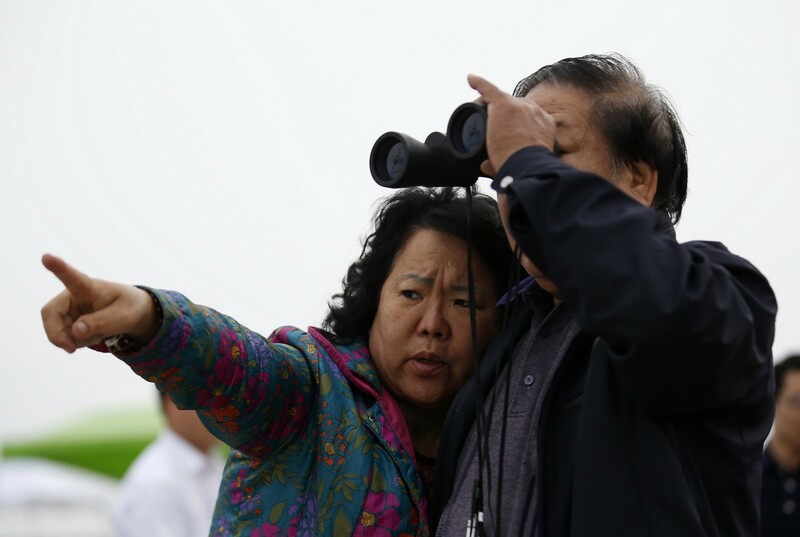 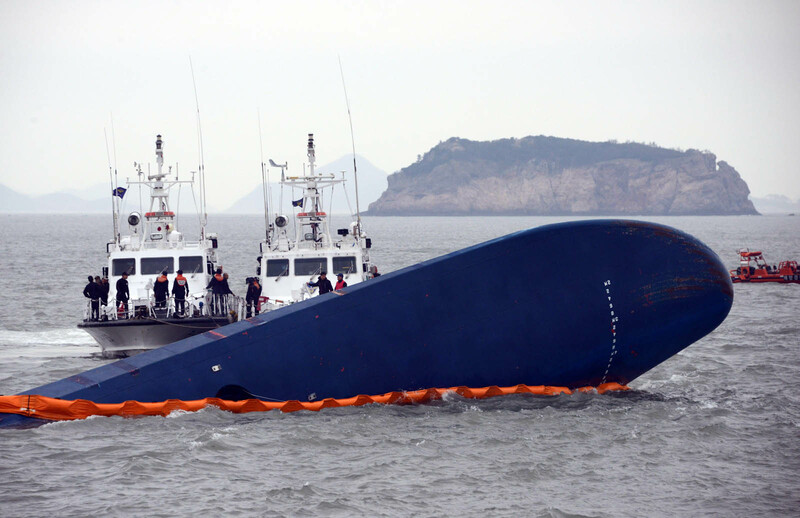 "The radar scope at Jindo's vessel traffic service centre caught sight of an orange object, which experts saw as a freight container (falling out of the tilted ferry)," he said. 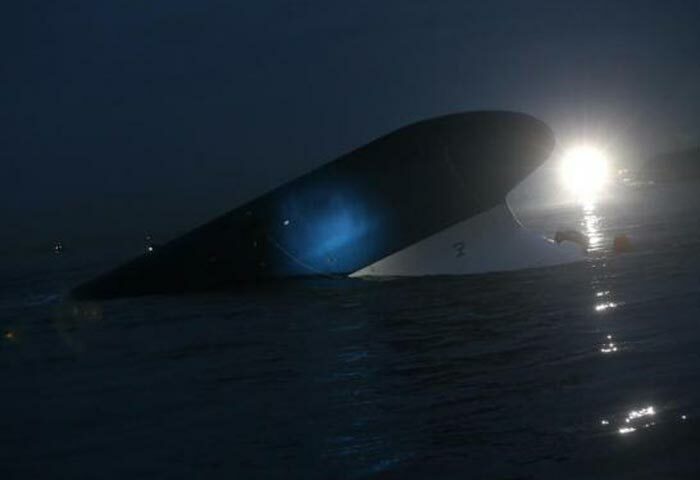 But at the time, the ship was not tilted enough, so the unidentified object may have been neither a container nor any other structures on the scene, according to Zaro. 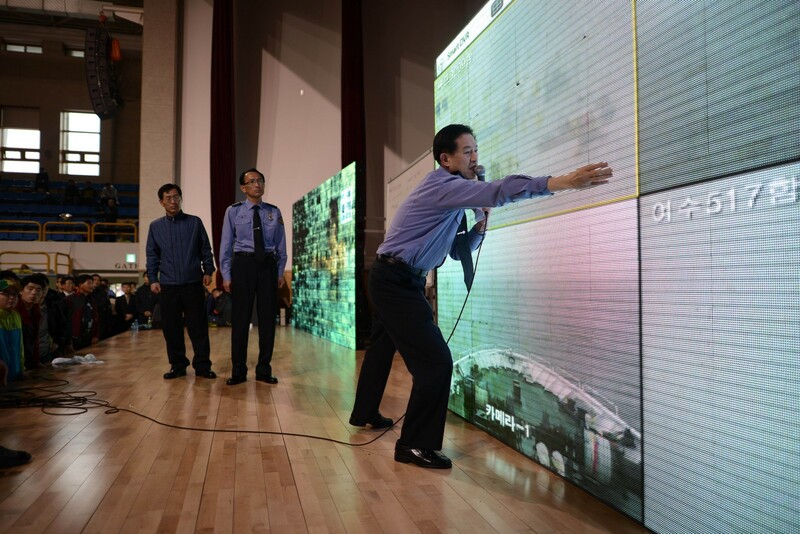 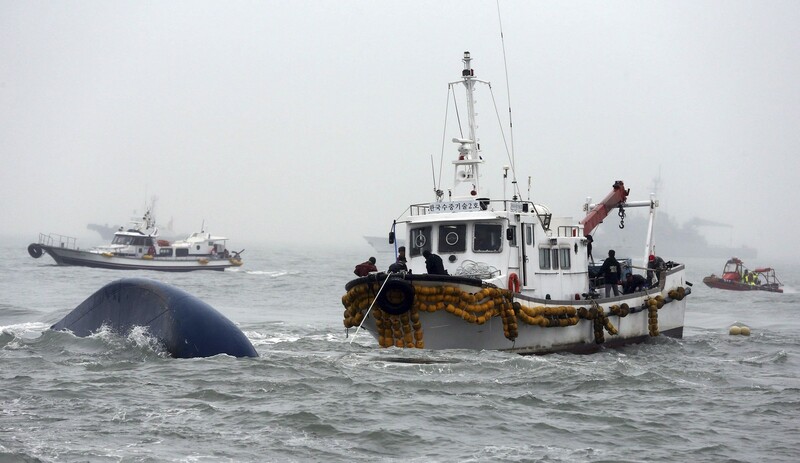 He also pointed out that the sailing track of the sunken ferry did not match conventional tracks, pointing to an outside factor such as a submarine collision. 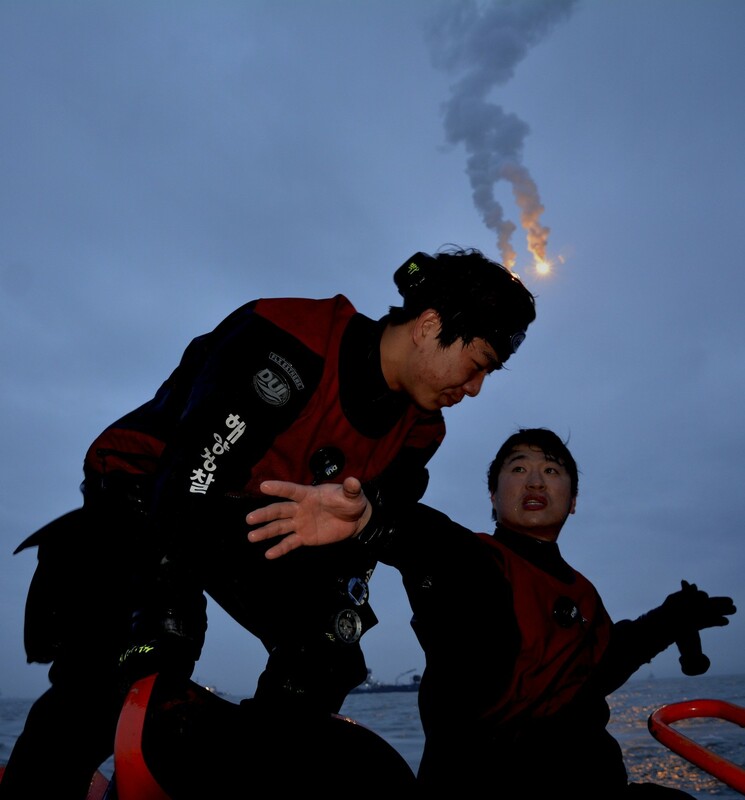 "Several of the survivors testified to a crashing sound hitting on the vessel before it started tilting, and two of them were at the time located near the port, suggesting a physical shock on the outside of the underwater port," Zaro said through his documentary clip. 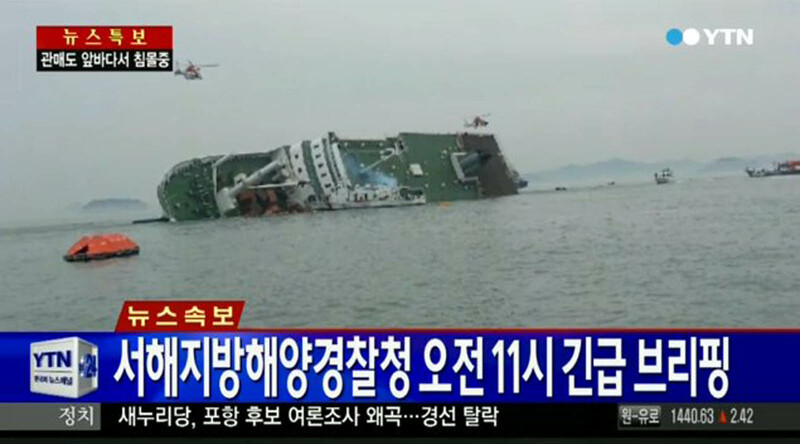 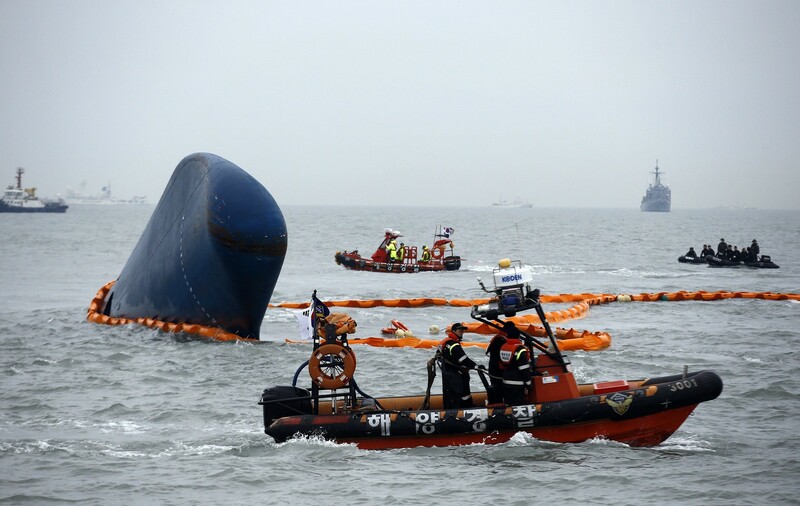 To back his submarine collision theory, the investigator quoted Kim Kwan-mook, a nanoscience professor at Ewha Womans University. 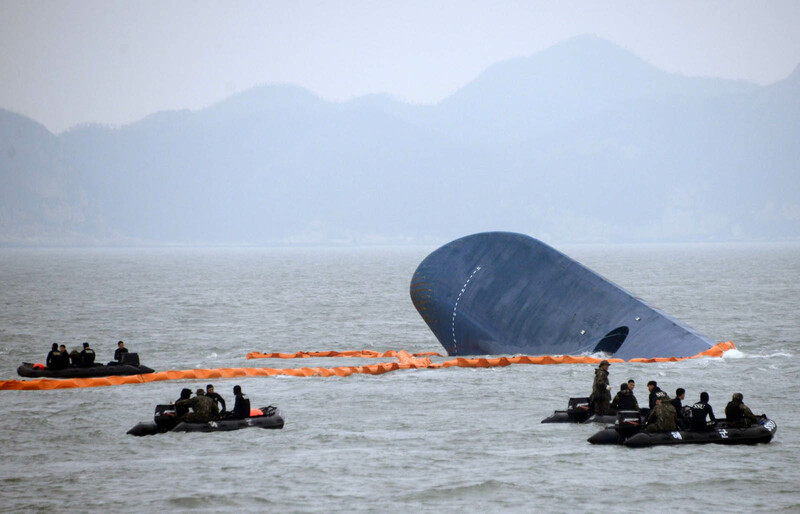 The operator then added a hypothesis: the Navy may have concealed the submarine crash, so as to keep its safety record intact. 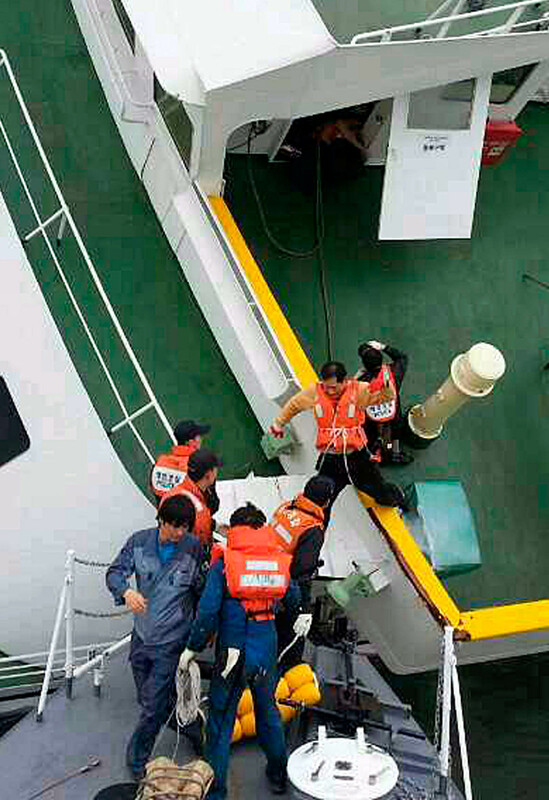 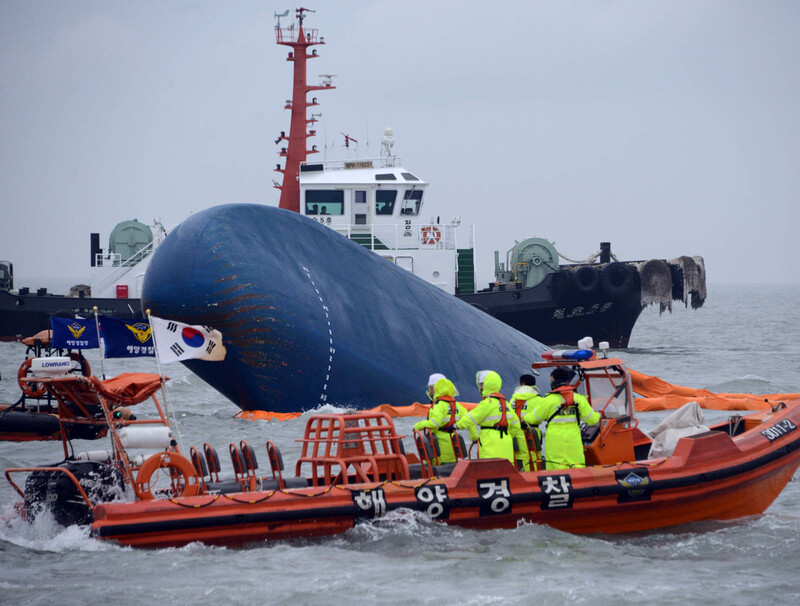 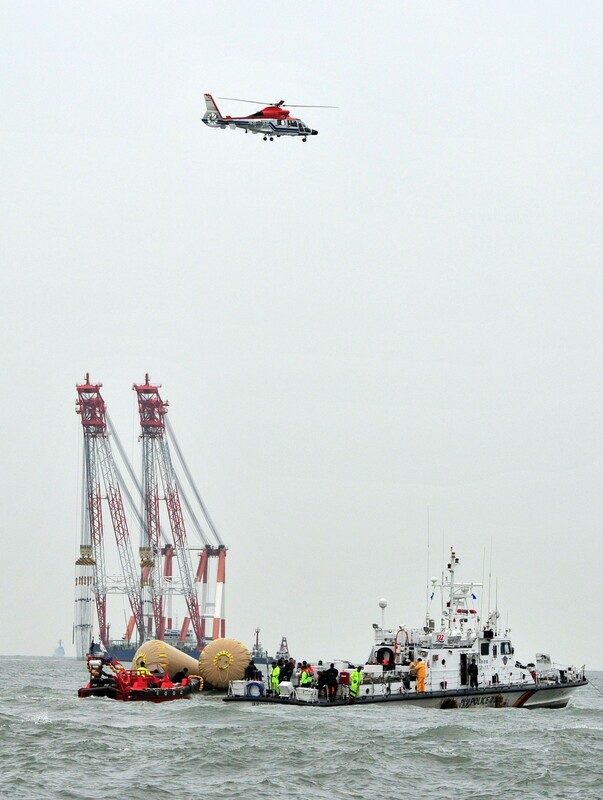 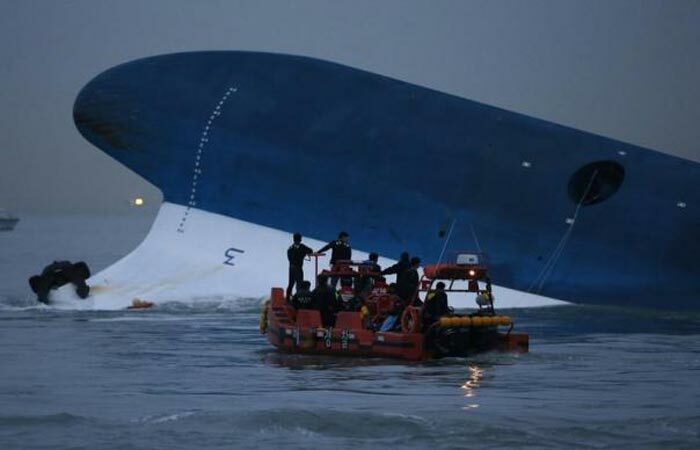 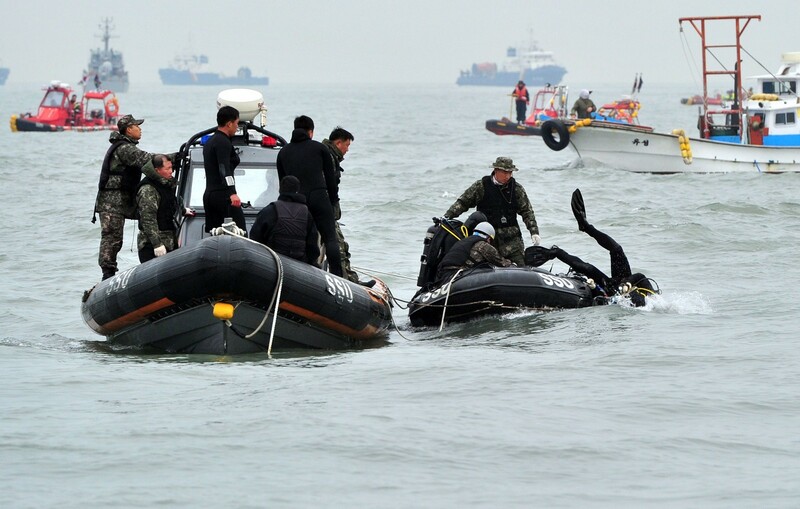 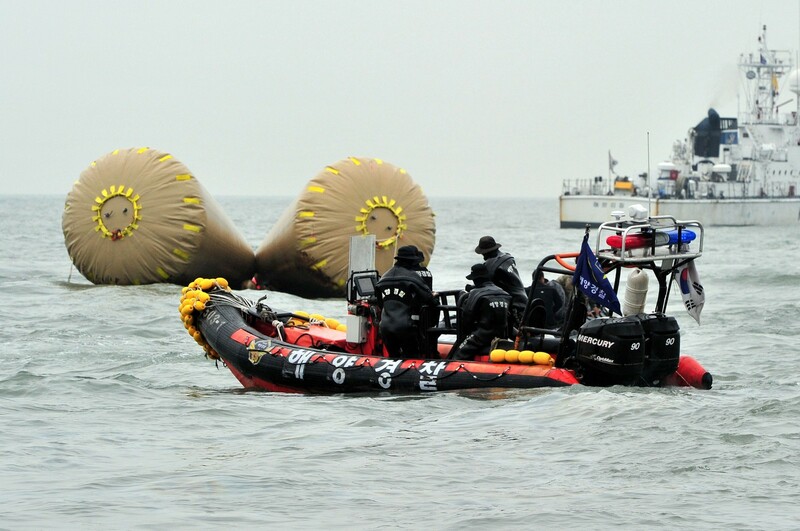 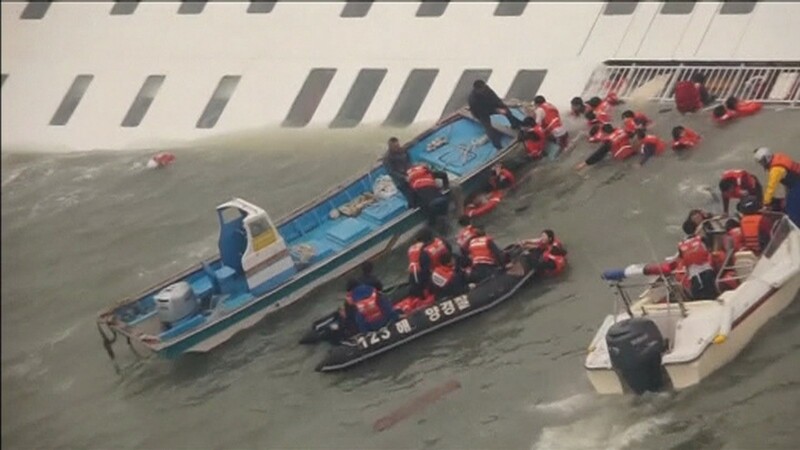 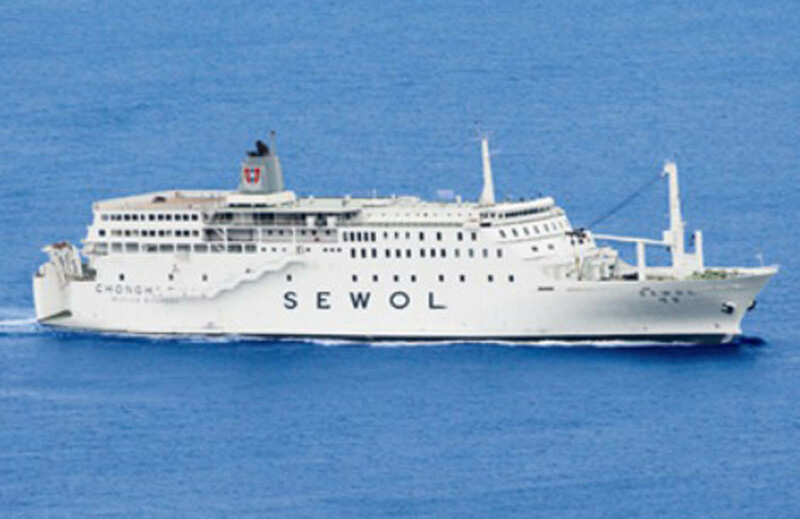 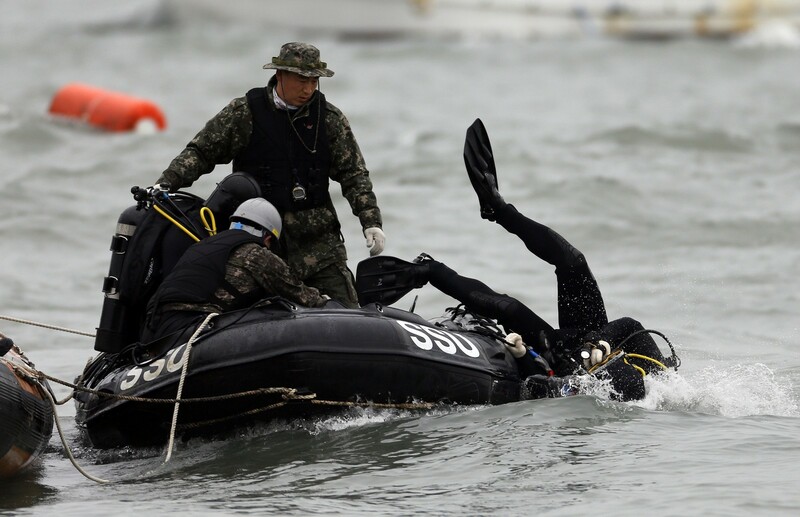 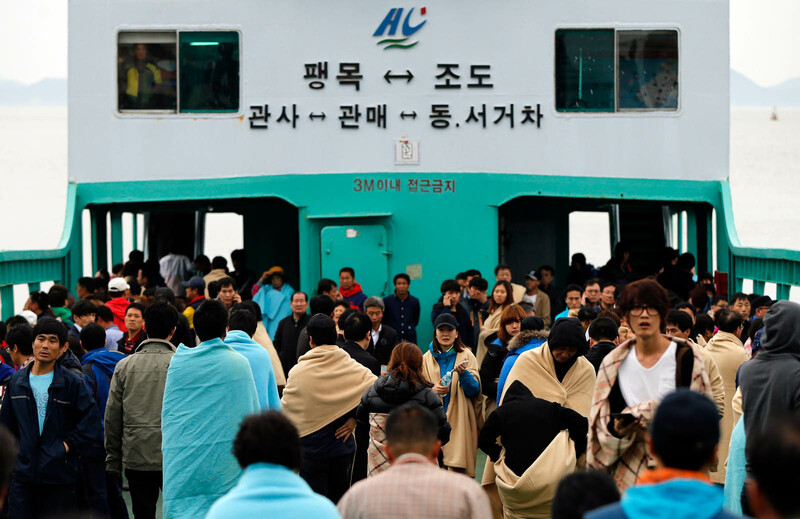 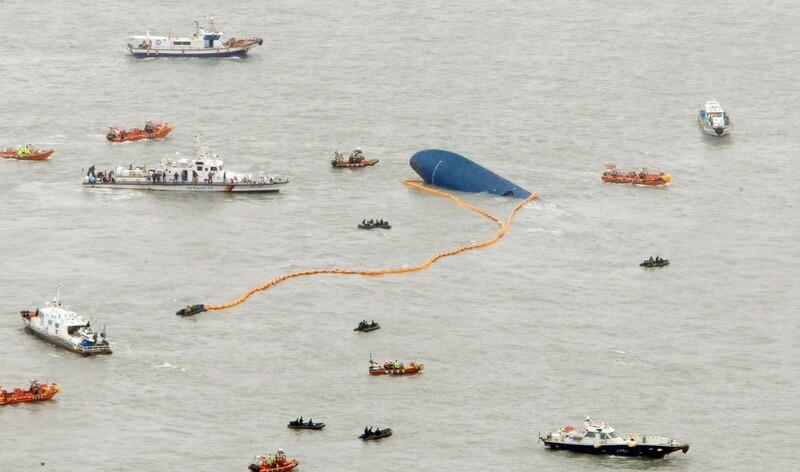 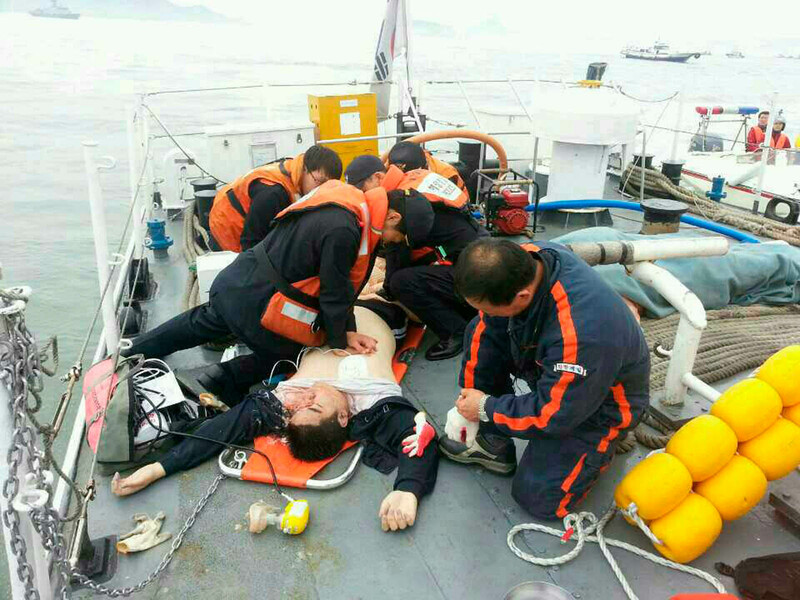 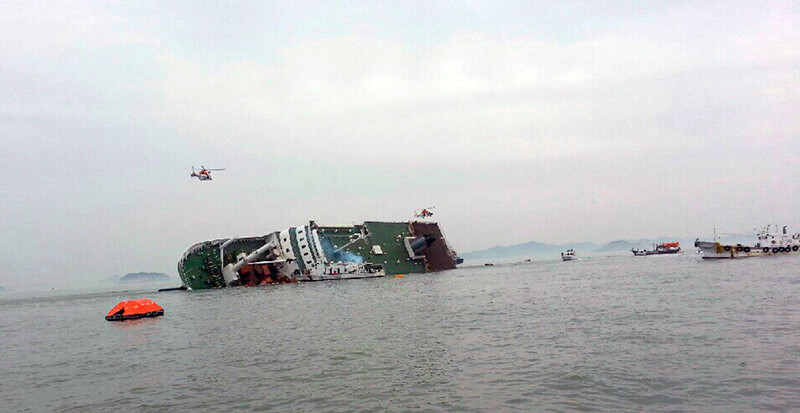 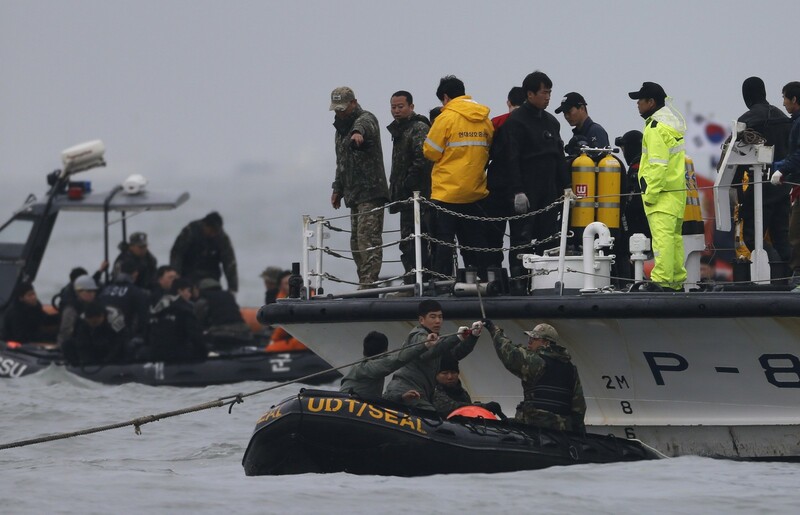 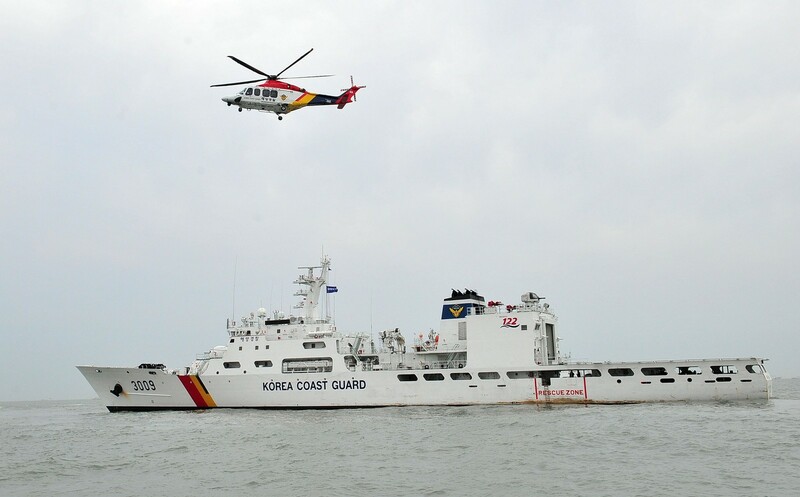 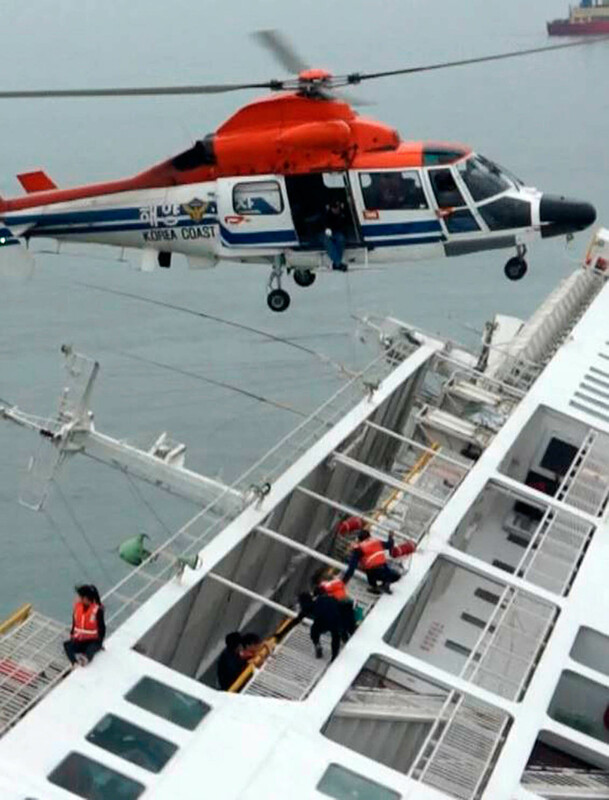 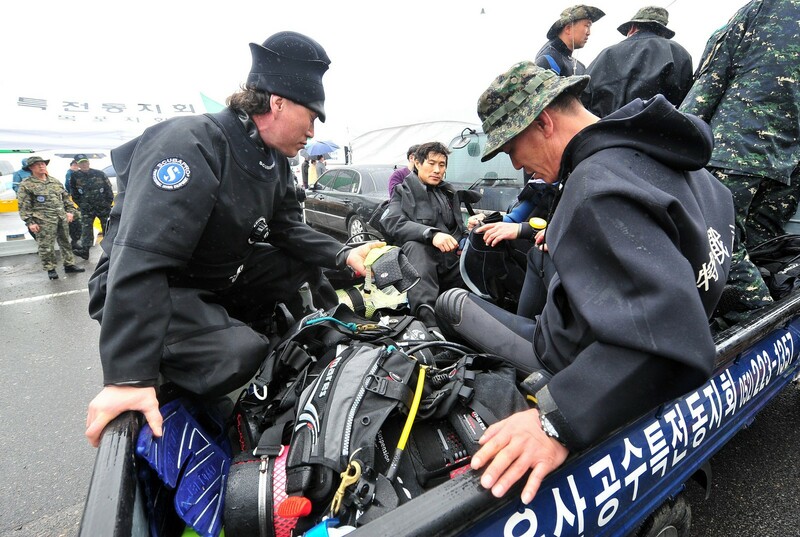 The South Korean Navy, in the year following the ferry accident, established a new record of sailing 23 years without accident. 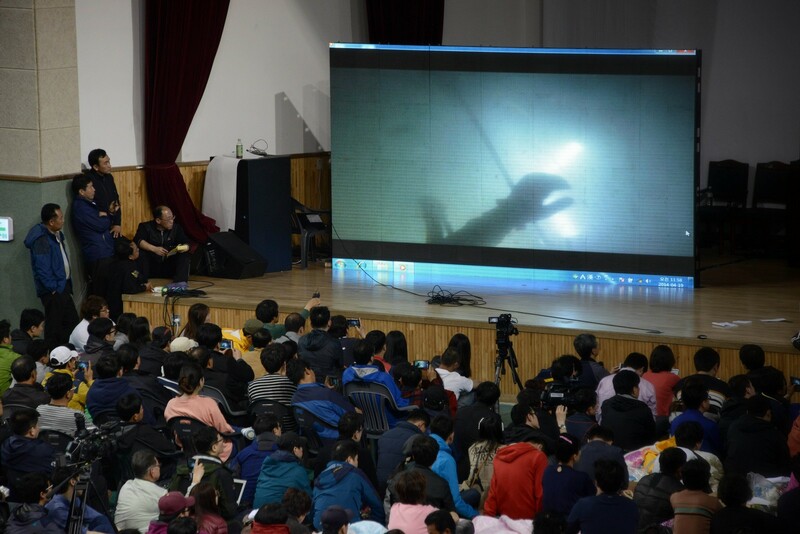 "This unprecedented record and reputation leads to an economic effect of at least several trillions of won, and I couldn't help but wonder if this was what delayed the rescue actions or what deterred the president from revealing further details of that day," he said. 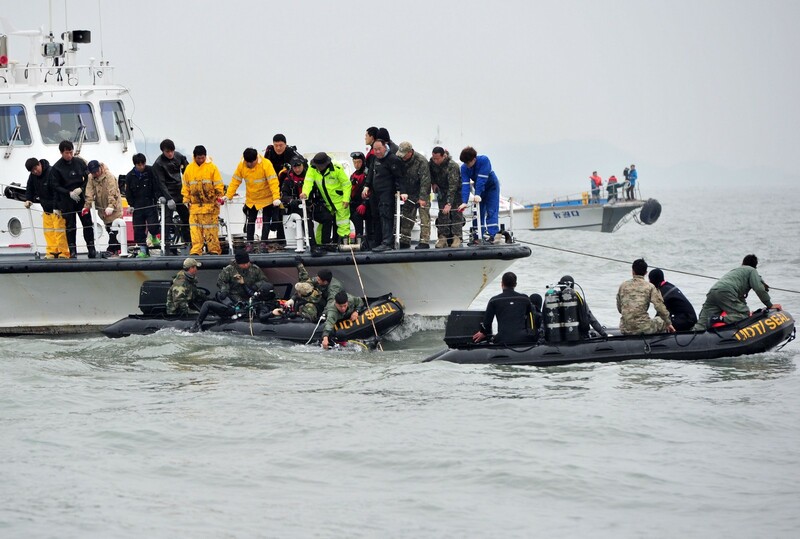 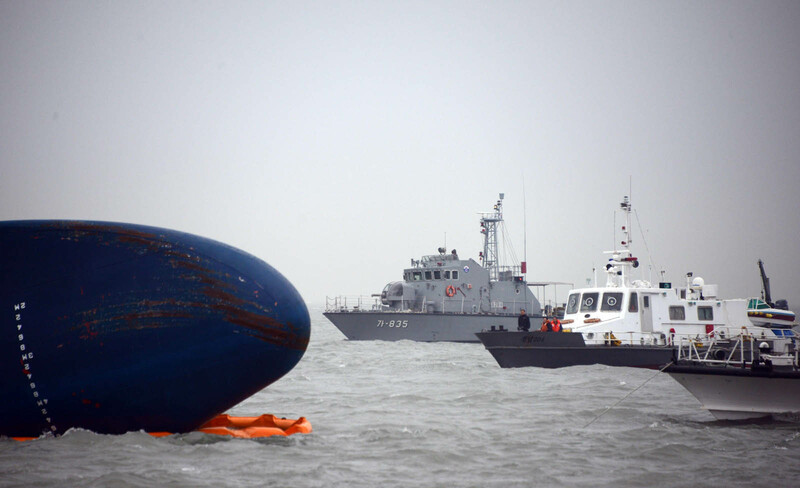 Officials immediately denied the allegations, claiming there were no military operations or drills in the nearby waters on the day of the accident. 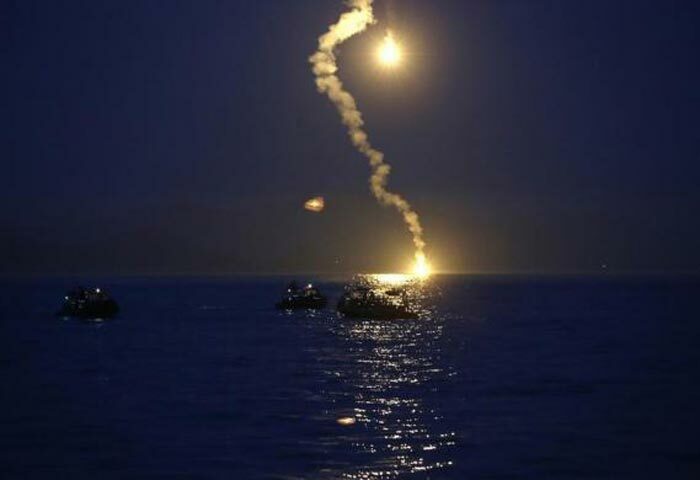 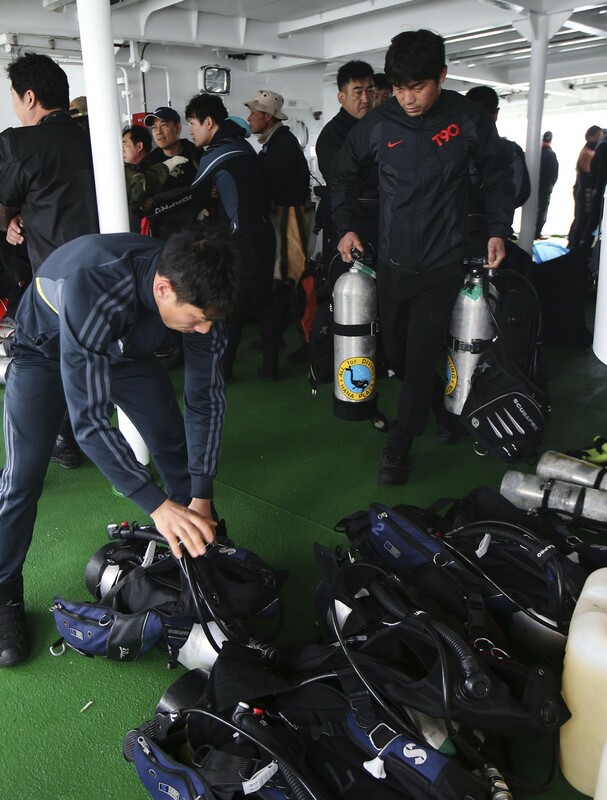 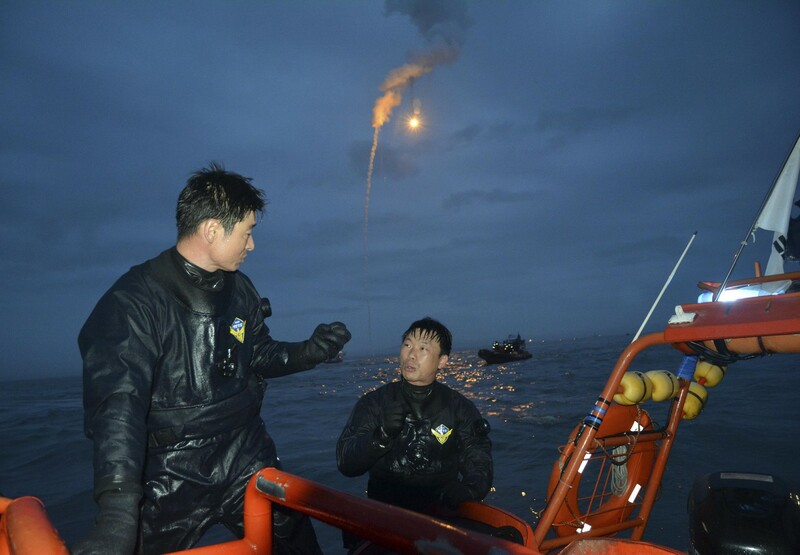 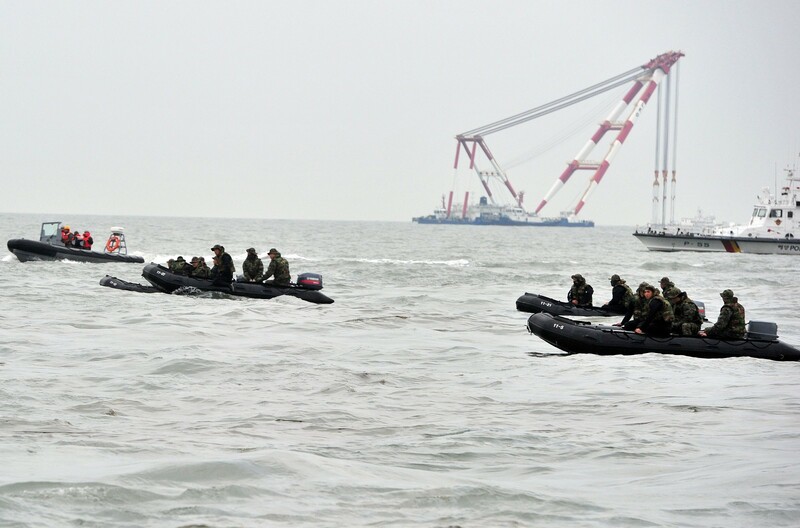 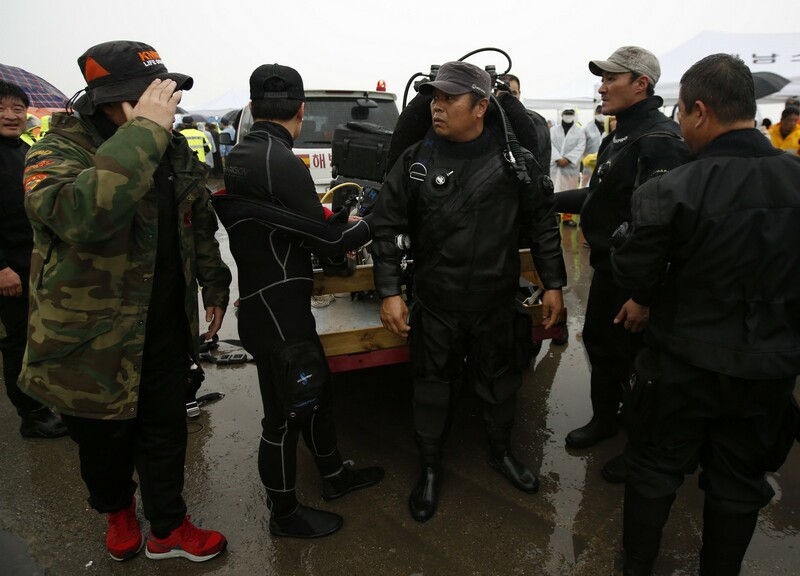 "The waters were 37 meters deep on average and not suitable for submarine action," said Defence Ministry spokesperson Moon Sang-gyun on Monday. 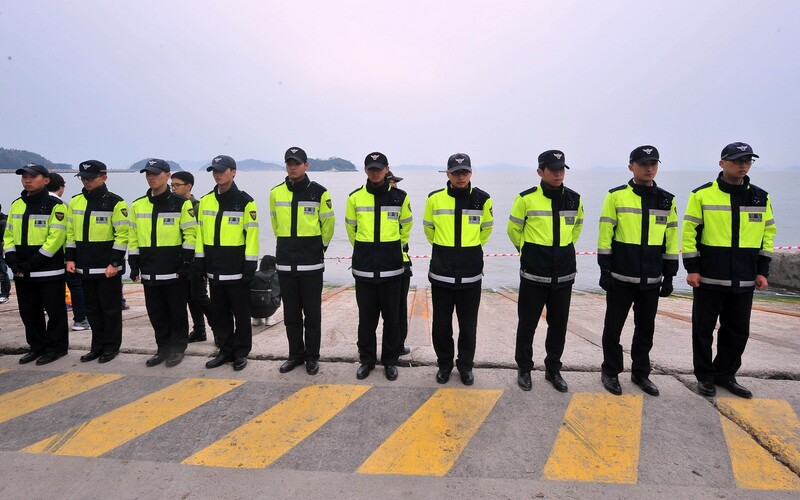 But when requested to reveal the corresponding radar recordings, the official merely reserved his stance, saying he would "check whether the given records still exist." 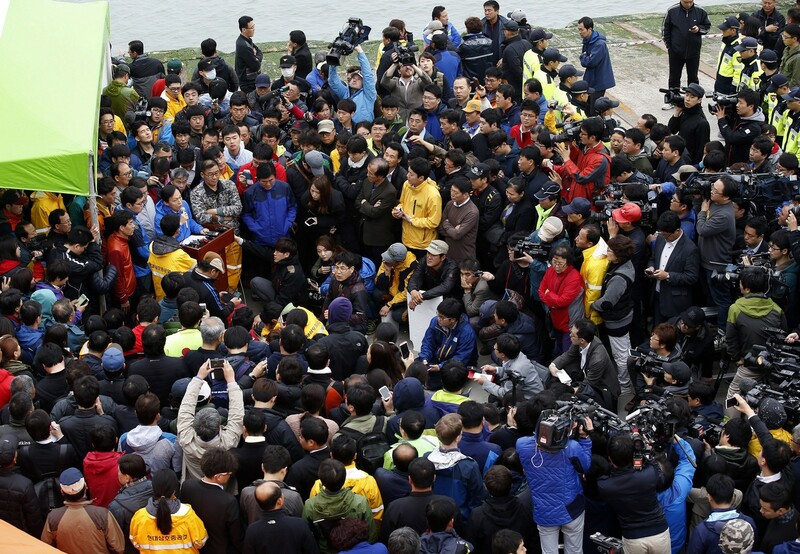 Meanwhile, President Park Geun-hye and investigators remain gridlocked over Park's actions during the seven hours during which she remained out of public sight on the day of the ferry's sinking. 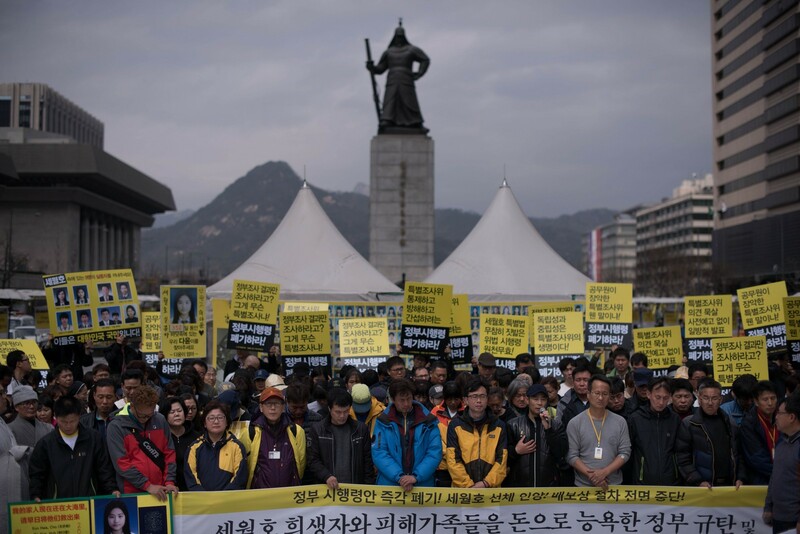 The Constitutional Court, which is deliberating on Park's impeachment resolution, had demanded last week that the president submit a detailed timeline by Tuesday to answer the doubts. 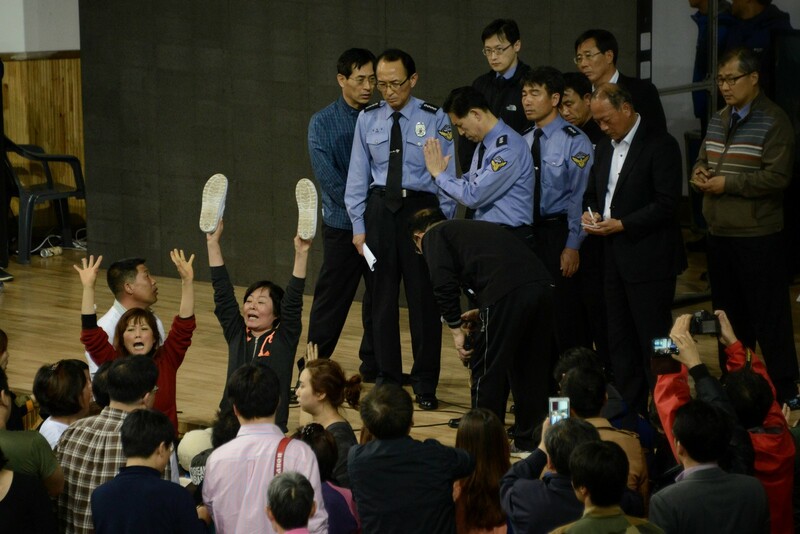 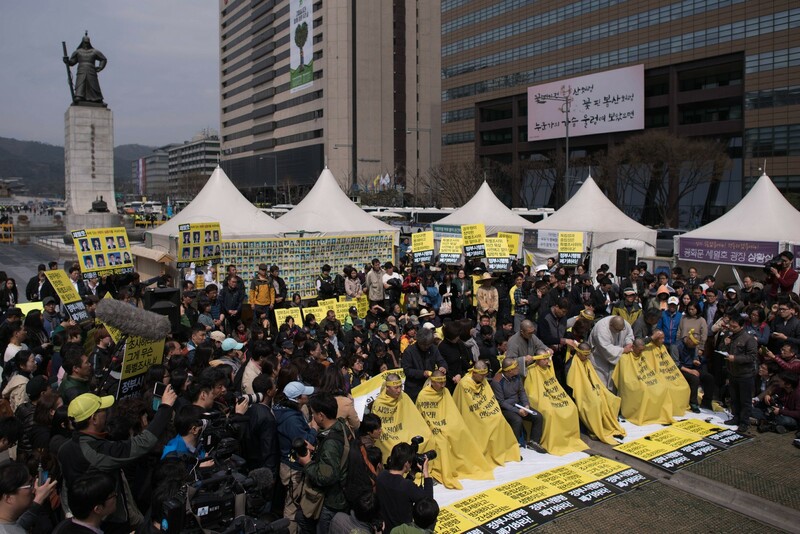 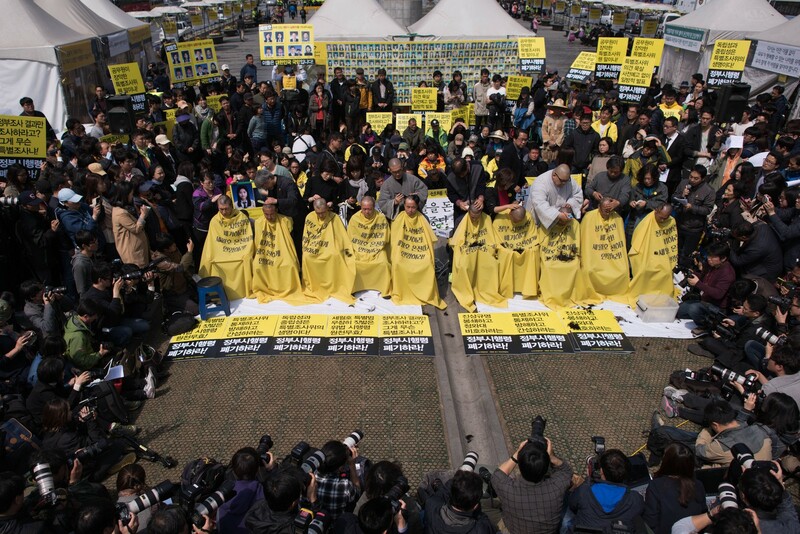 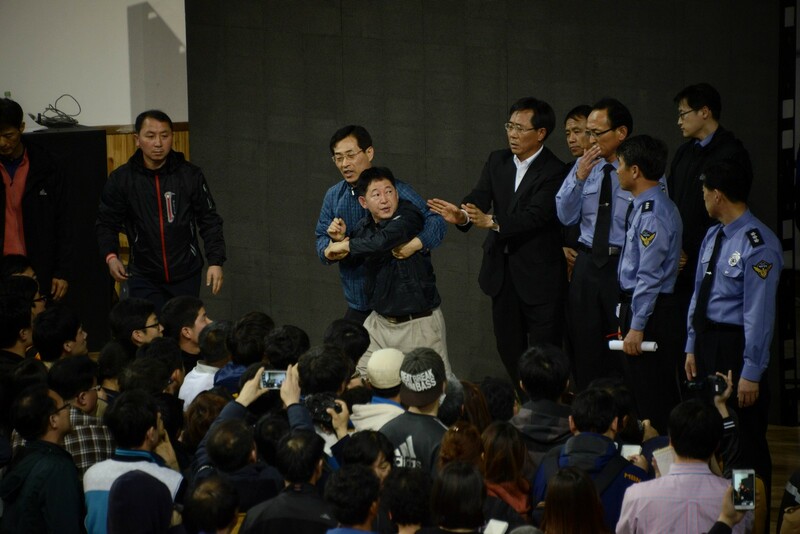 Around 50 mothers and fathers of victims of last year's South Korean ferry disaster had their heads shaved in central Seoul on Thursday, to push demands for an effective and genuinely independent inquiry. 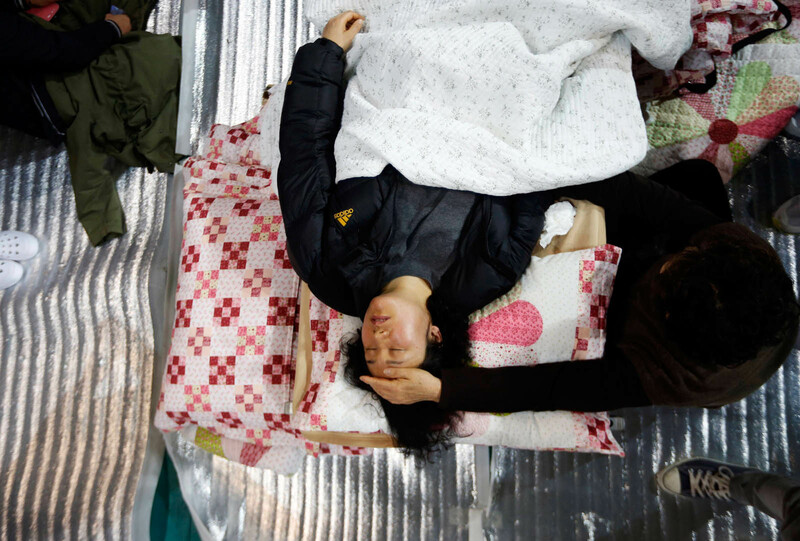 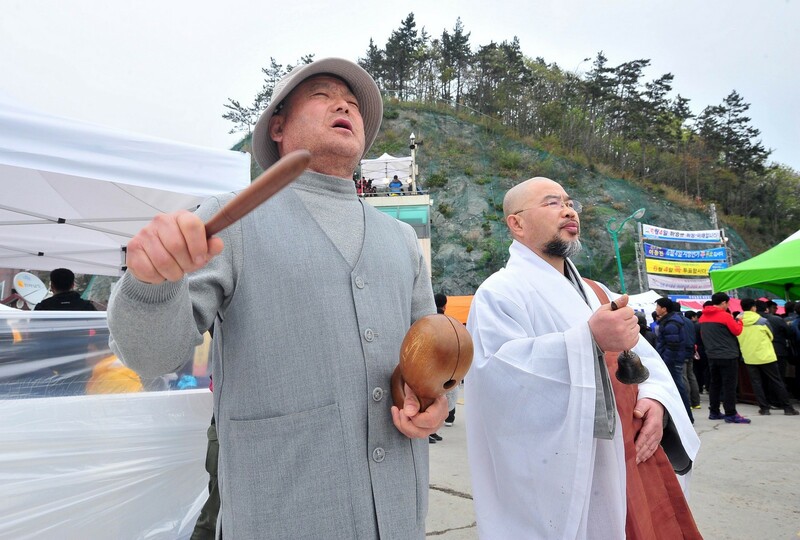 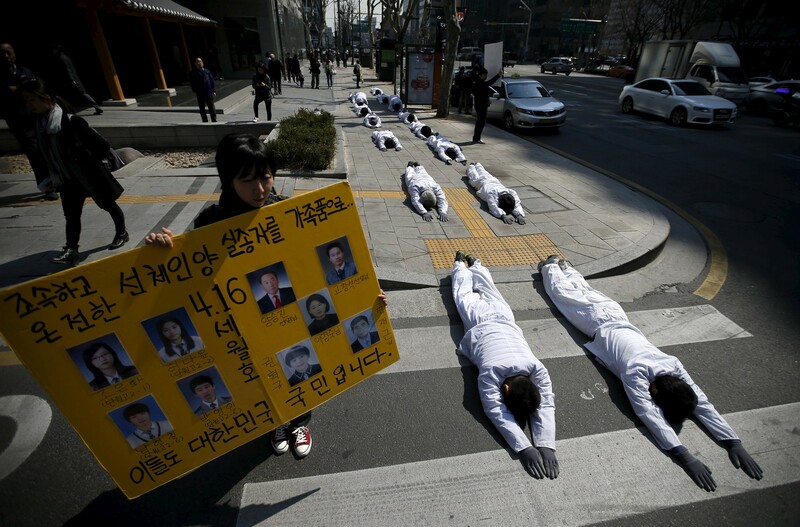 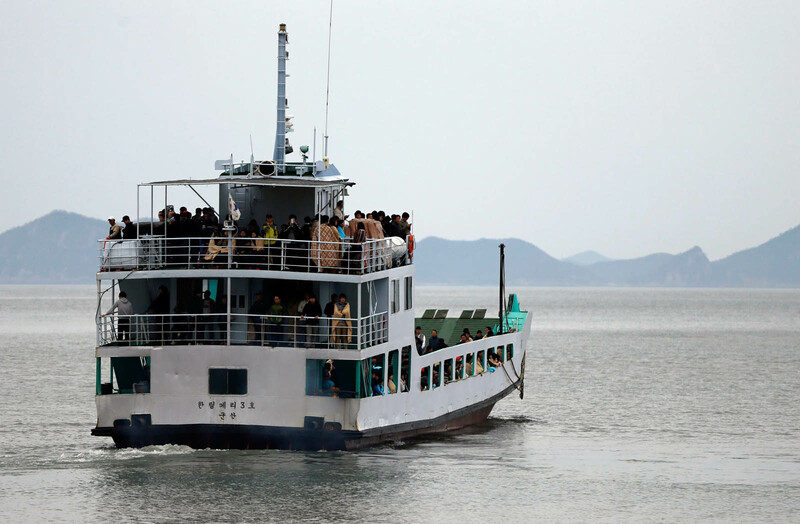 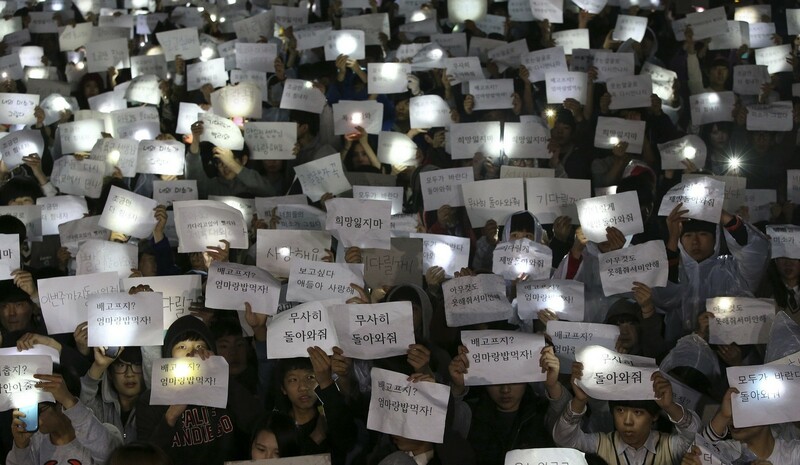 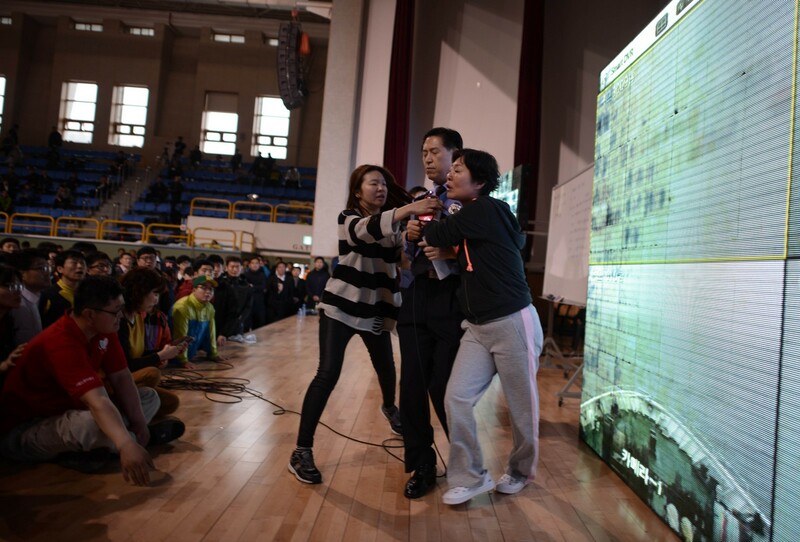 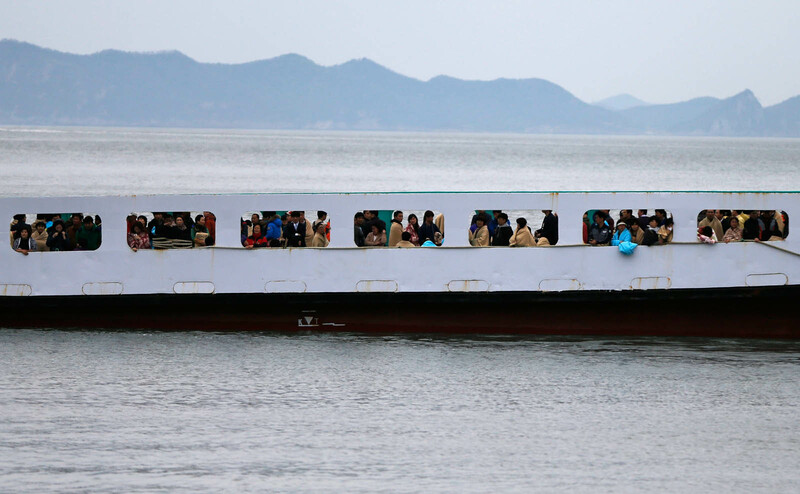 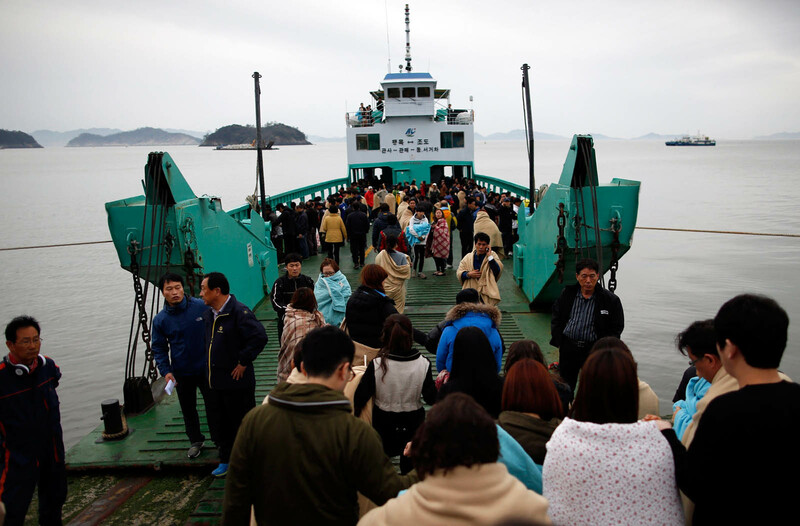 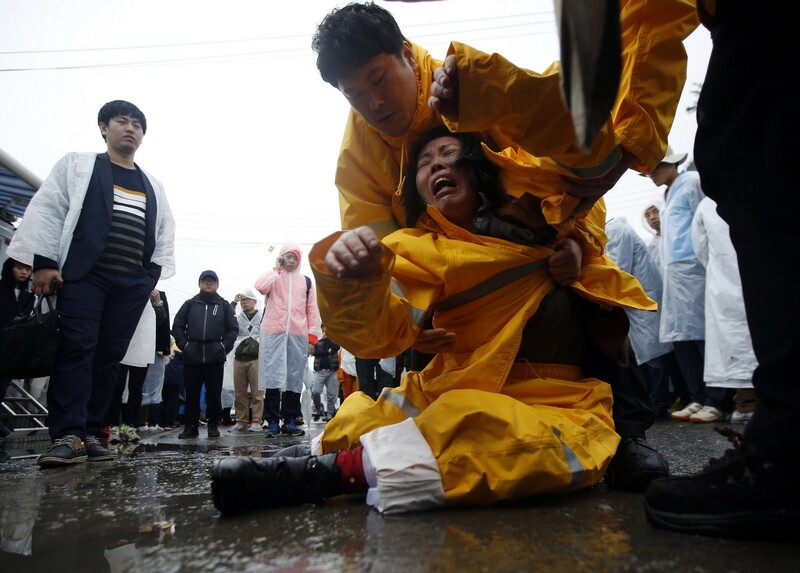 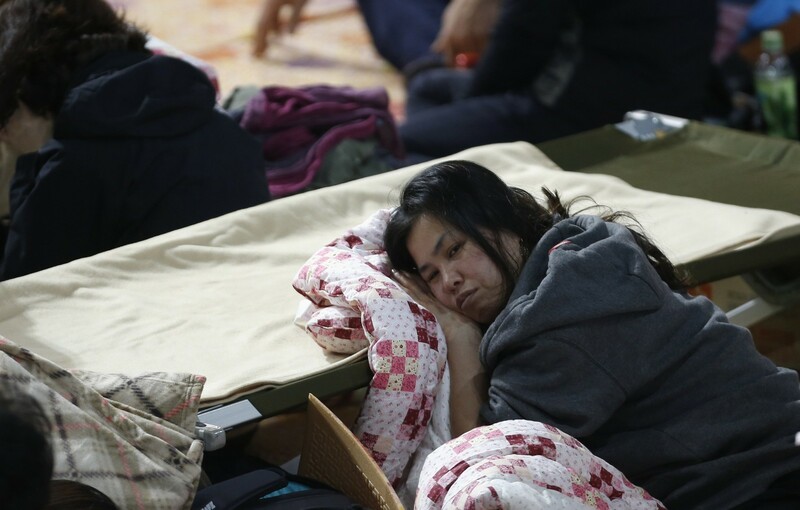 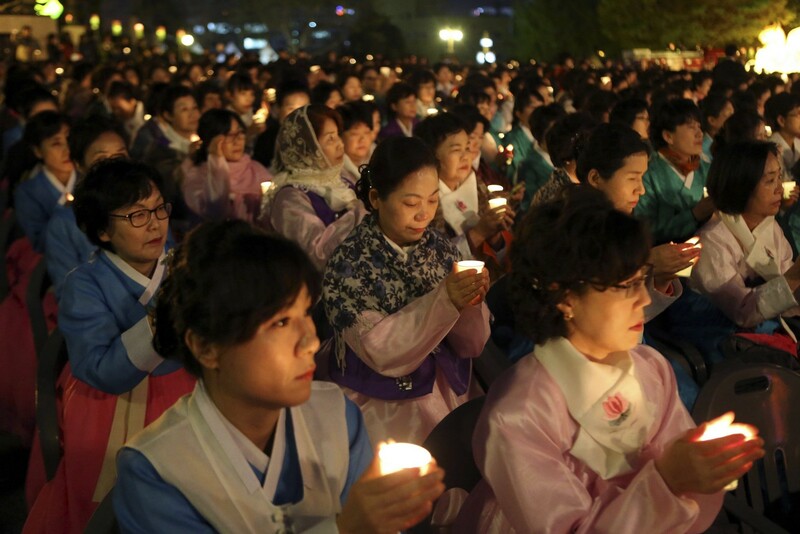 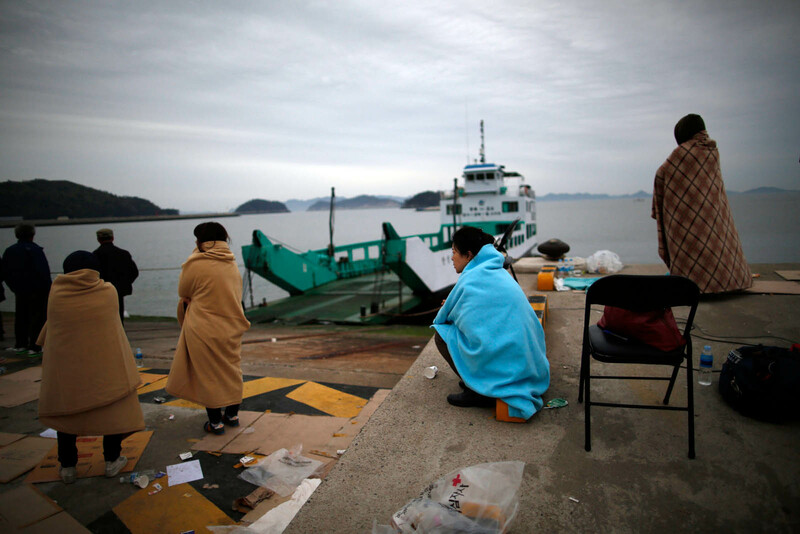 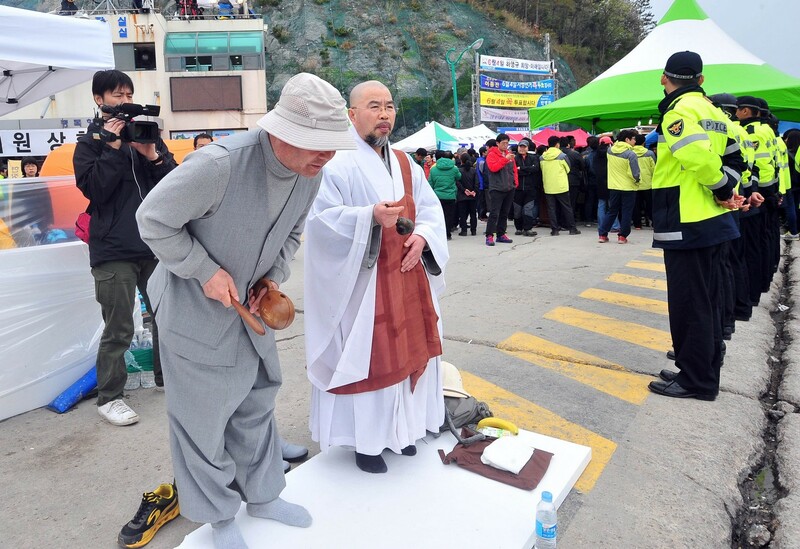 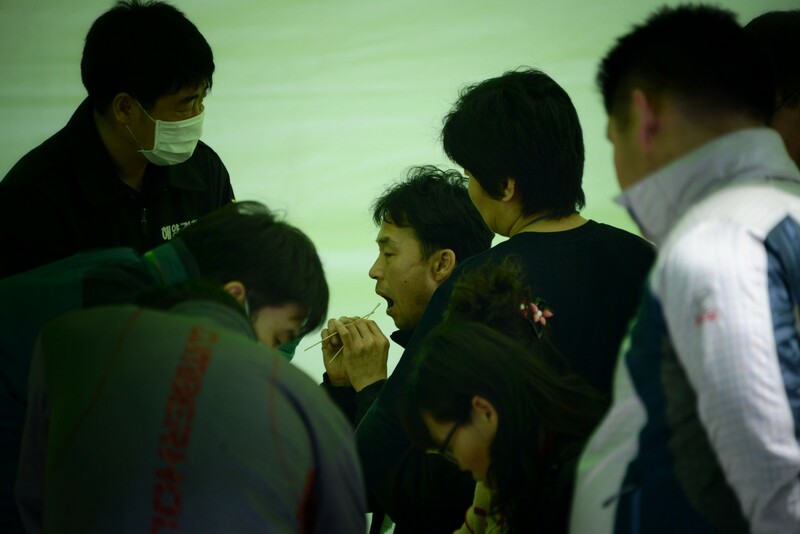 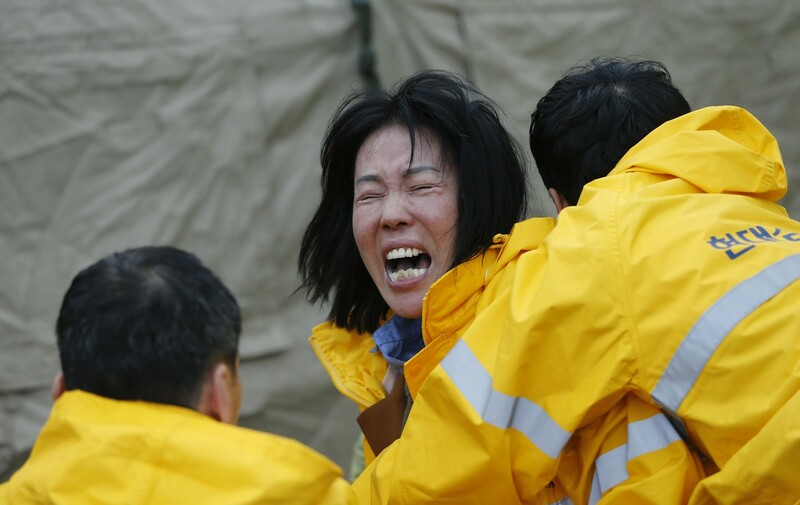 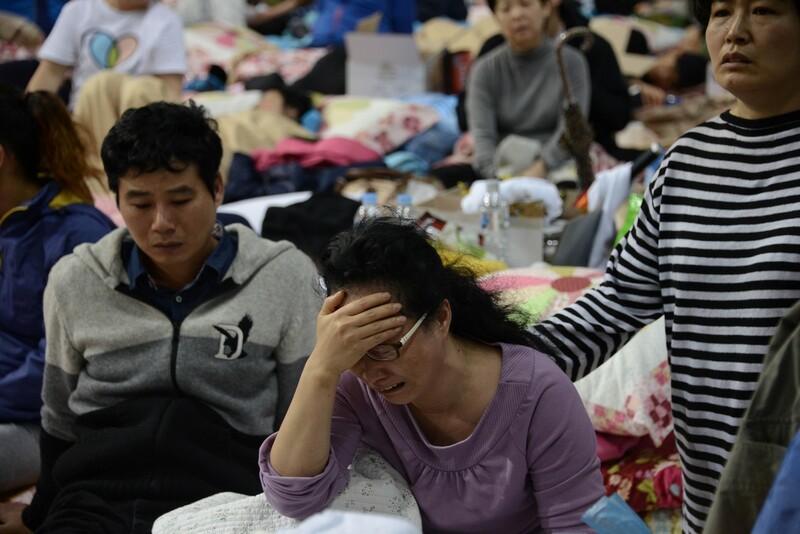 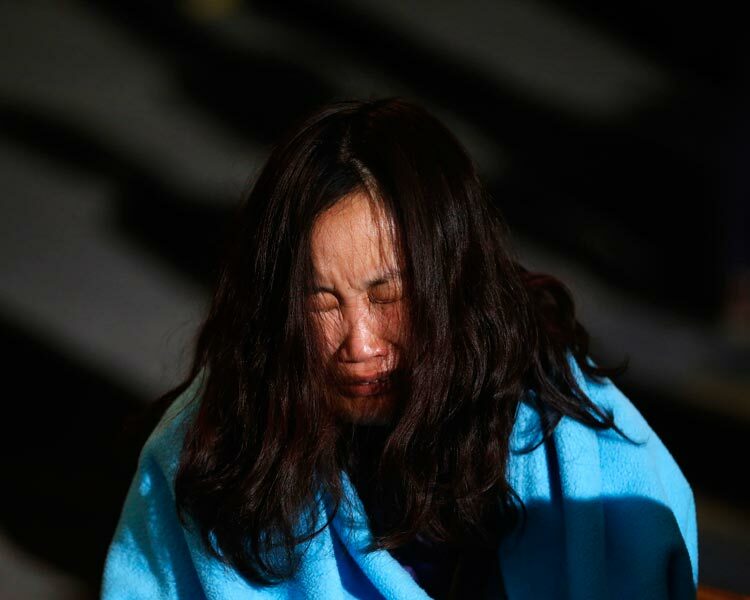 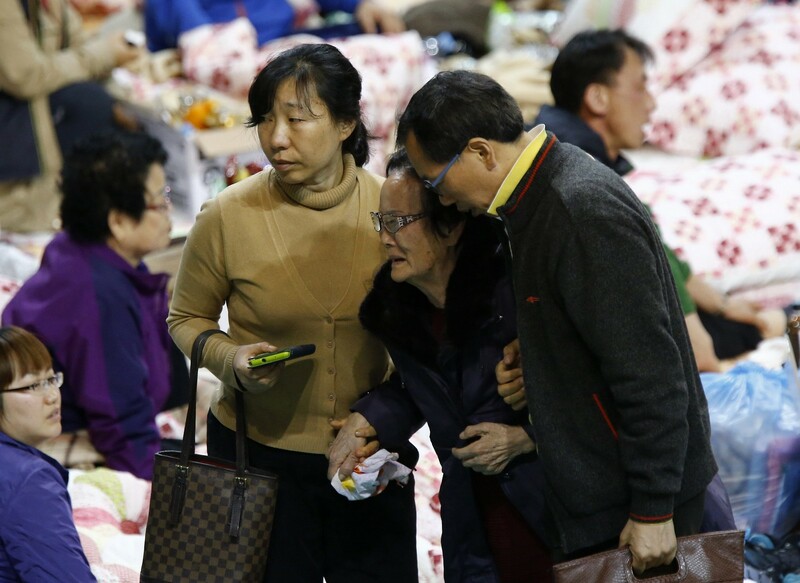 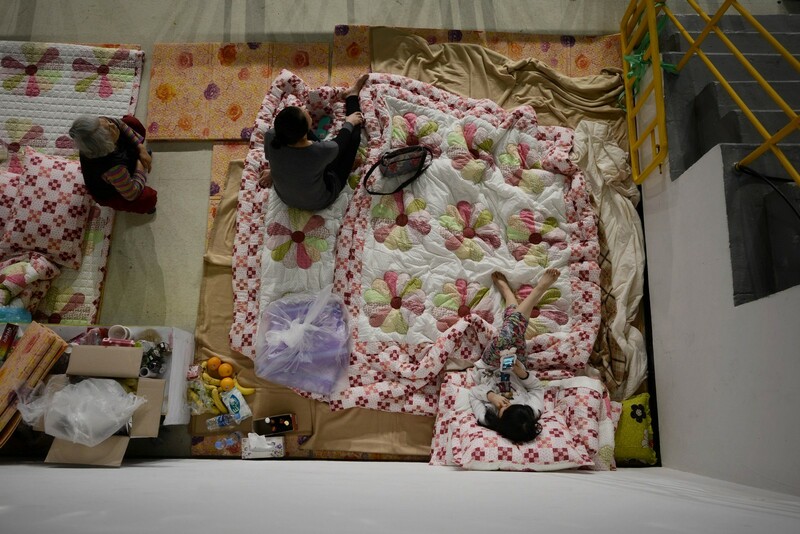 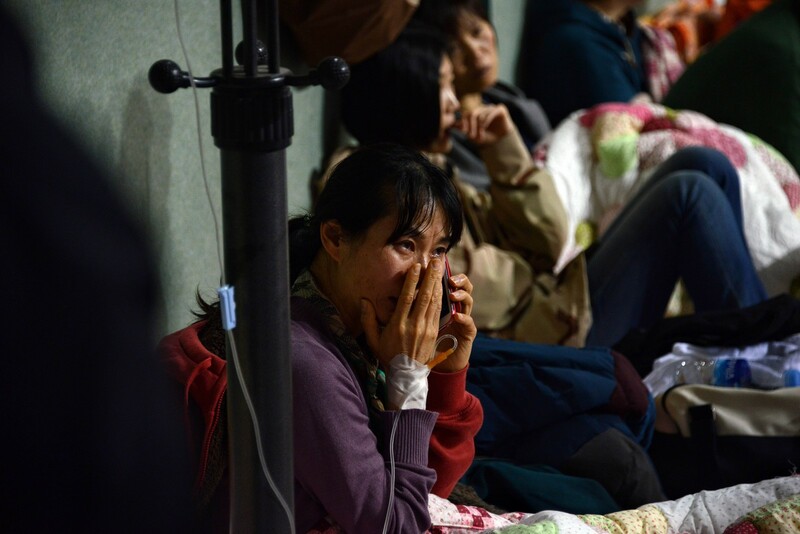 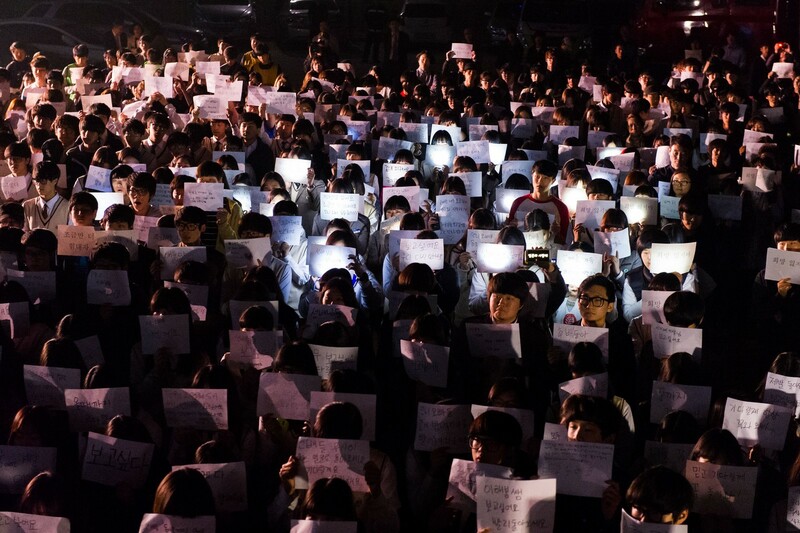 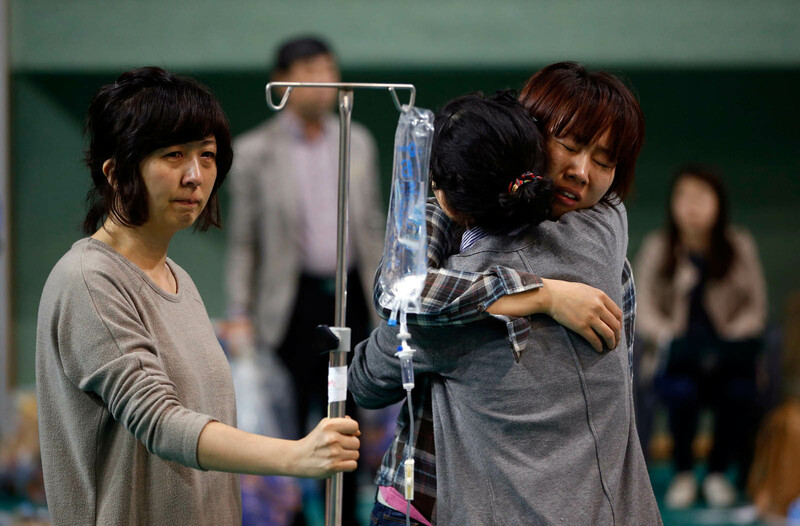 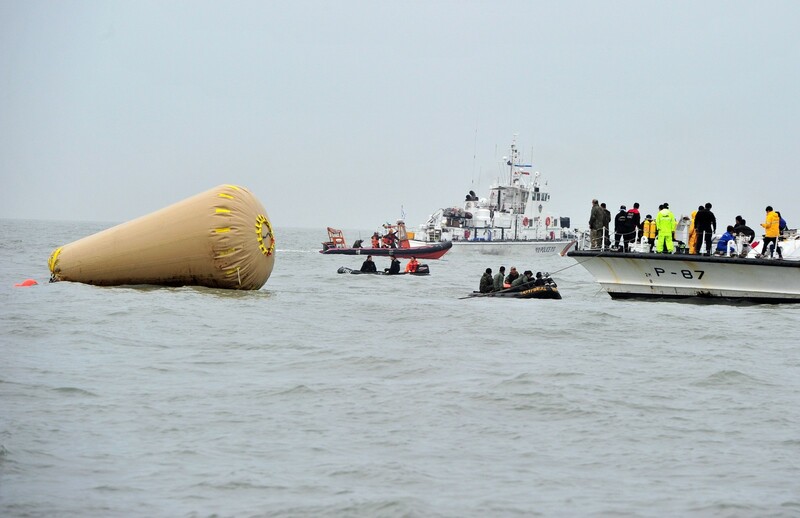 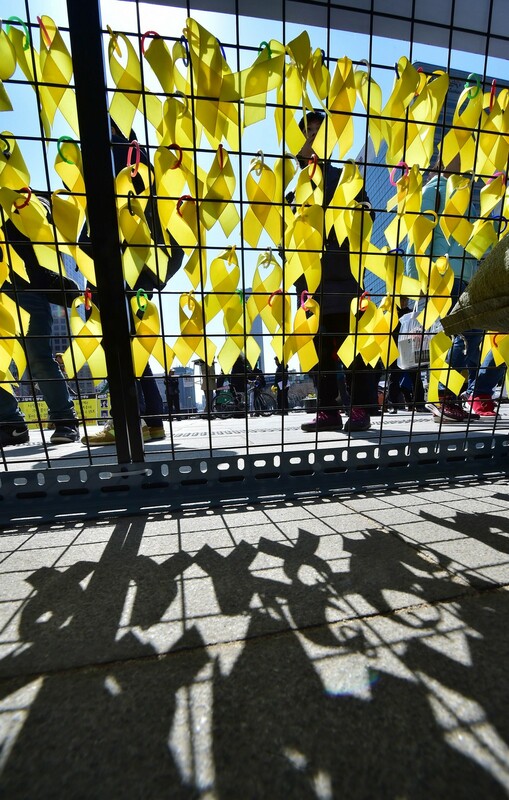 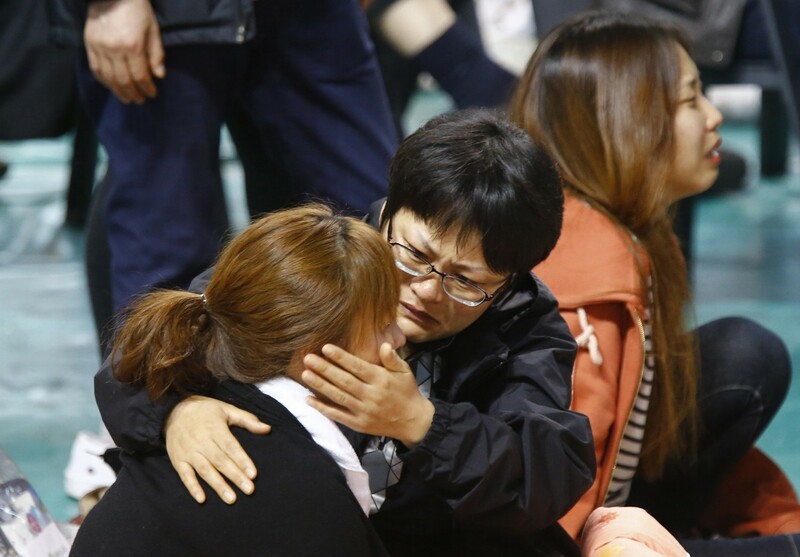 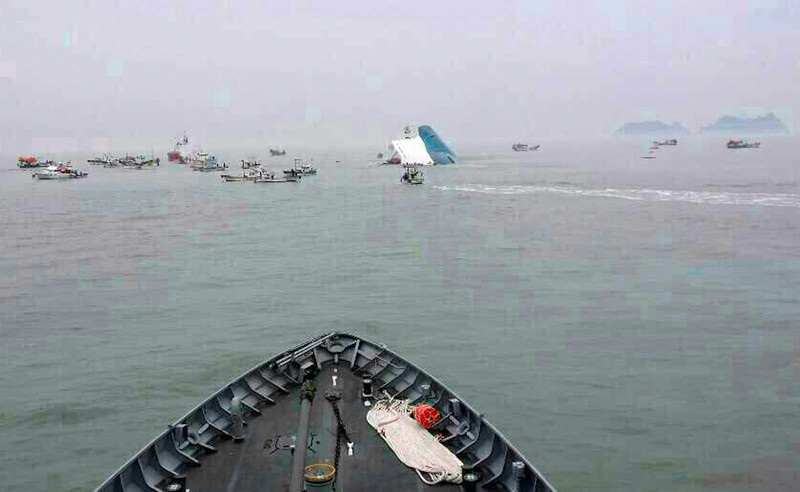 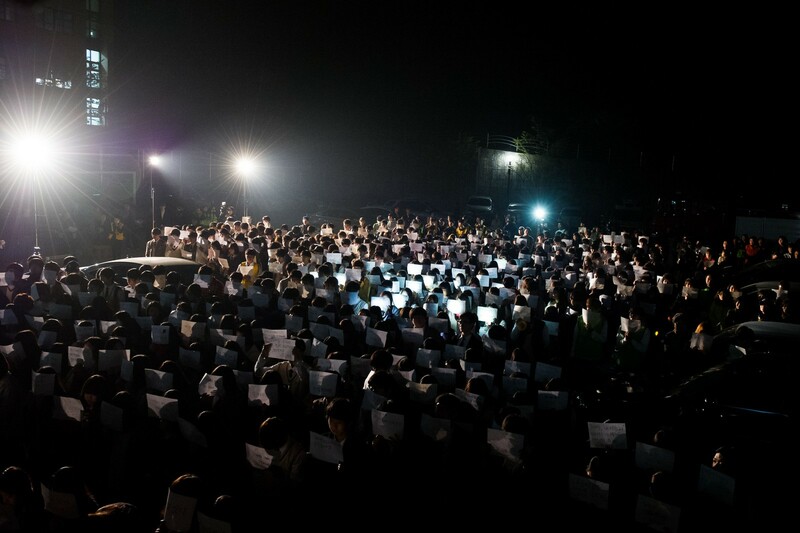 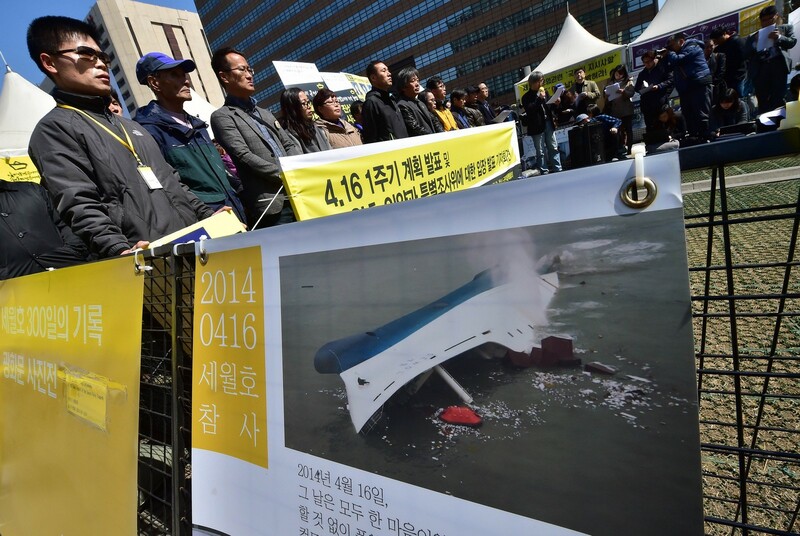 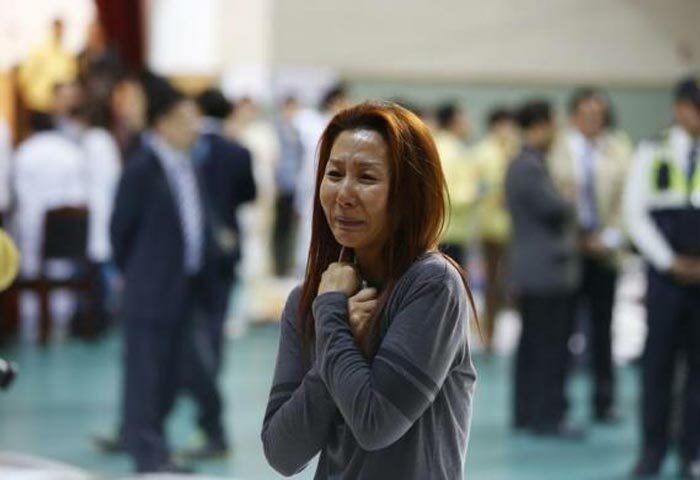 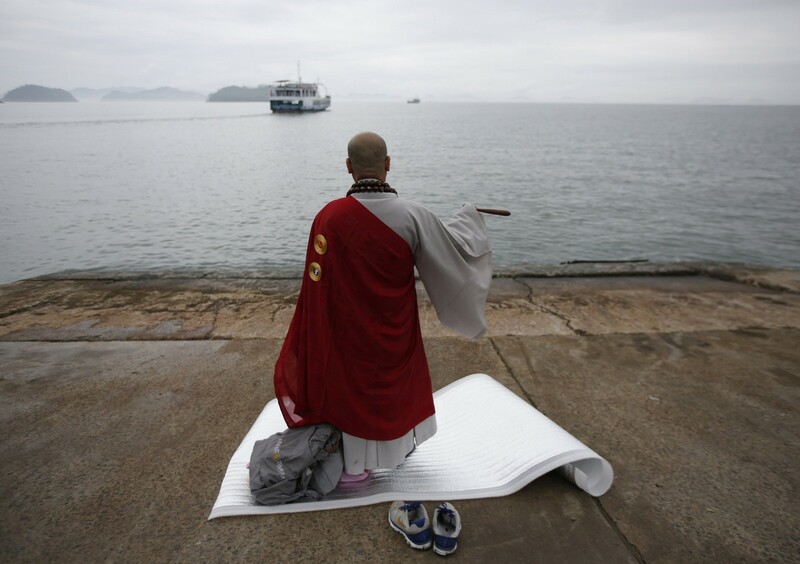 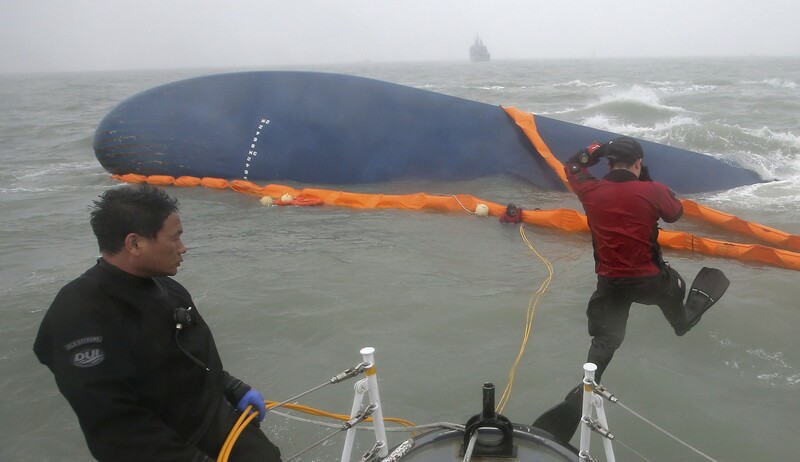 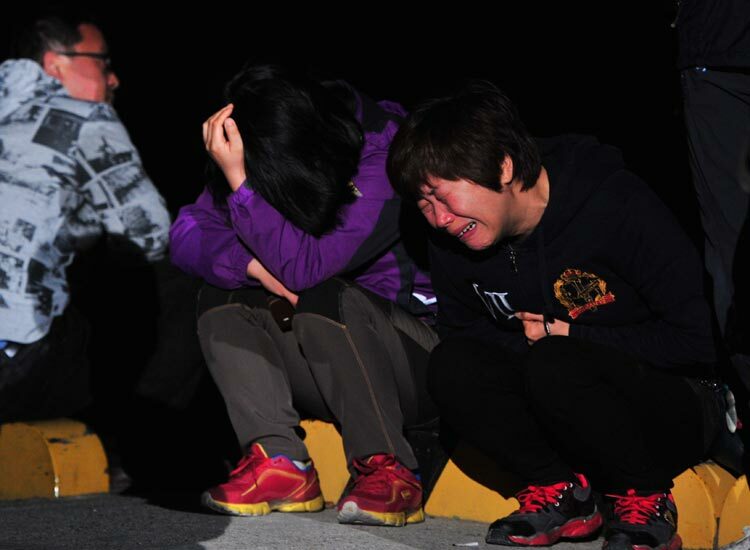 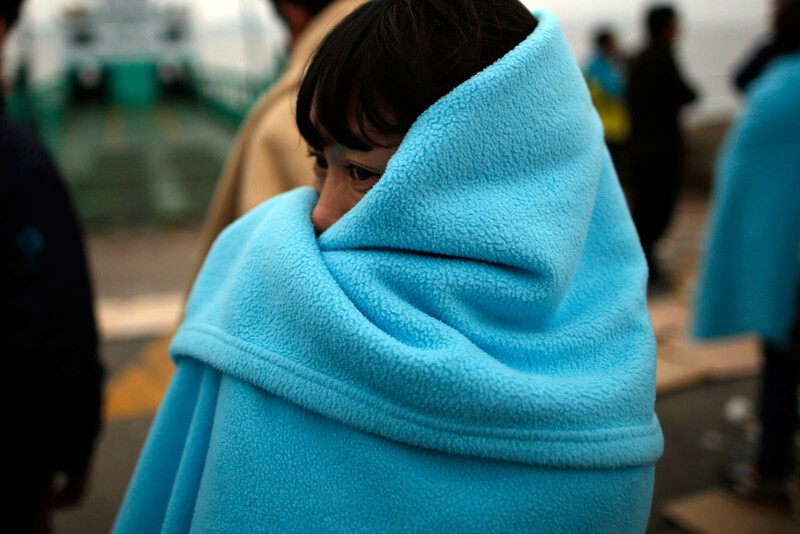 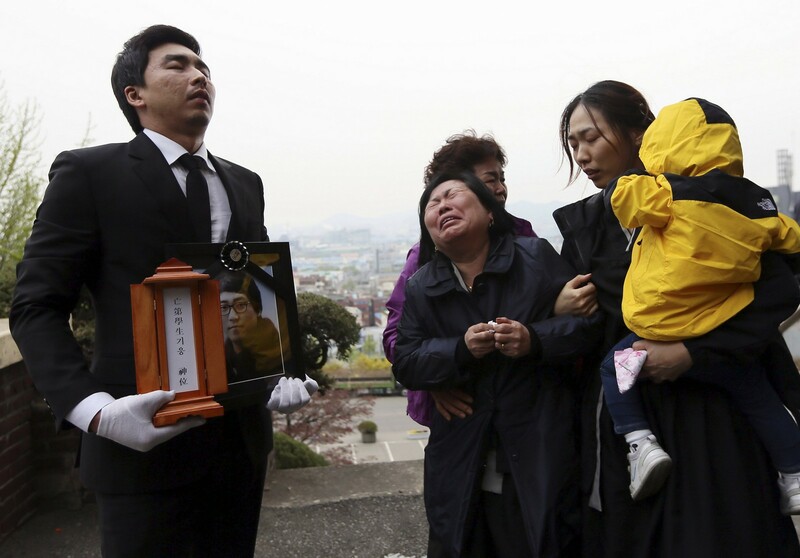 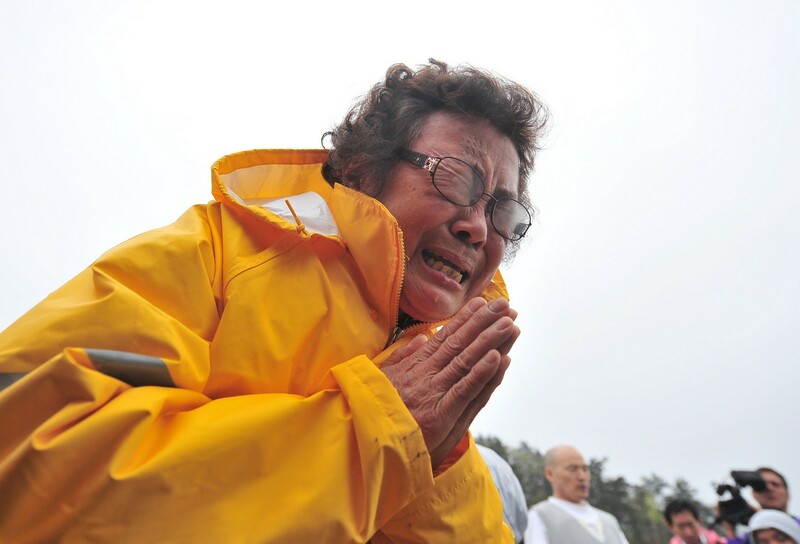 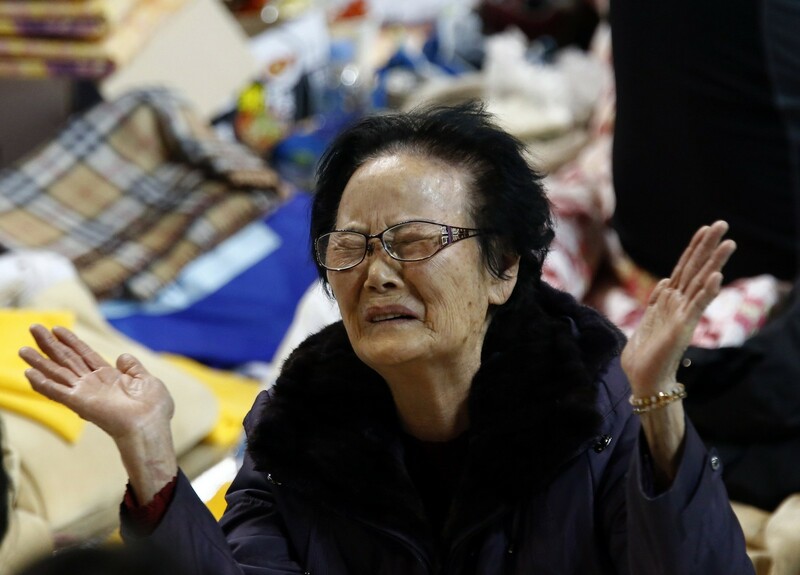 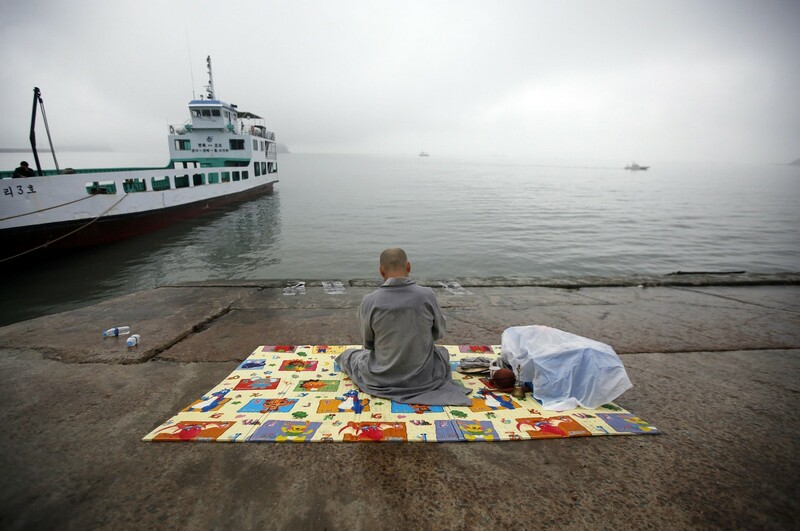 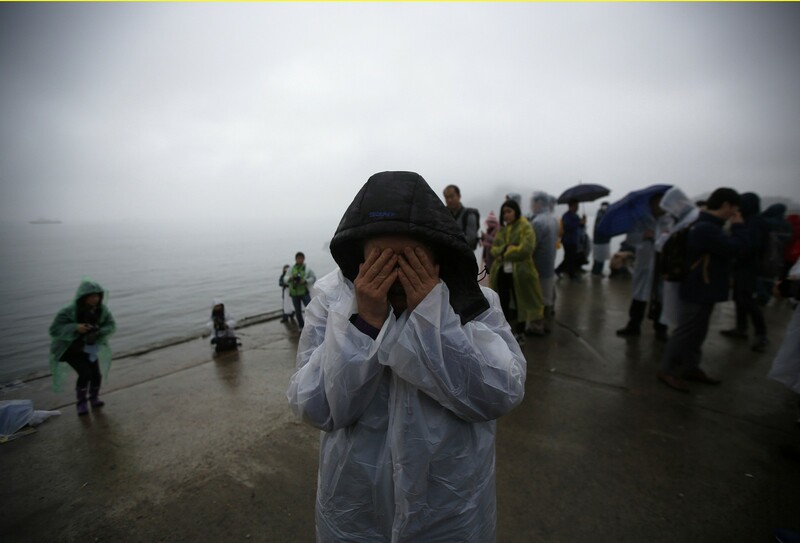 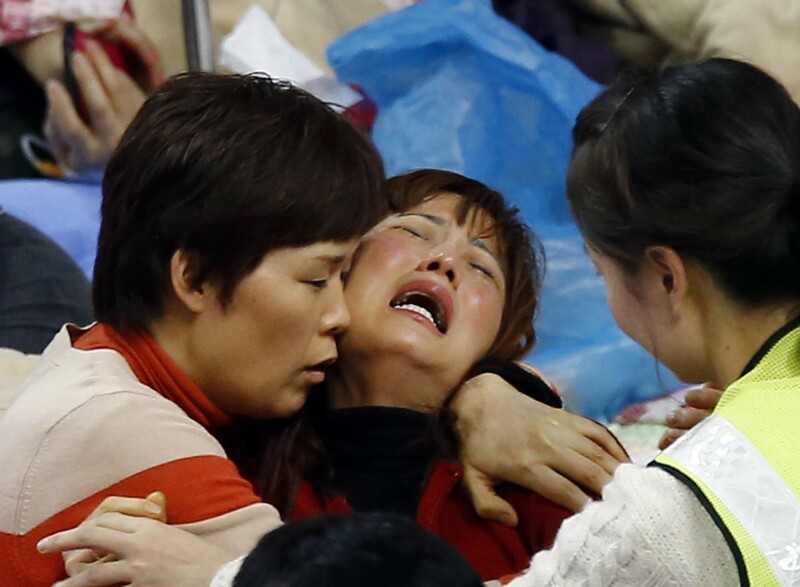 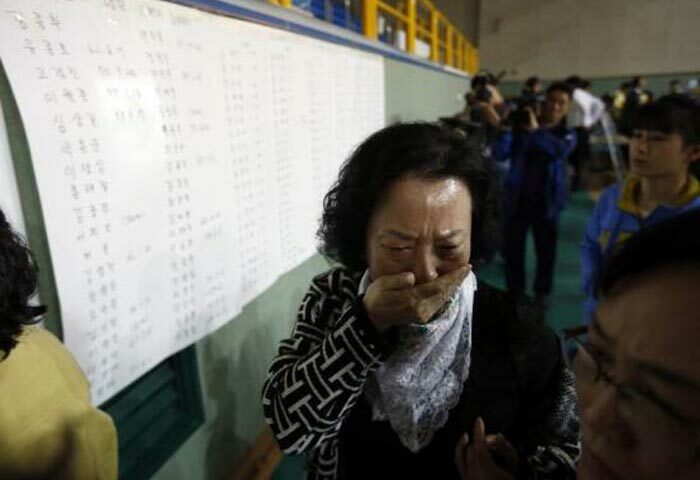 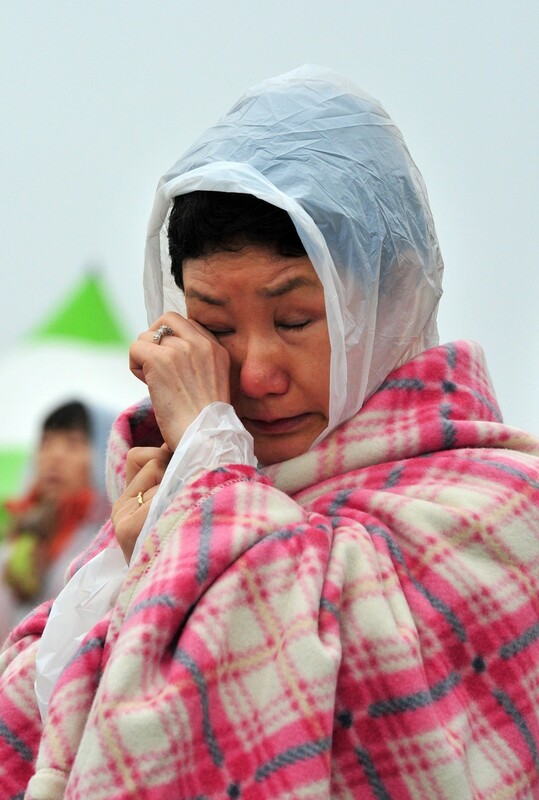 With the first anniversary of the tragedy looming, the parents - including ten mothers - also called for the 6,825-tonne Sewol ferry to be brought to the surface where it sank off the southern island of Jindo on April 16 with the loss of more than 300 lives. 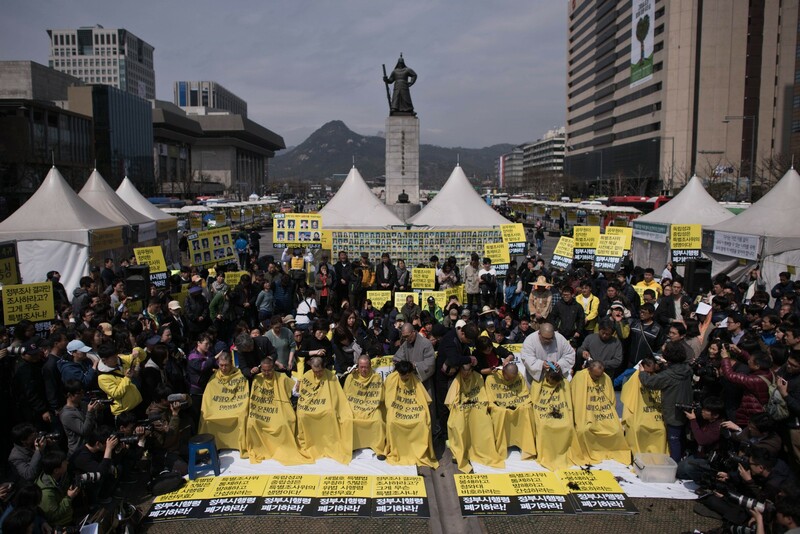 Ten at a time, the parents - wearing yellow, slogan-daubed barber's gowns - sat on plastic stools in the middle of the capital's main ceremonial thoroughfare. 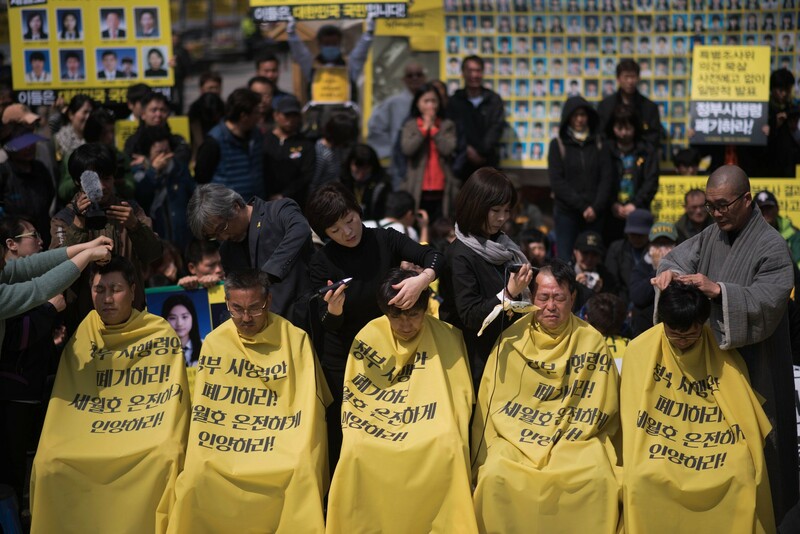 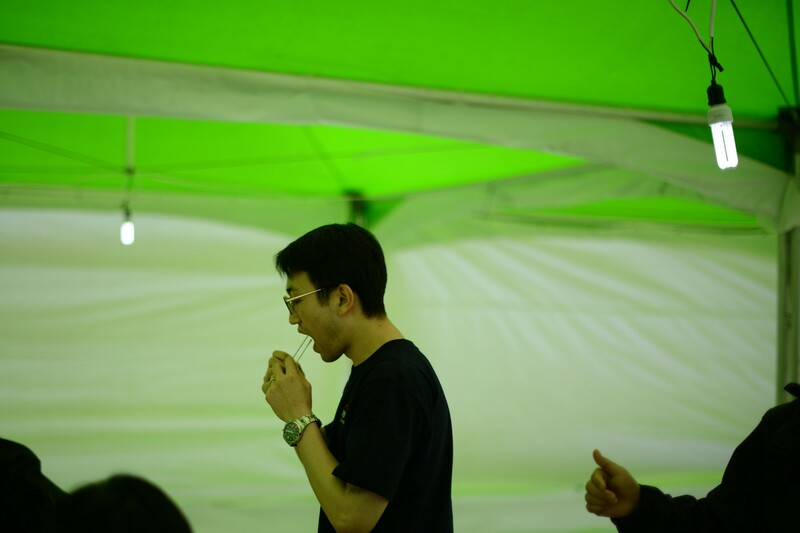 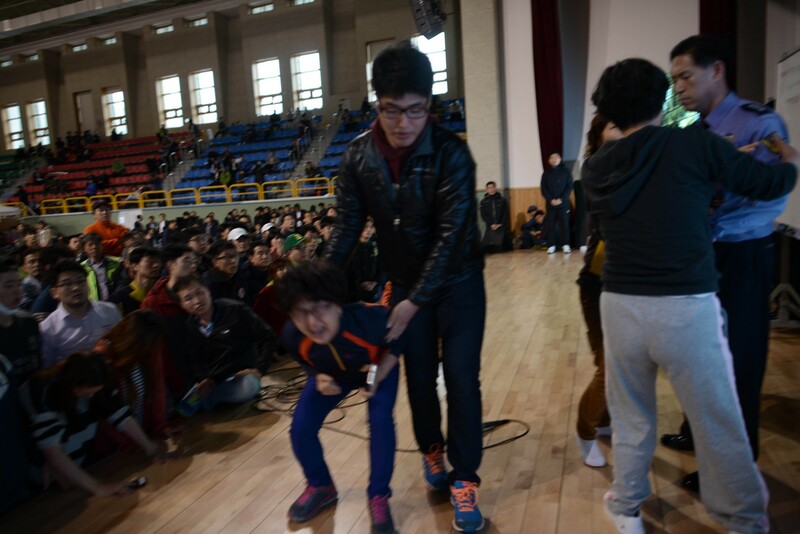 "The truth never sinks," they chanted before volunteers stepped forward to shave their hair off with electric clippers. 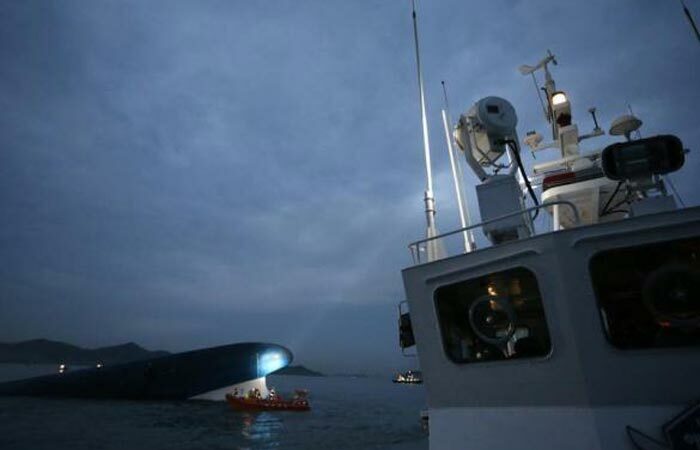 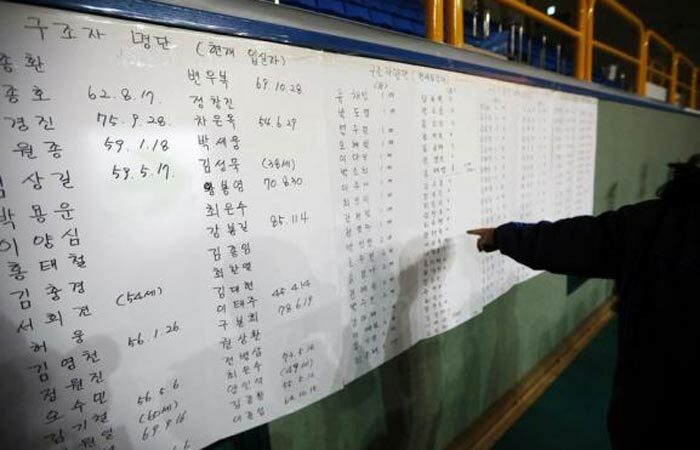 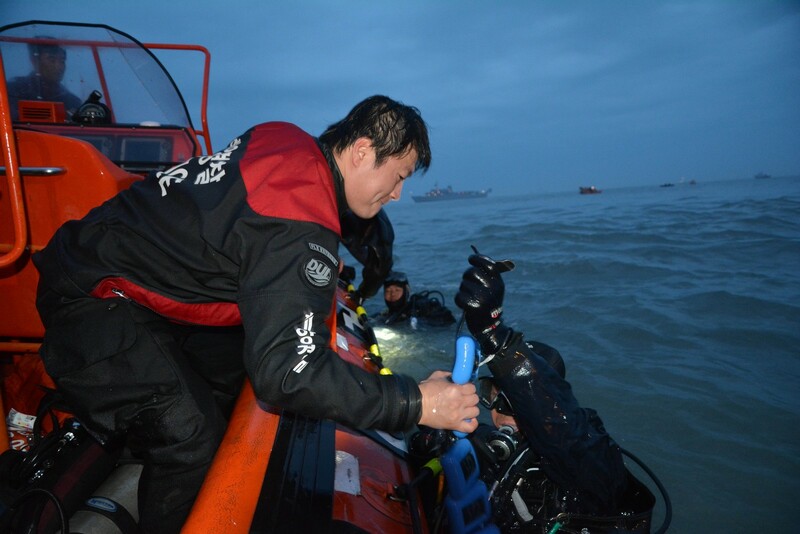 Following months of political bickering, the South Korean parliament passed a bill in November initiating an independent investigation into the sinking. 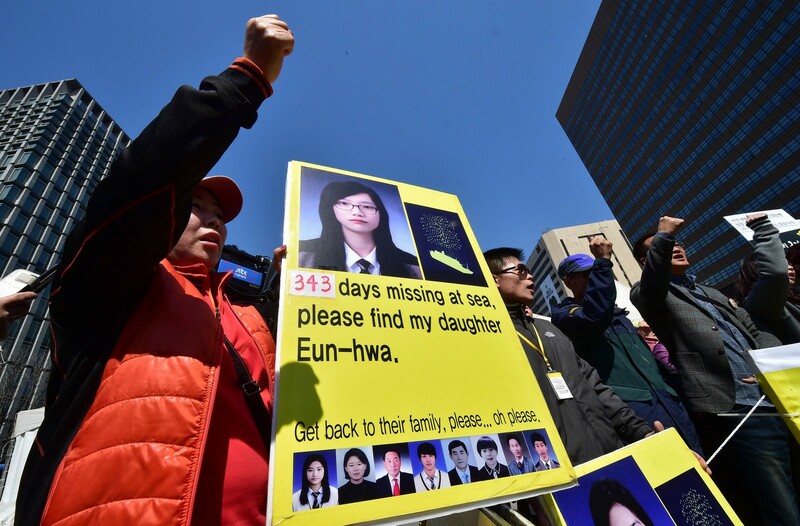 But relatives have accused the government of seeking to influence the probe by appointing officials to key posts in the inquiry committee. 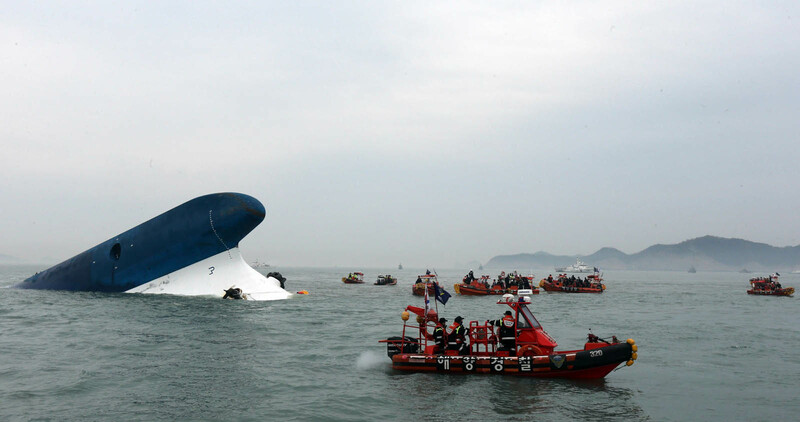 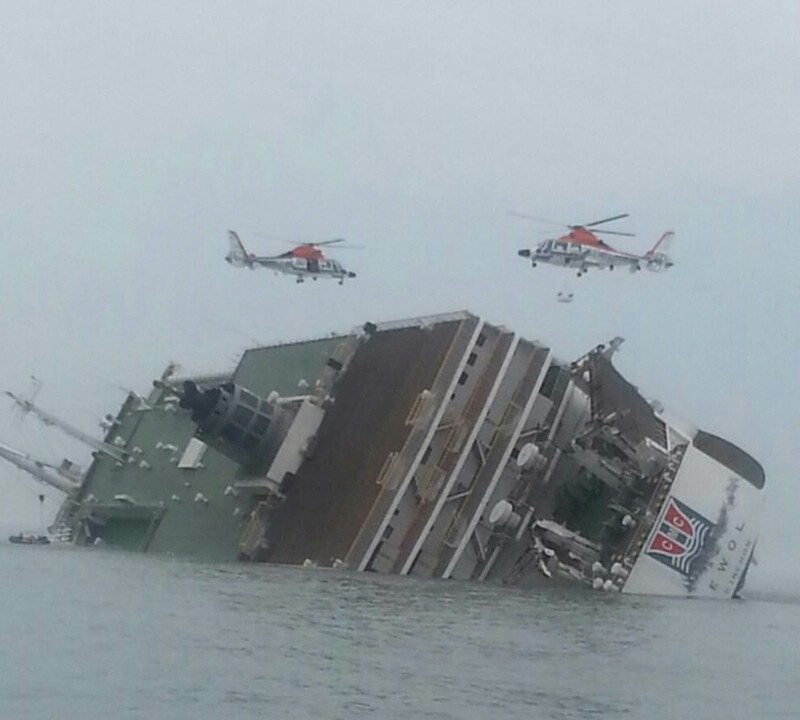 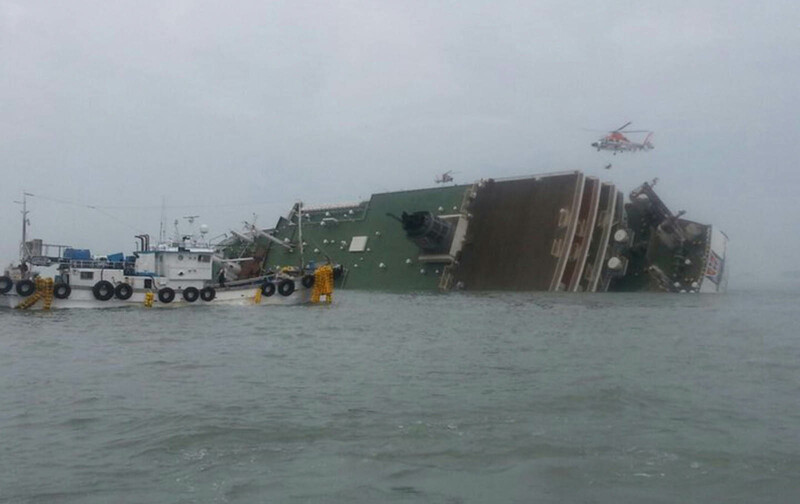 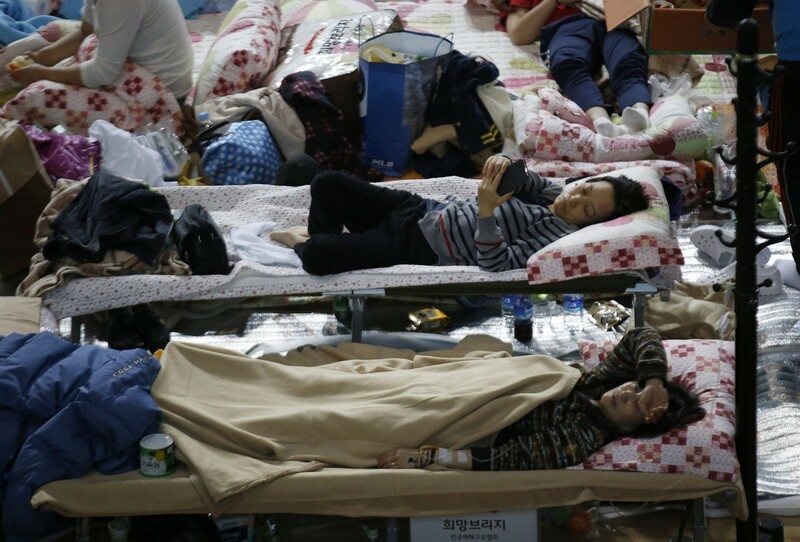 The overloaded and unstable Sewol was carrying 476 people - most of them high school students on an organised trip - when it capsized. 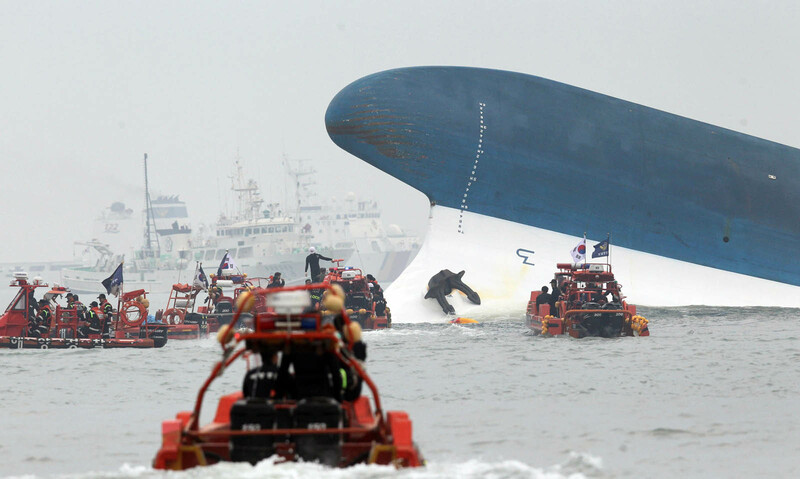 The tragedy sparked nationwide grief and outrage as it became clear that regulatory failings, official incompetence and the ship's illegal redesign were the main causes. 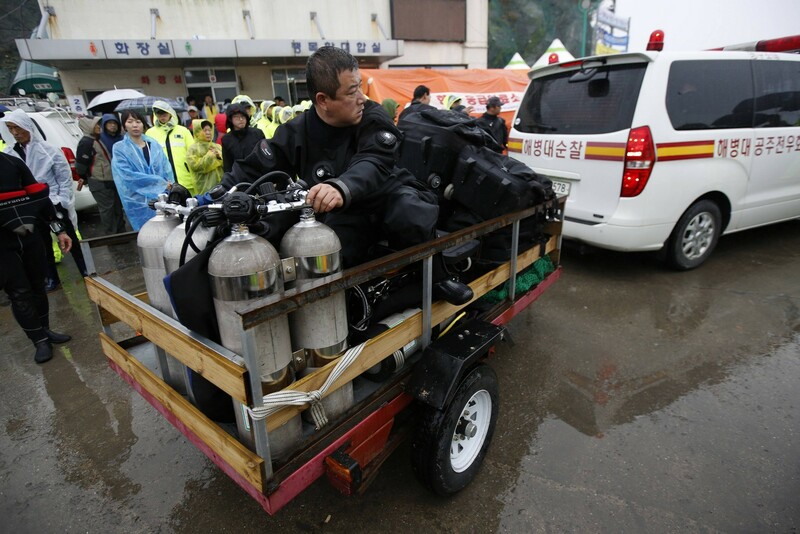 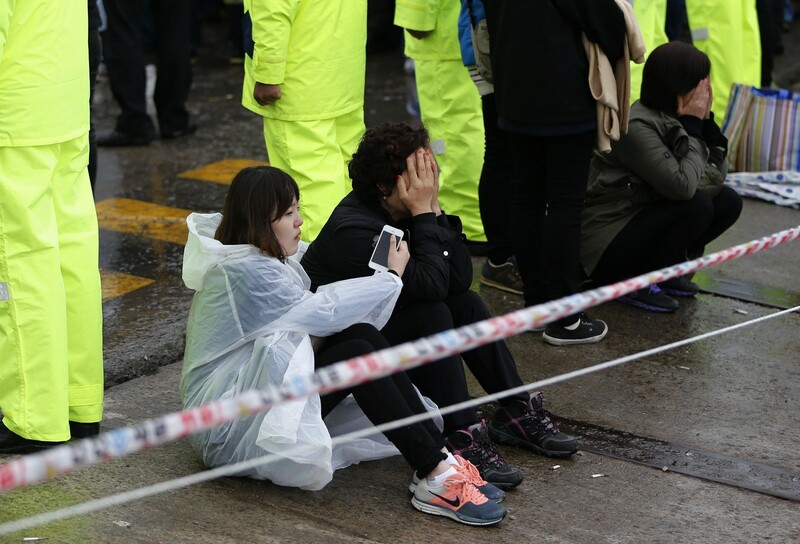 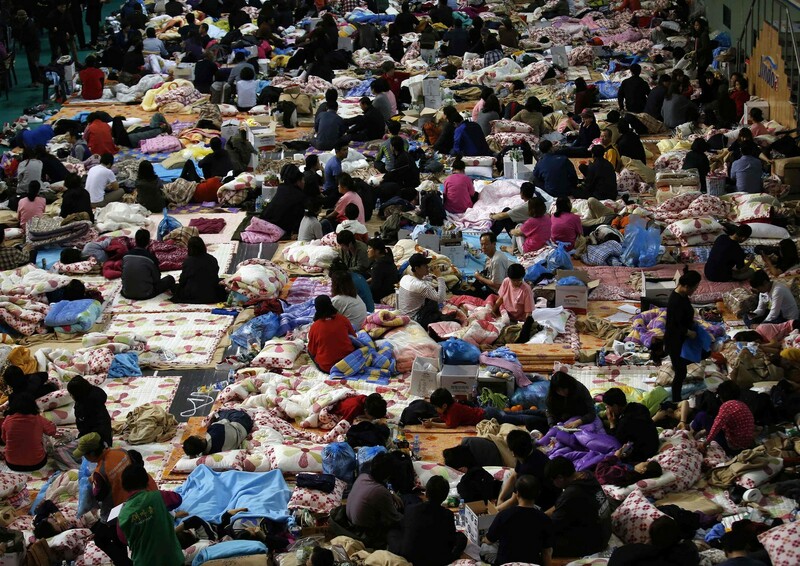 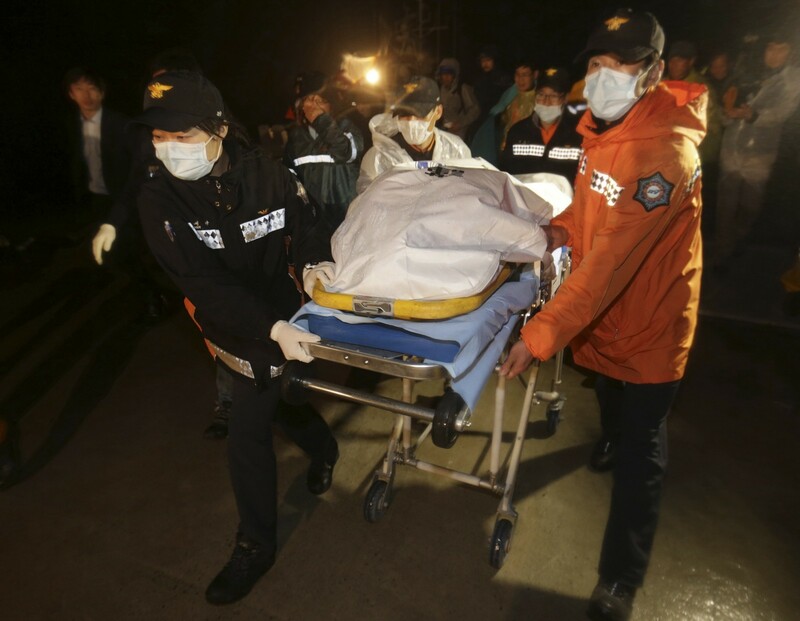 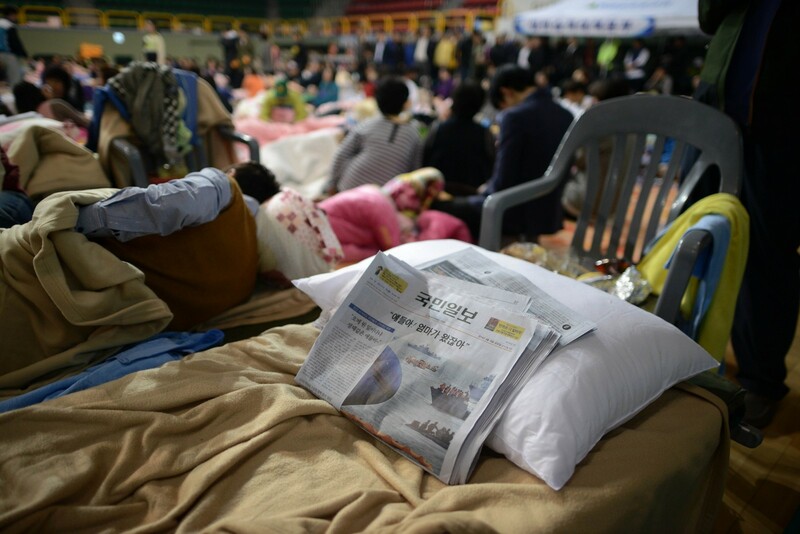 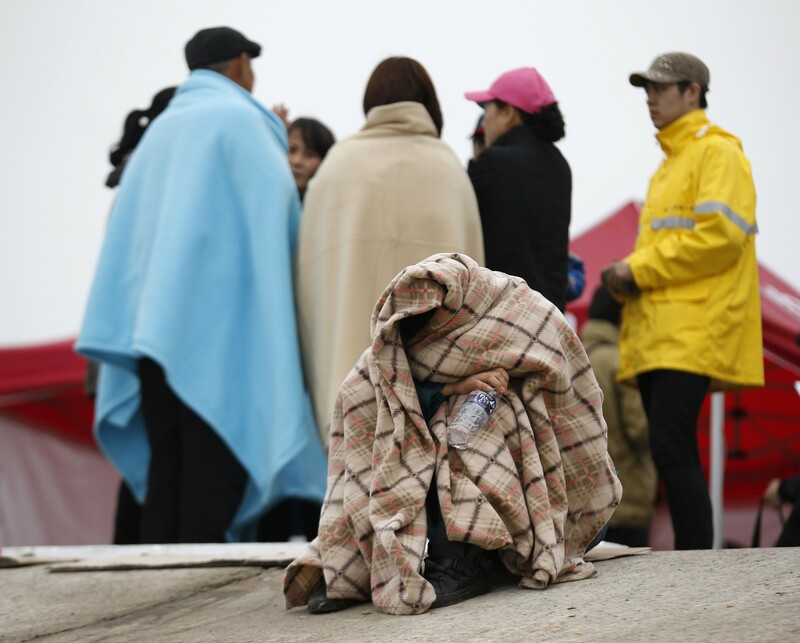 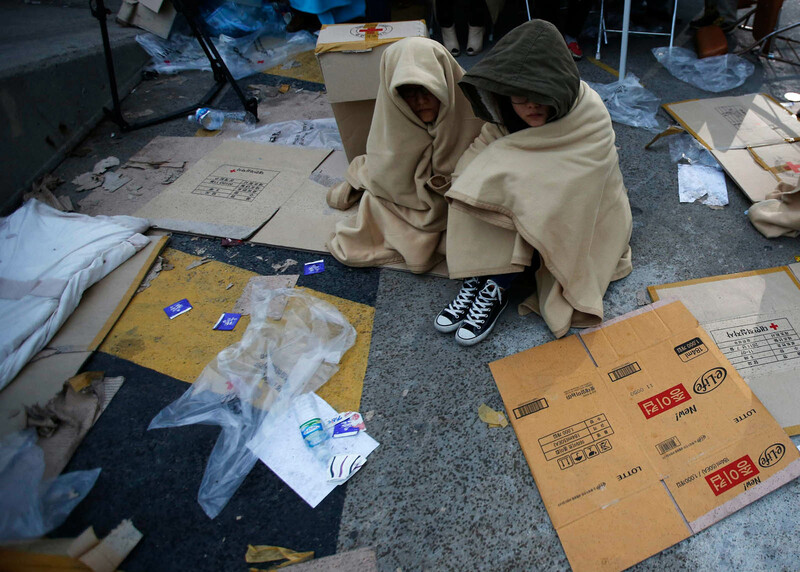 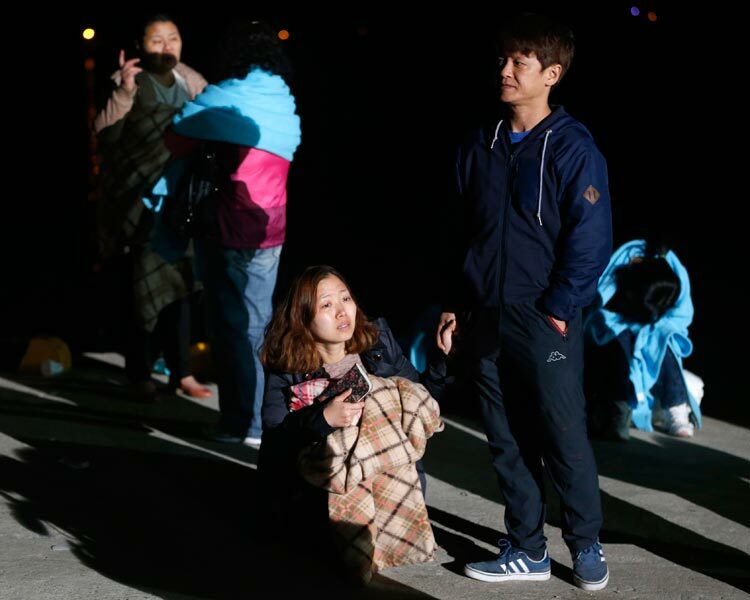 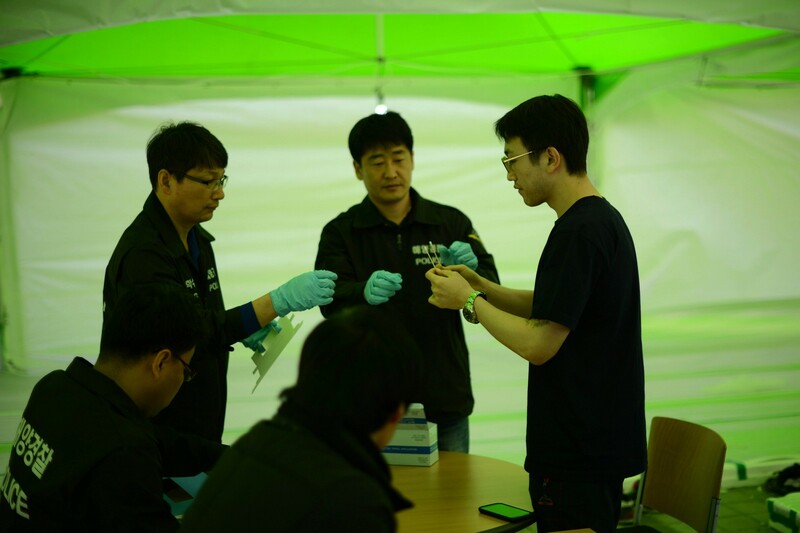 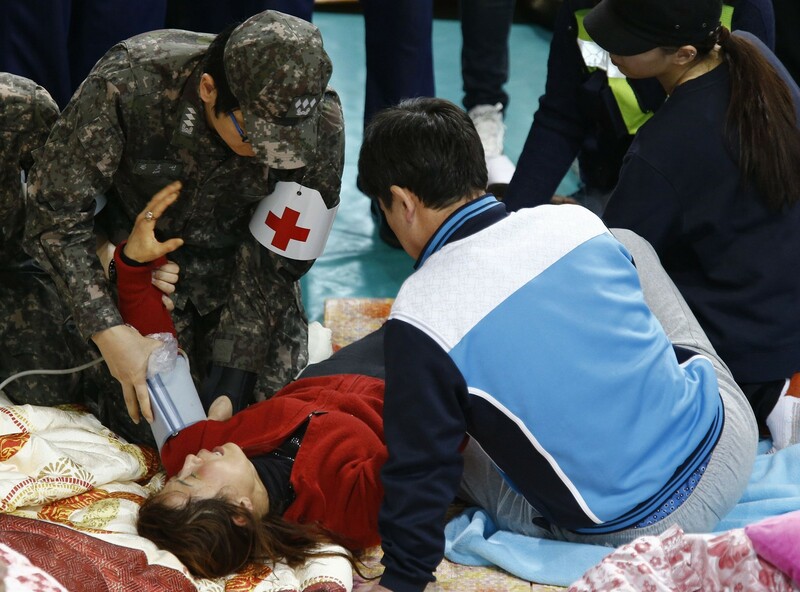 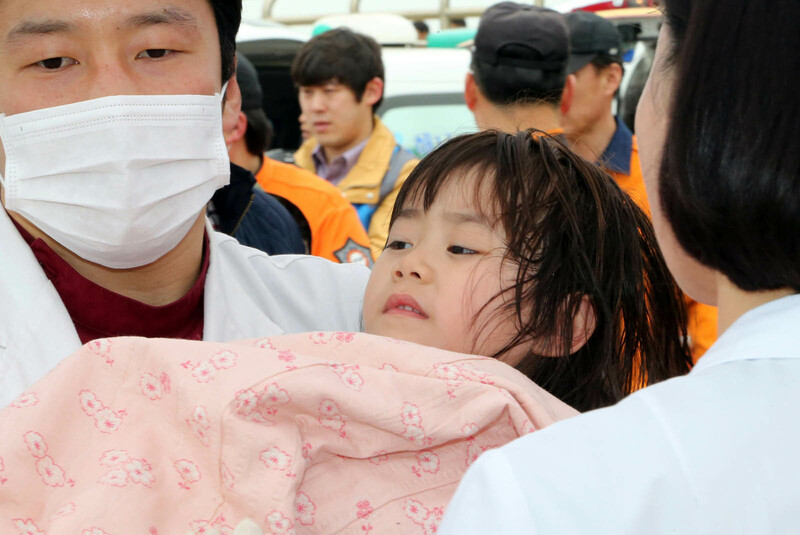 The official response to the disaster was widely criticised for being slow, uncoordinated and unfocused, and prompted President Park Geun-Hye to vow a complete overhaul of national safety standards. 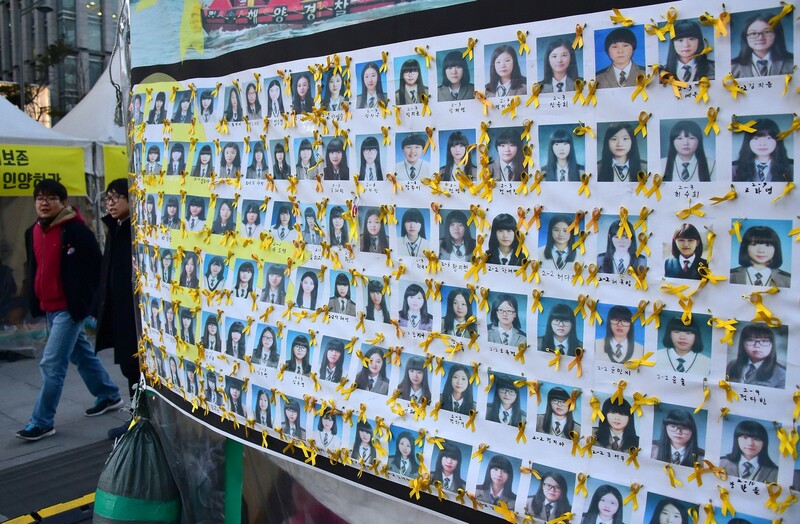 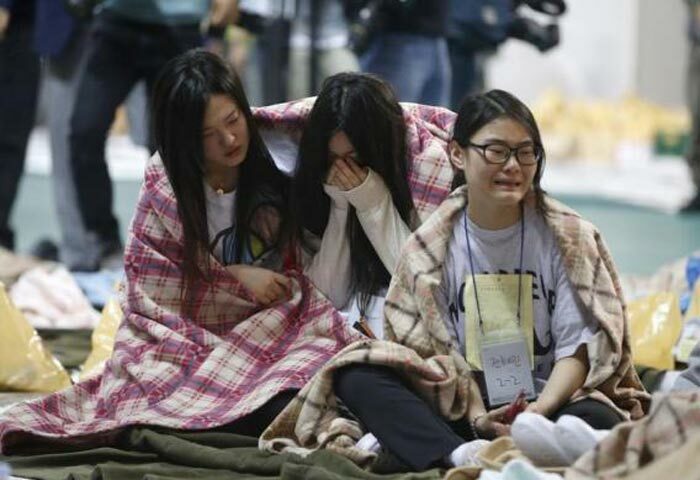 On Wednesday the government announced it would start handing out compensation payments to the families of the victims, including around $380,000 for each of the 250 students who died. 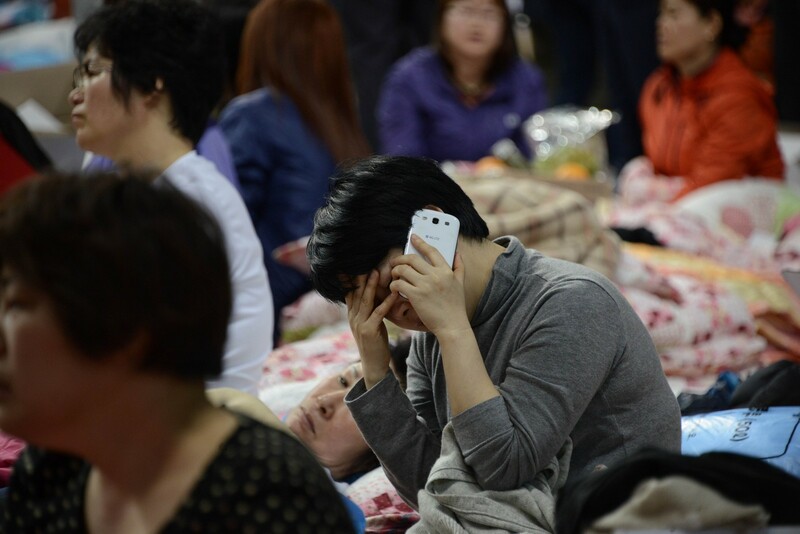 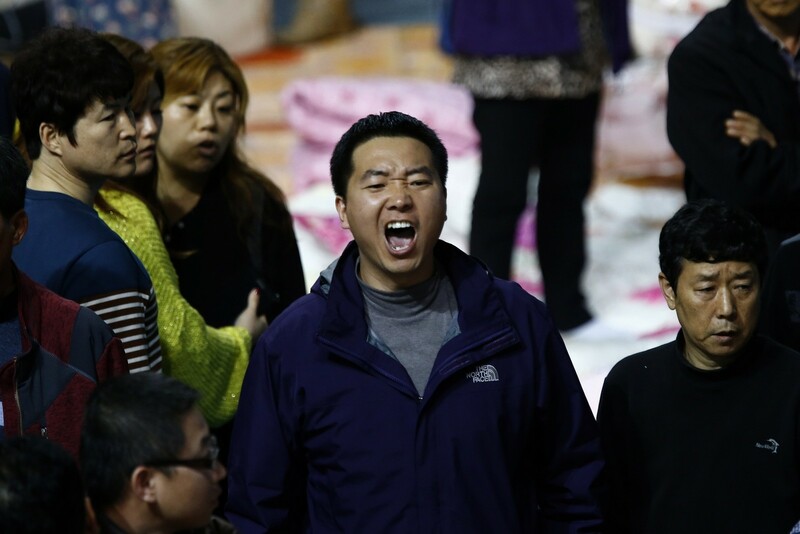 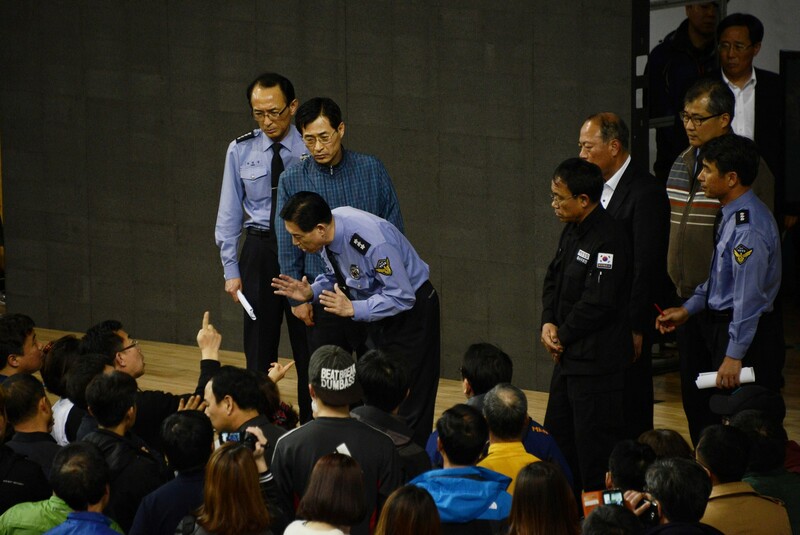 The announcement infuriated victims' family groups, including those who had their heads shaved on Thursday. 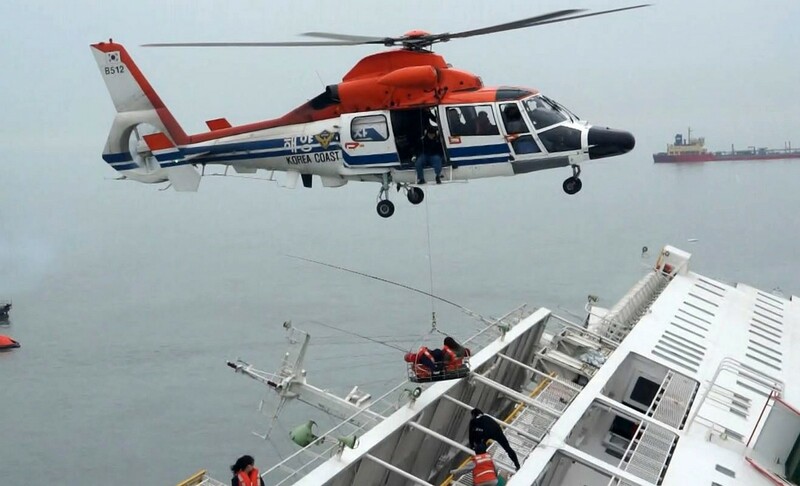 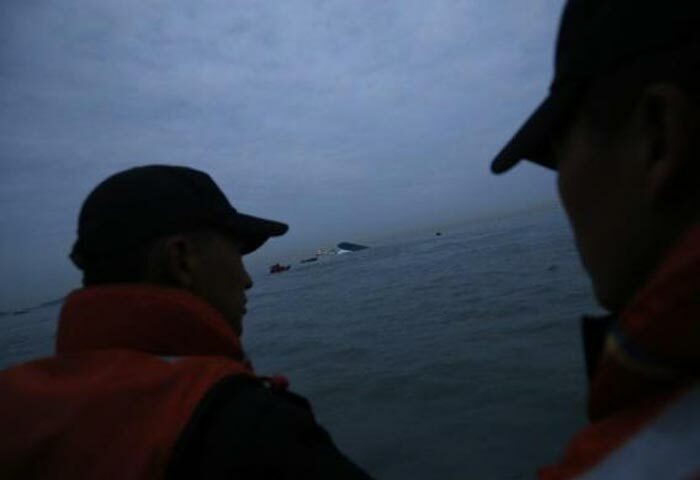 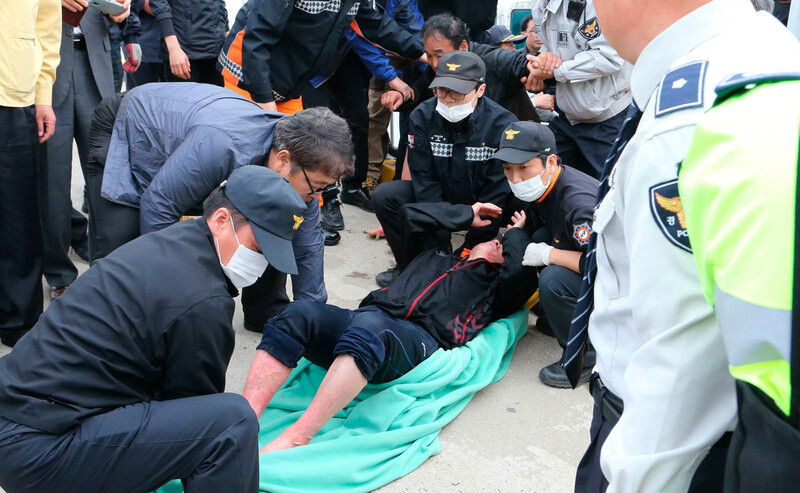 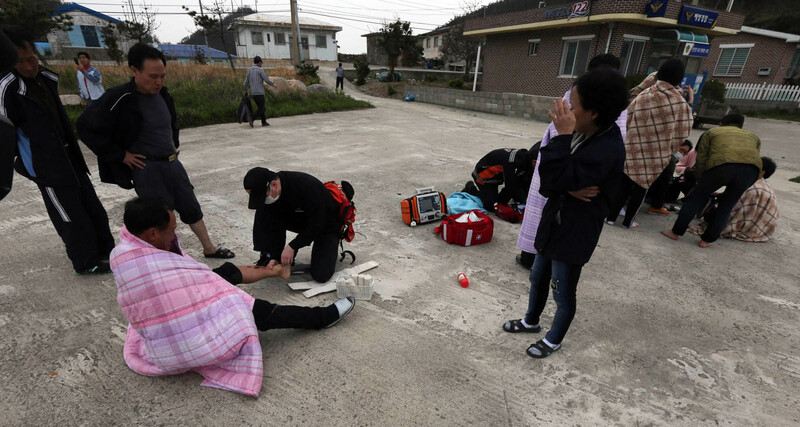 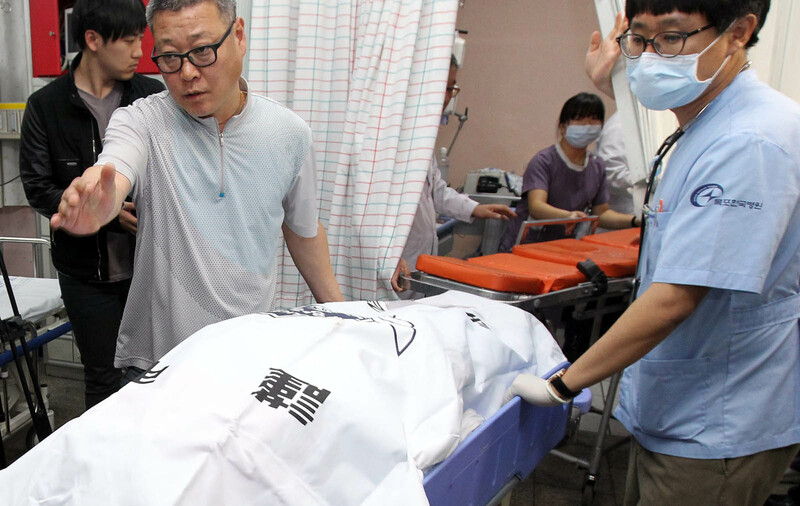 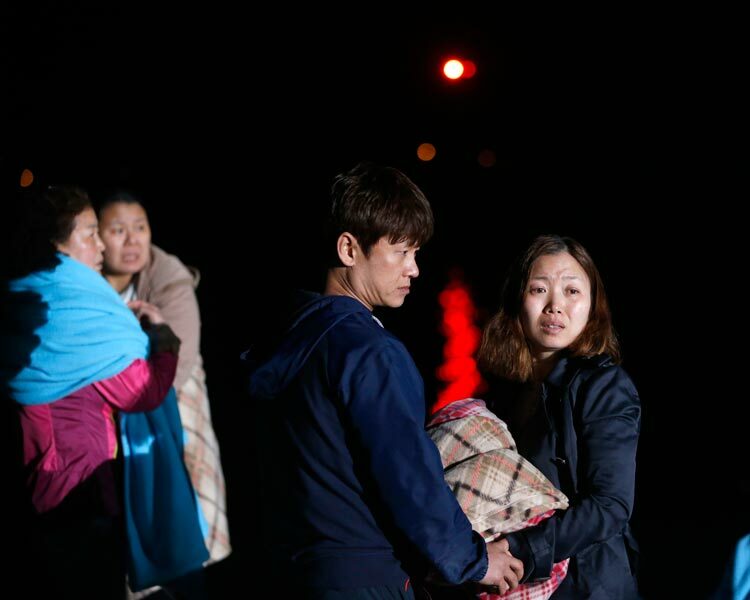 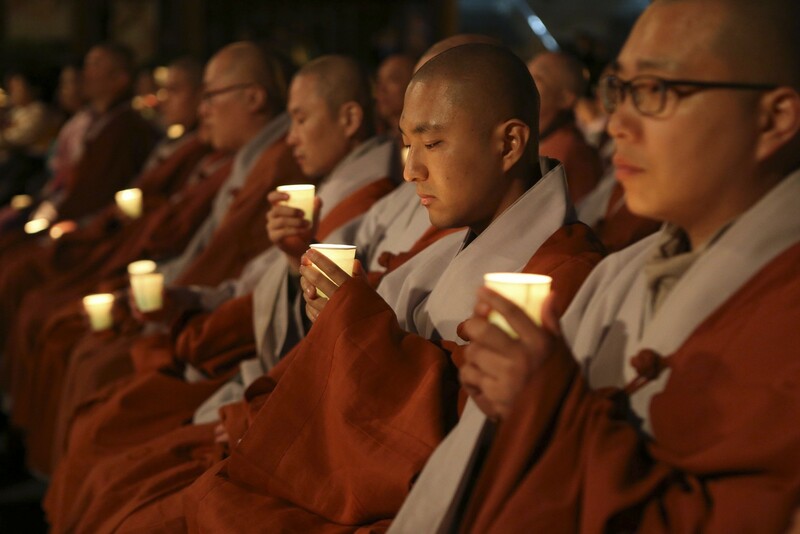 "In the run up to the first anniversary of the tragedy, the priority for the government should not be monetary compensation but getting to the bottom of the incident, salvaging the wreckage and finding the last missing persons," they said in a statement. 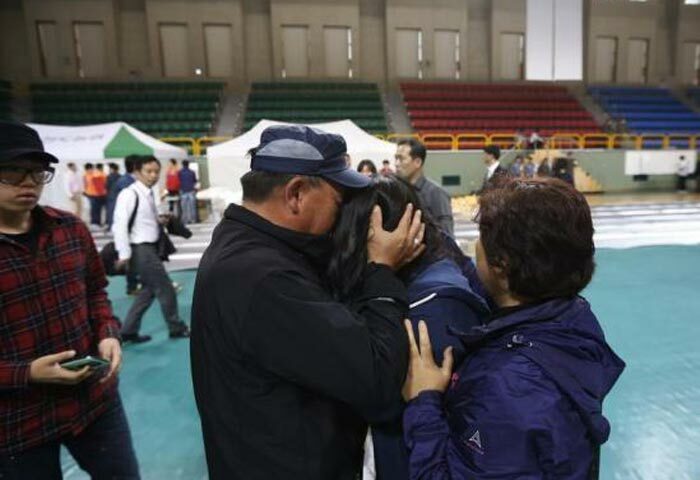 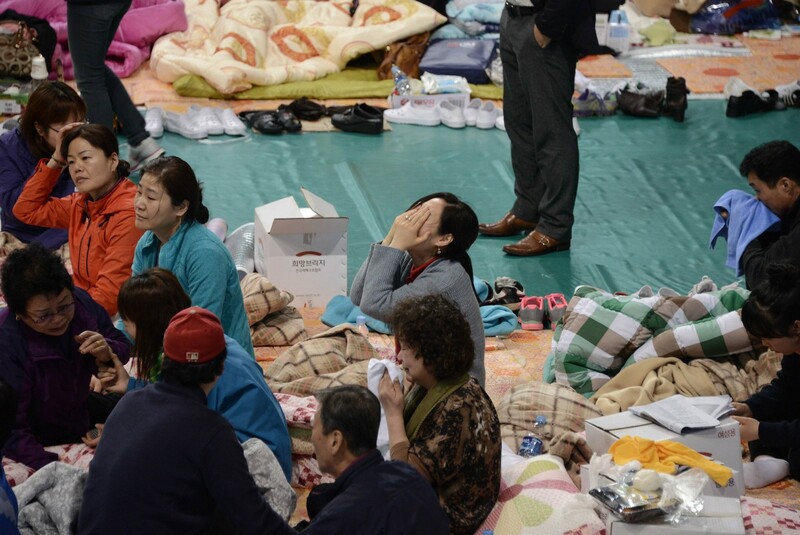 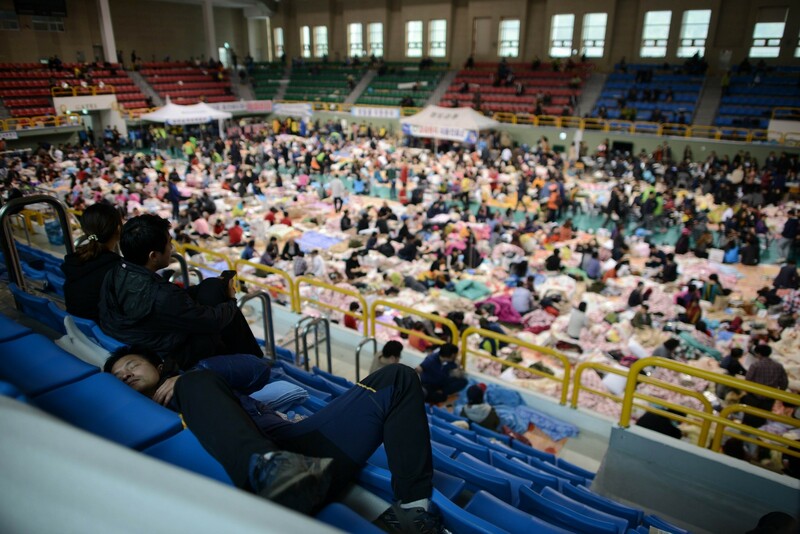 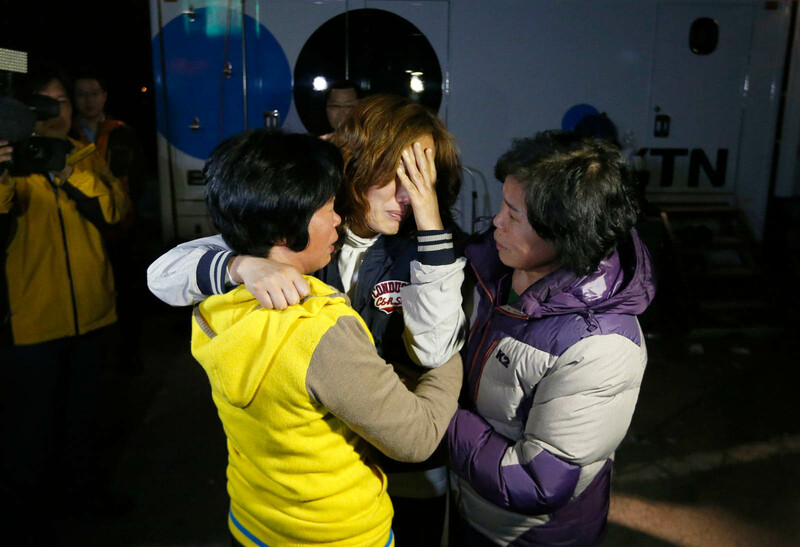 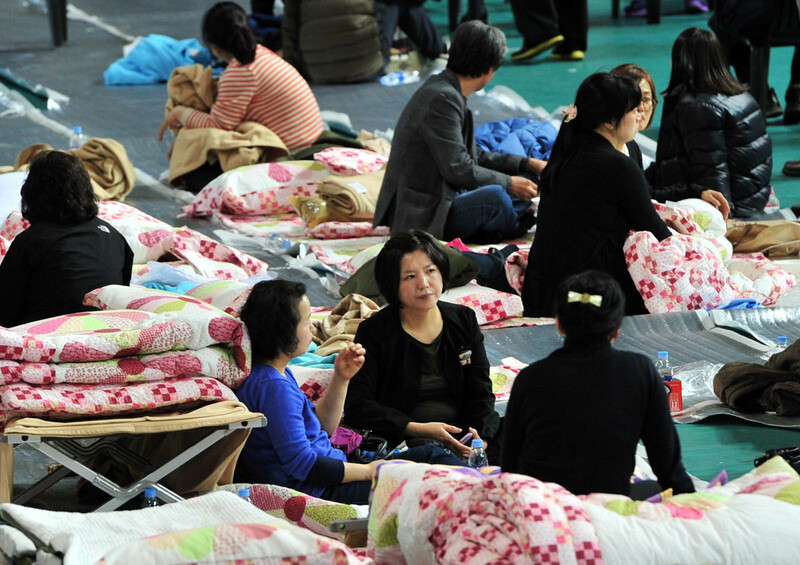 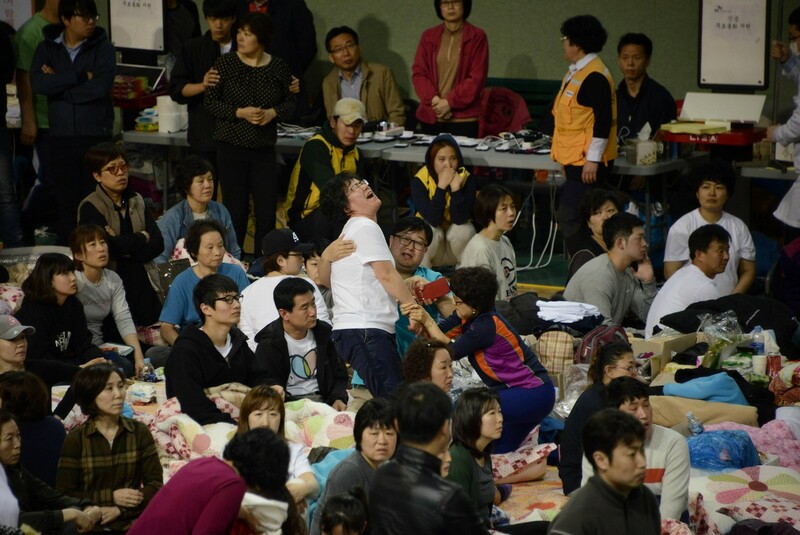 Nine victims of the disaster remained unaccounted for. 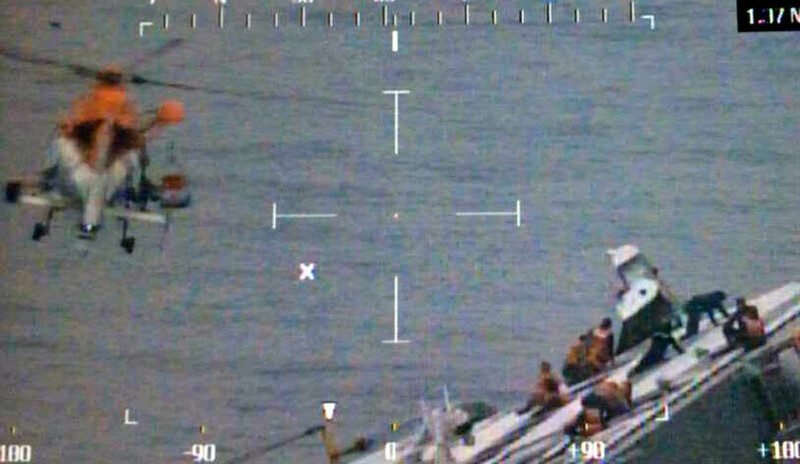 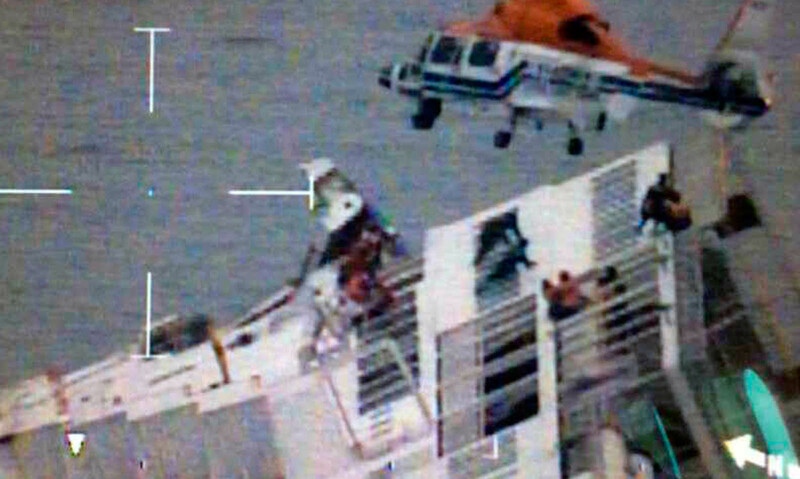 More than 50 people have been put on trial on charges linked to the sinking, including 15 crew members who were among the first to climb into lifeboats. 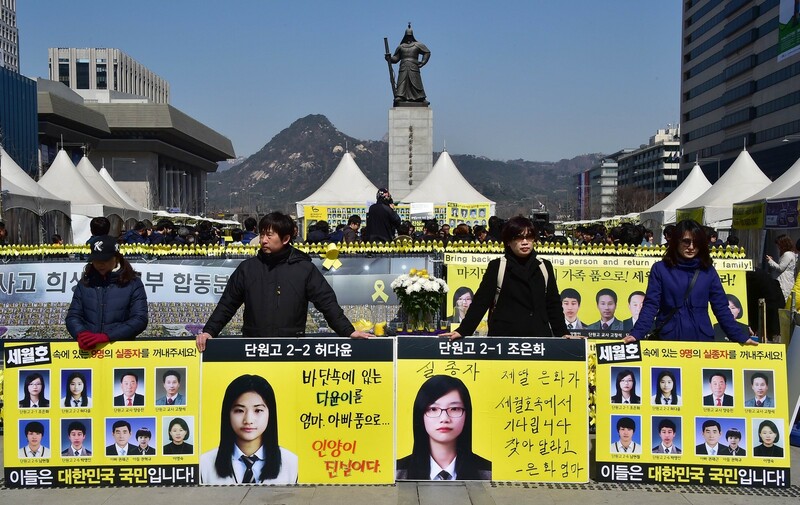 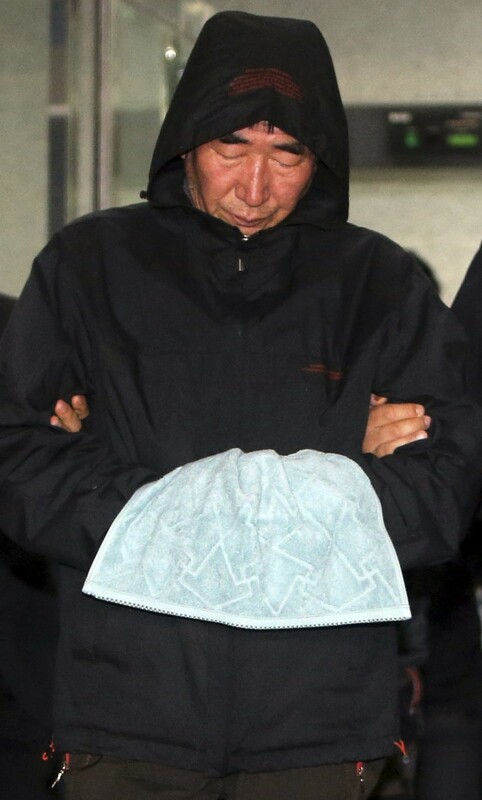 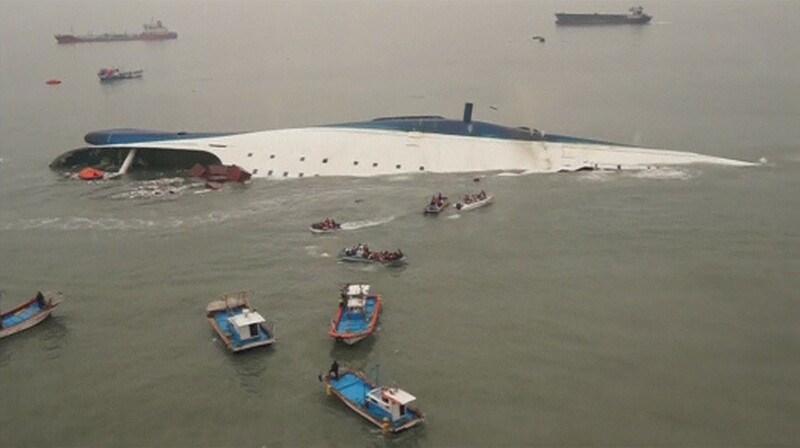 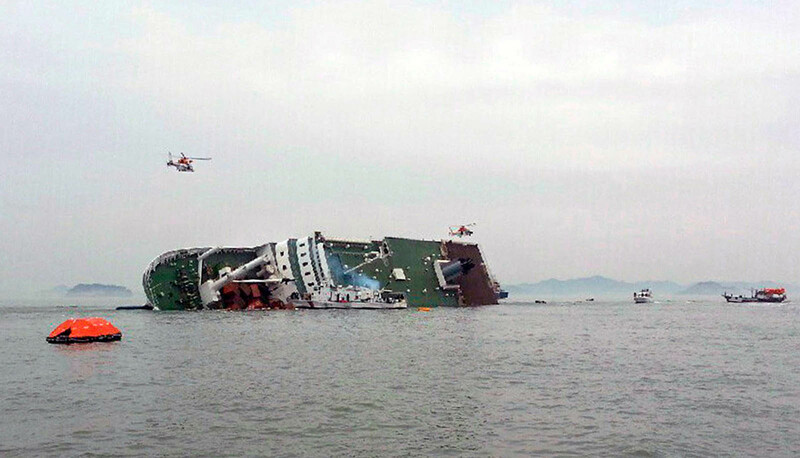 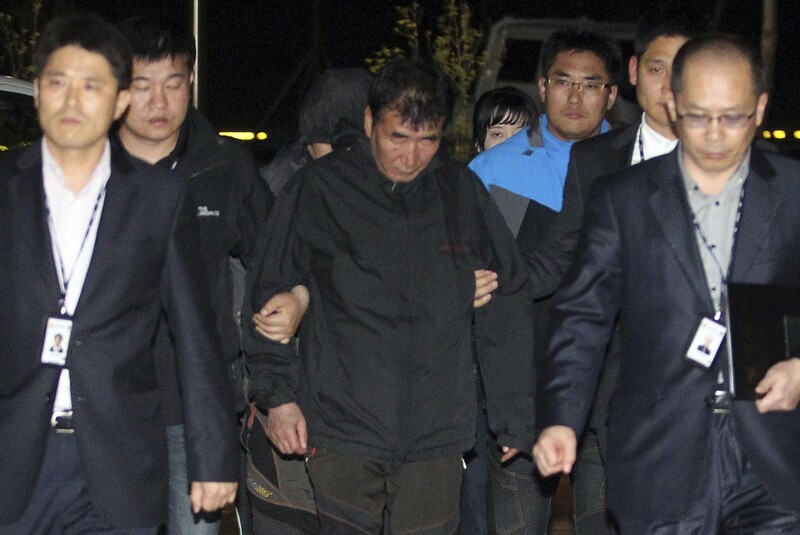 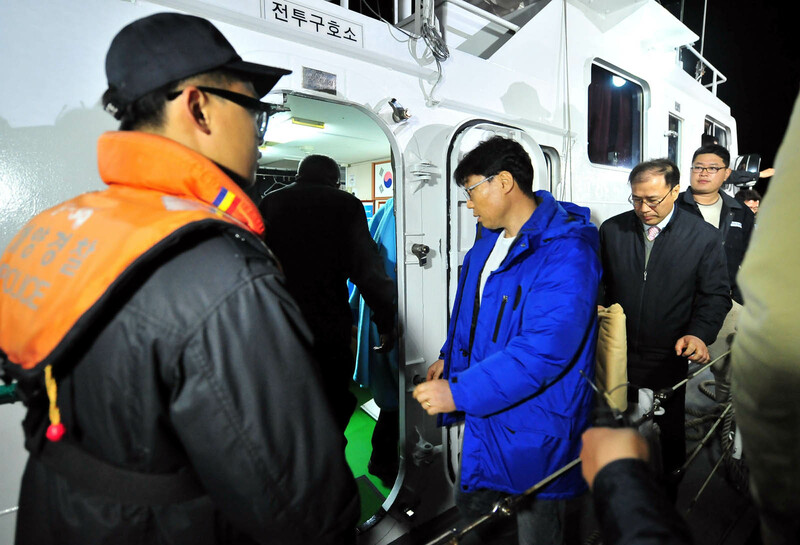 The Sewol's captain was jailed in November for 36 years for gross negligence and dereliction of duty, while three other senior crew members were sentenced to jail terms of between 15 and 30 years. 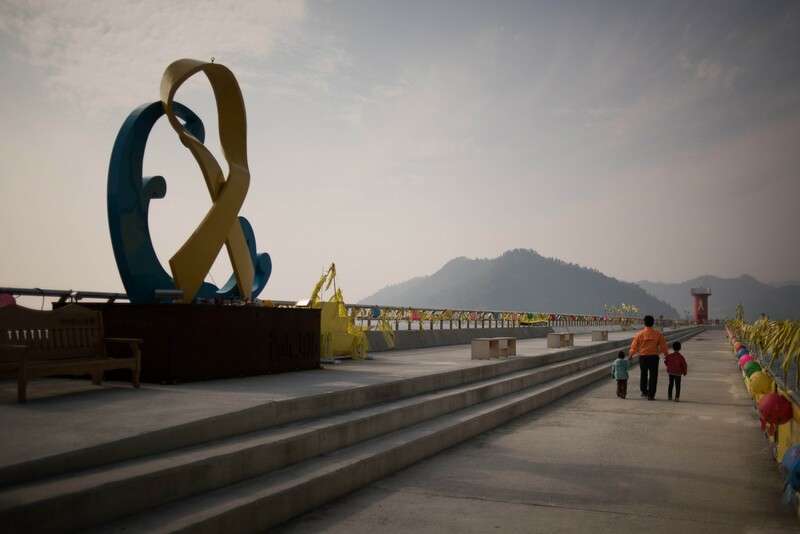 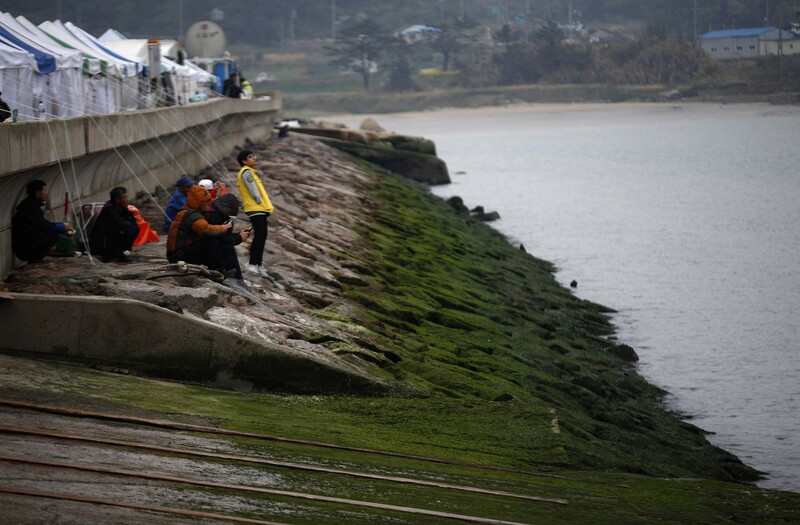 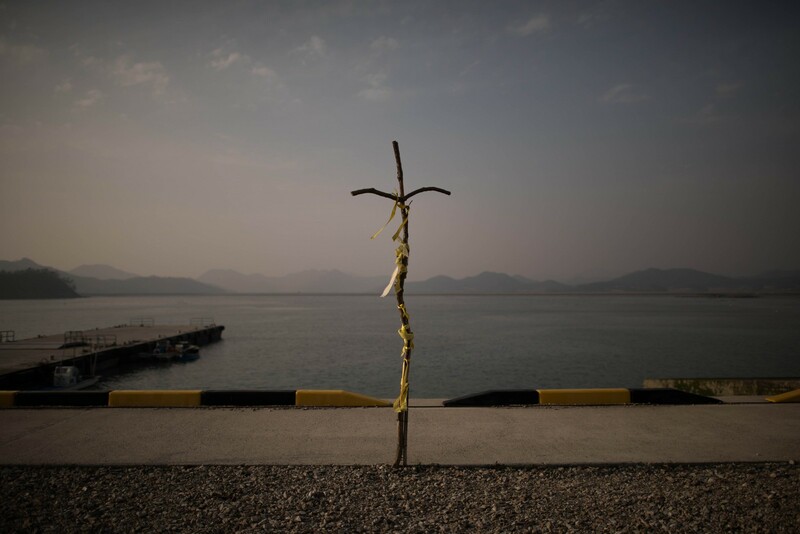 In a photo taken on March 20, 2015 a man walks with his children along a pier covered with tributes to the victims of the Sewol ferry, at Paengmok harbour on Jindo island, on the southern tip of the South Korean peninsula. 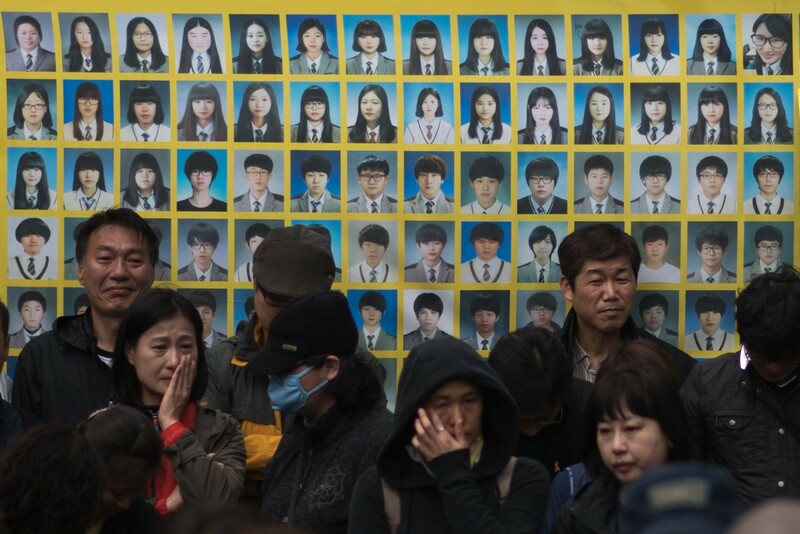 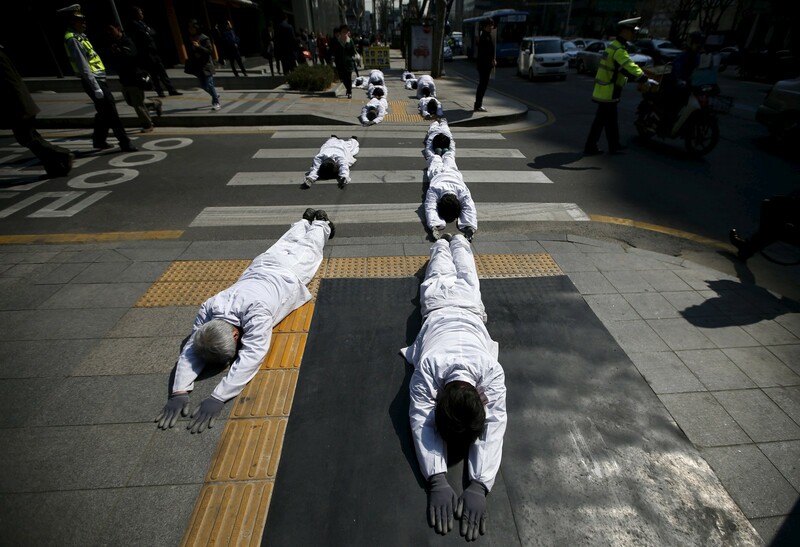 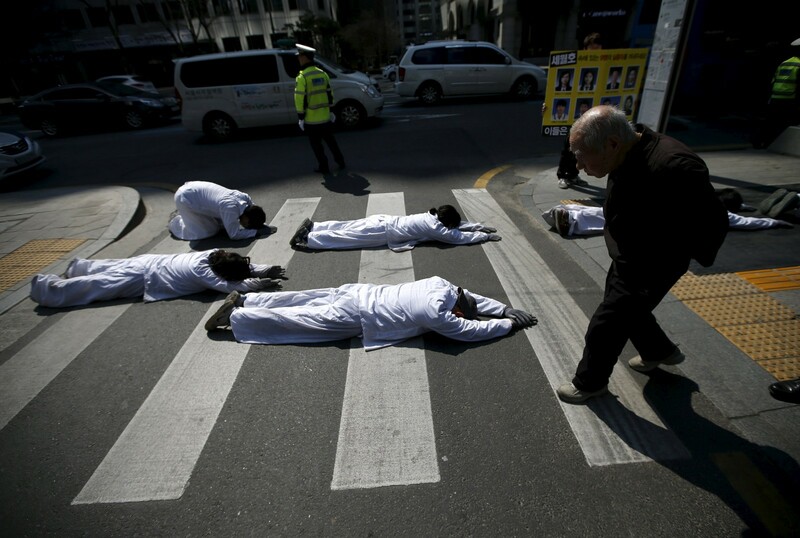 Pedestrians walk past portraits of the victims of the sunken South Korean ferry "Sewol" at Gwanghwamun square where relatives of the victims have been sitting in protest against the government.